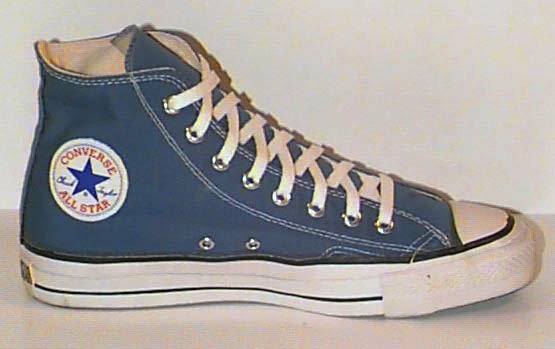 Photo gallery of assorted models of blue high top chucks. 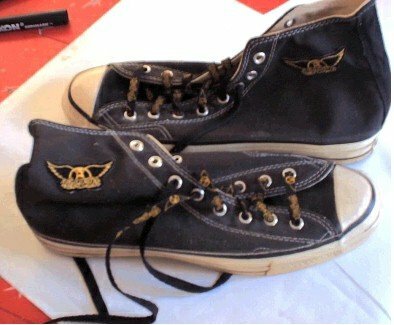 1 Blue High Top Chucks Side view of Aerosmith high tops. 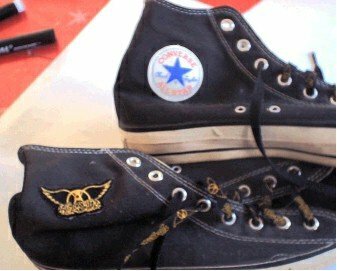 2 Blue High Top Chucks Top view of Aerosmith high tops. 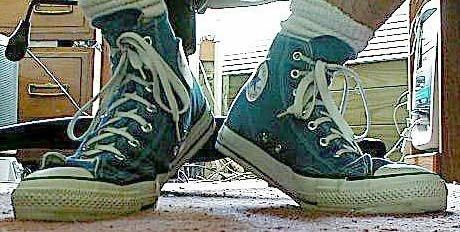 3 Blue High Top Chucks Closeup of the laces on an Aerosmith high top. 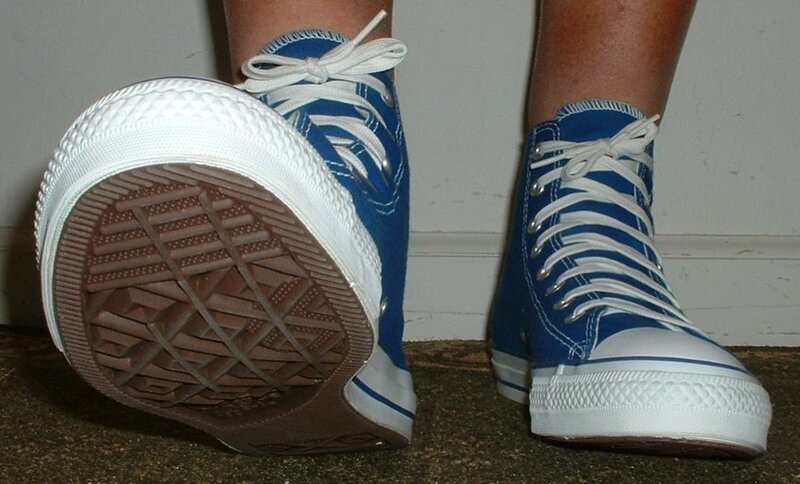 4 Blue High Top Chucks Wearing Blue Danube high tops, top view shot 1. 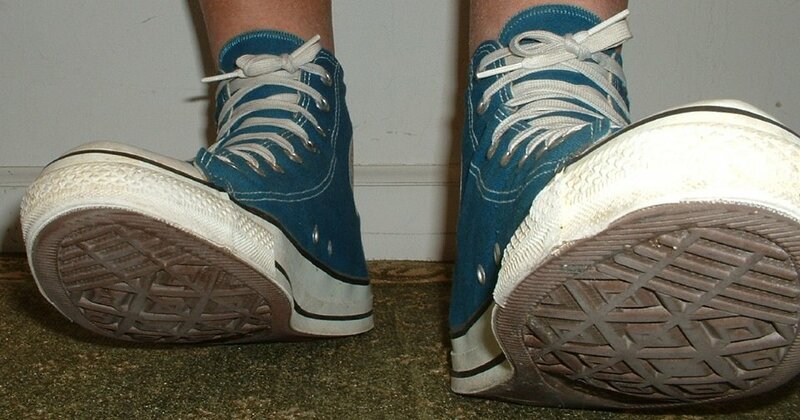 5 Blue High Top Chucks Wearing Blue Danube high tops, top view shot 2. 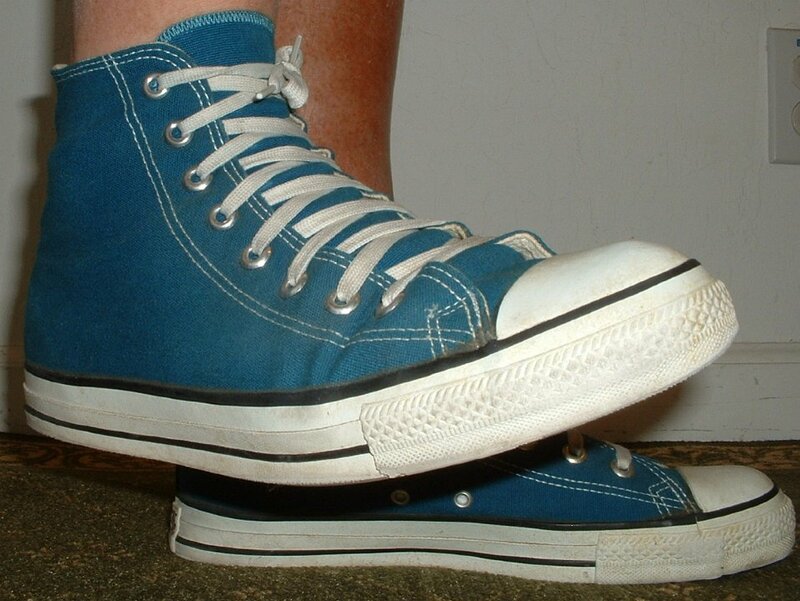 6 Blue High Top Chucks Wearing Blue Danube high tops, side view shot 1. 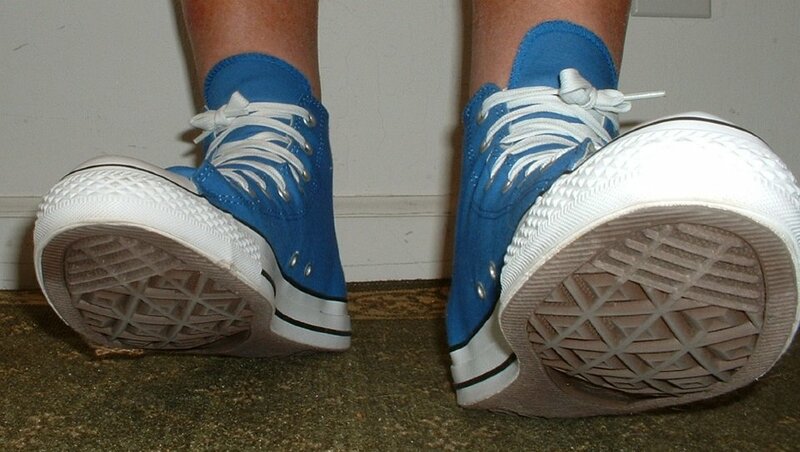 7 Blue High Top Chucks Wearing Blue Danube high tops, top view shot 3. 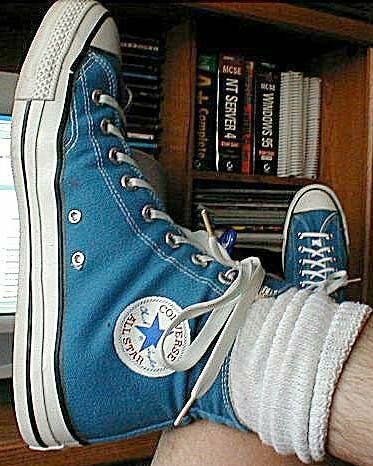 8 Blue High Top Chucks Wearing Blue Danube high tops, side view shot 2. 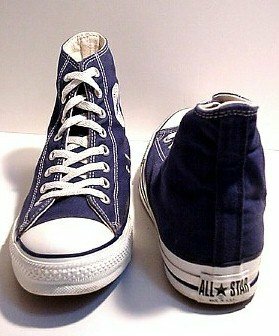 9 Blue High Top Chucks Navy blue high top with manufacturing error, shot 1. 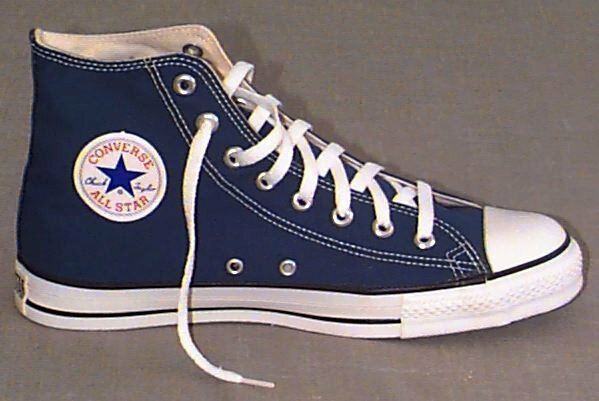 10 Blue High Top Chucks Navy blue high top with manufacturing error, shot 2. 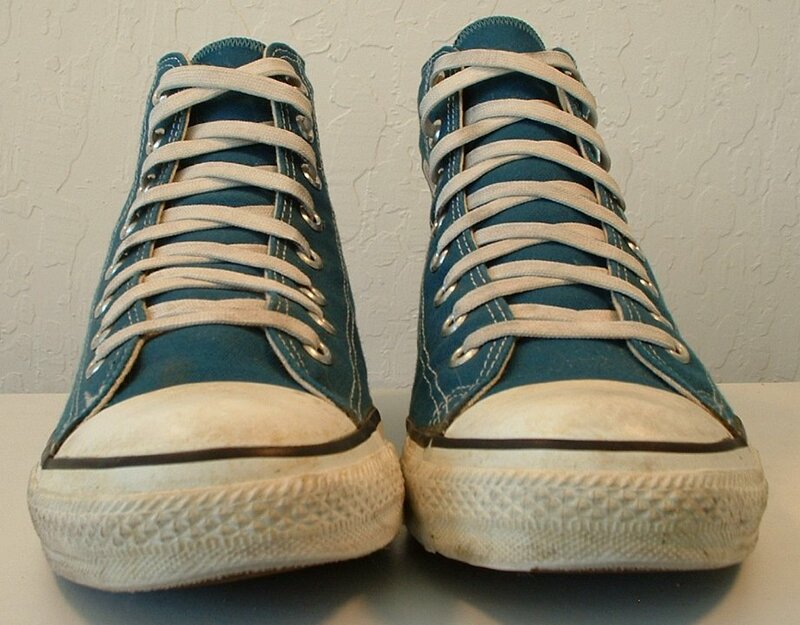 11 Blue High Top Chucks Worn blue felt high tops, top view. 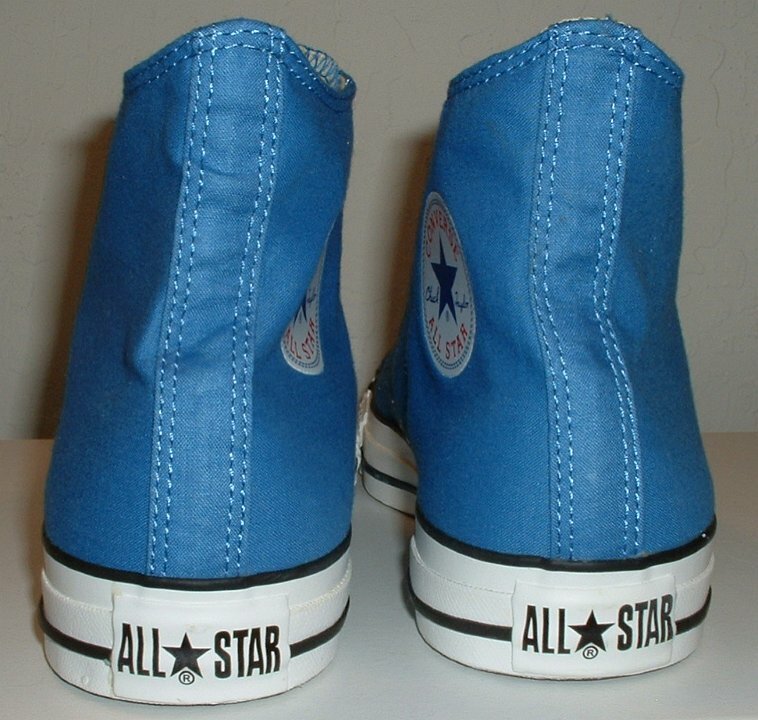 12 Blue High Top Chucks Worn left blue felt high top, inside patch view. 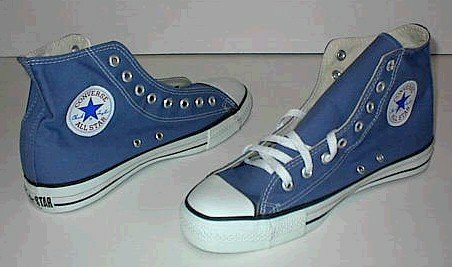 13 Blue High Top Chucks Blue zipzag pattern high tops with fabric ankle patch, inside patch and partial top view. 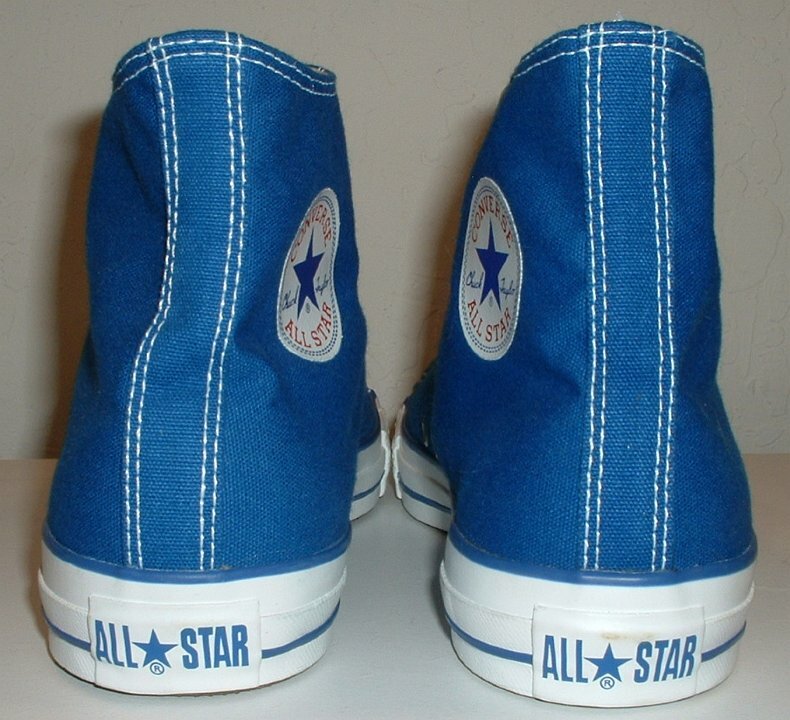 14 Blue High Top Chucks Blue zipzag pattern high tops with fabric ankle patch; inside patch views. 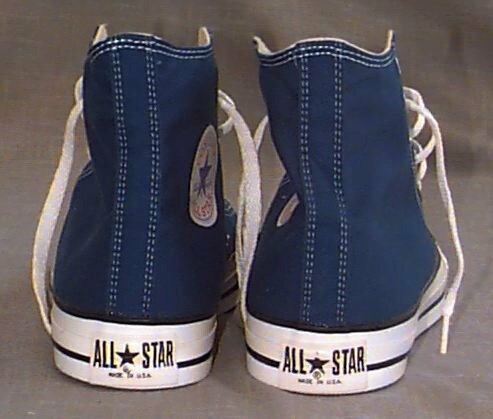 15 Blue High Top Chucks Blue zipzag pattern high tops with fabric ankle patch, rear and unlaced front view. 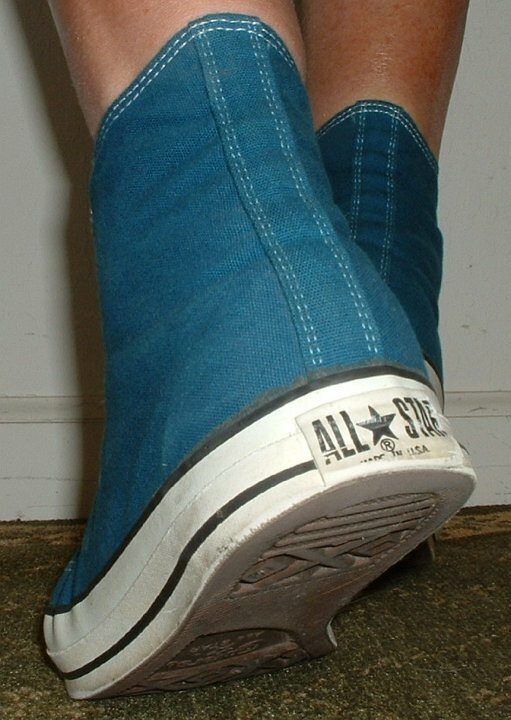 16 Blue High Top Chucks Left blue zipzag pattern high top with fabric ankle patch, inside patch view. 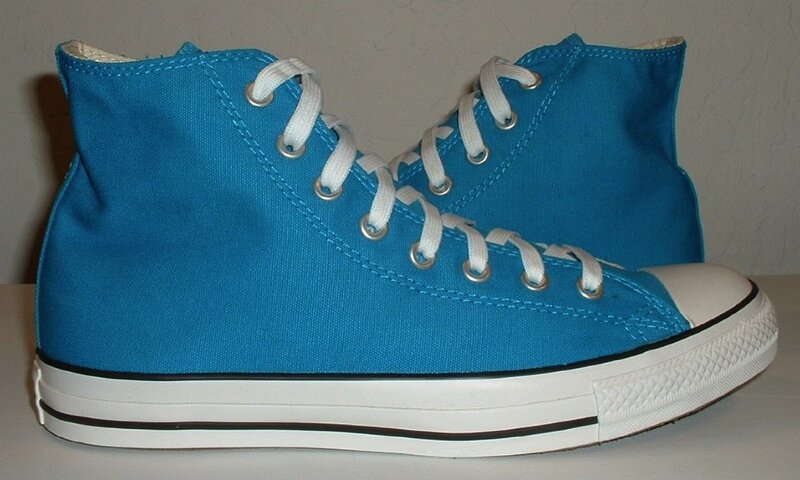 17 Blue High Top Chucks Brand new bright blue high tops with box, inside patch and sole views. 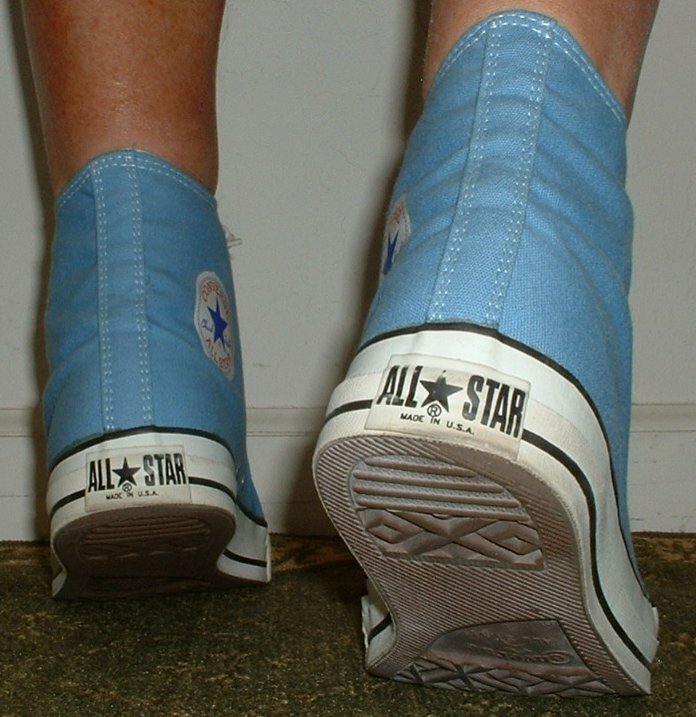 18 Blue High Top Chucks Angled inside patch view of bright blue high tops. 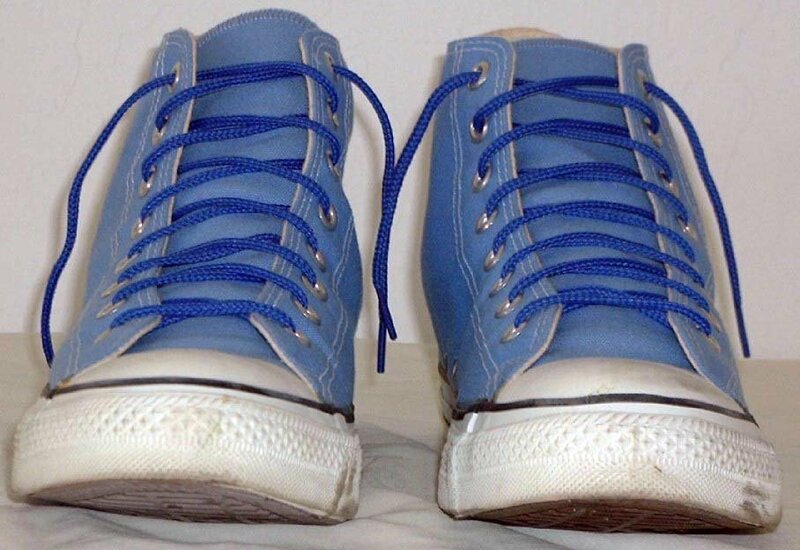 19 Blue High Top Chucks Rear and front view of unlaced bright blue high tops. 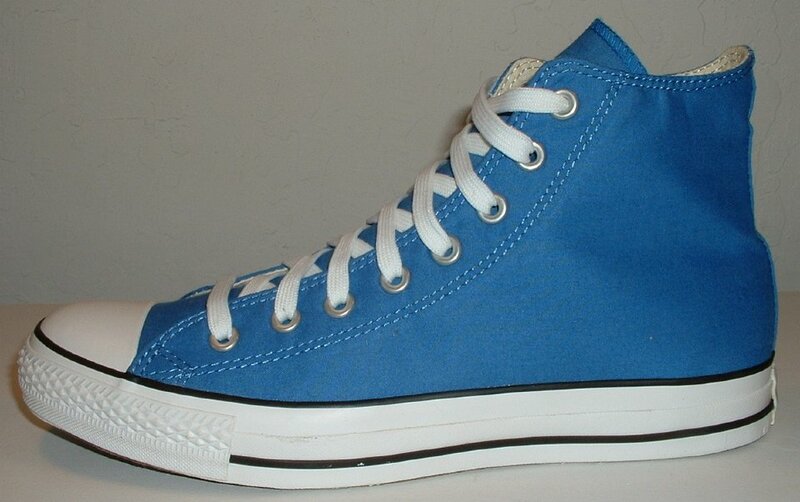 24 Blue High Top Chucks Inside patch views of new bright blue high tops. 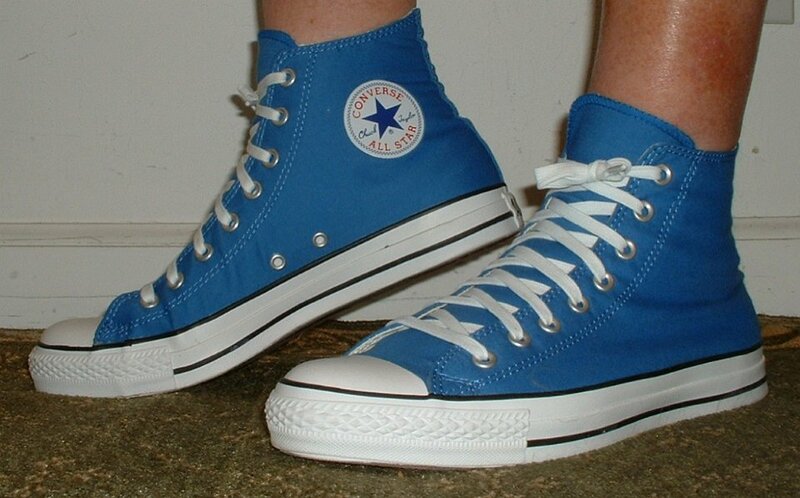 25 Blue High Top Chucks Angled side view of bright blue high tops. 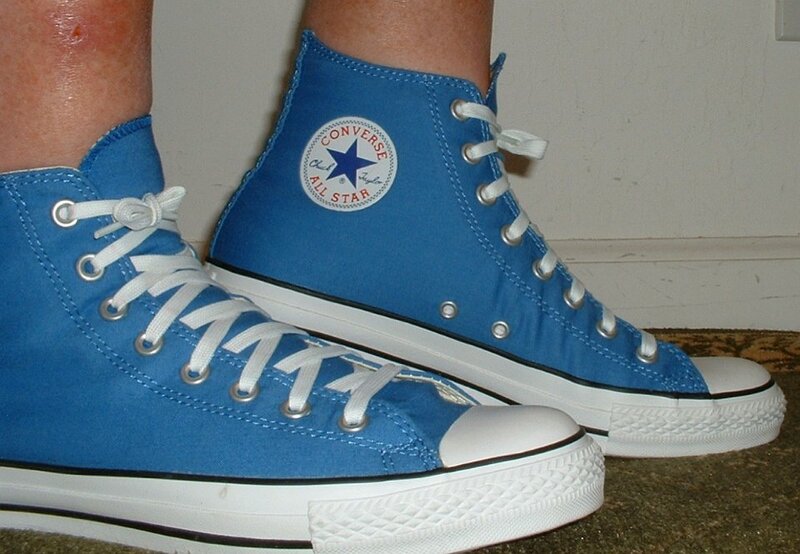 26 Blue High Top Chucks Angled side and top views of bright blue high tops. 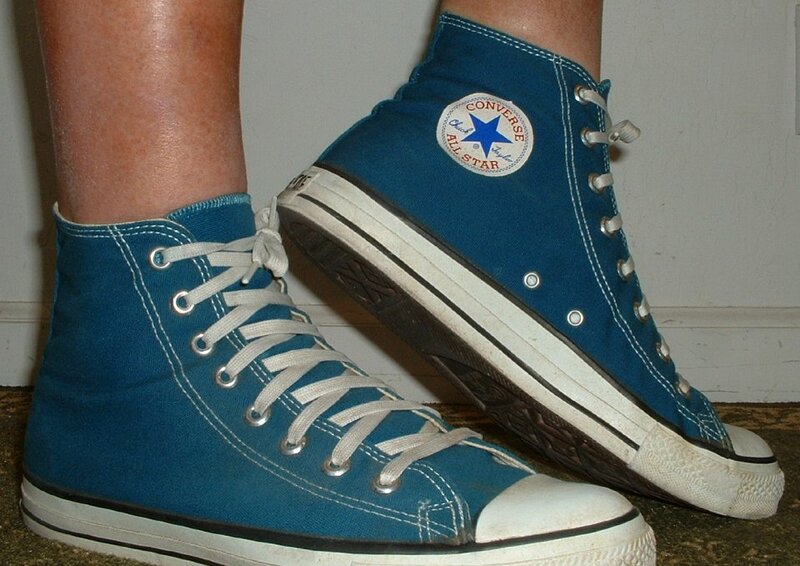 27 Blue High Top Chucks Angled side views of bright blue high tops. 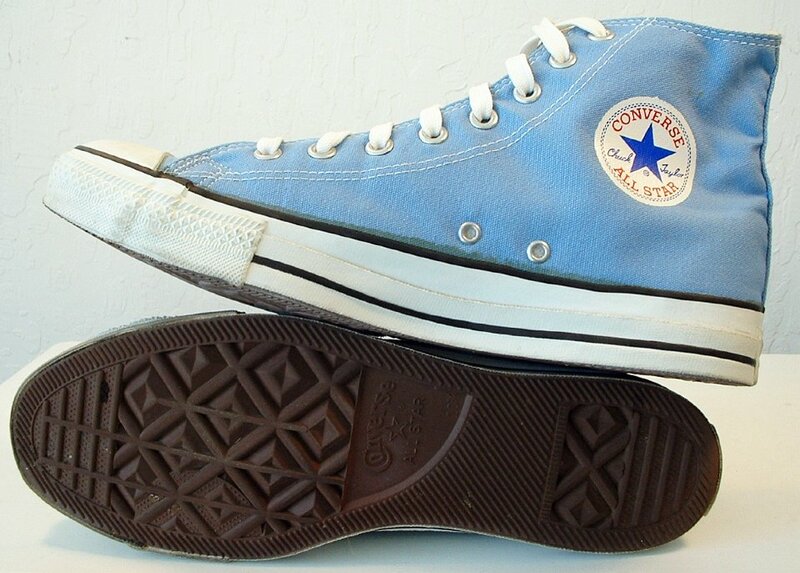 29 Blue High Top Chucks Inside patch view of a right caribbean blue high top. 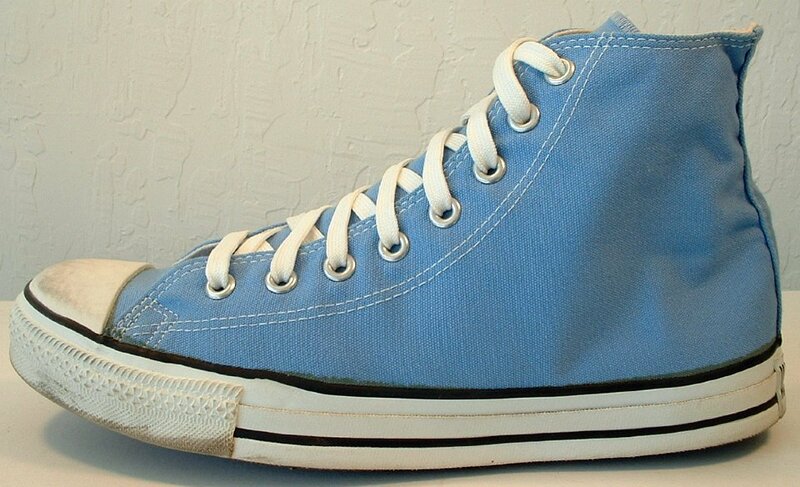 30 Blue High Top Chucks Outside view of a right caribbean blue high top. 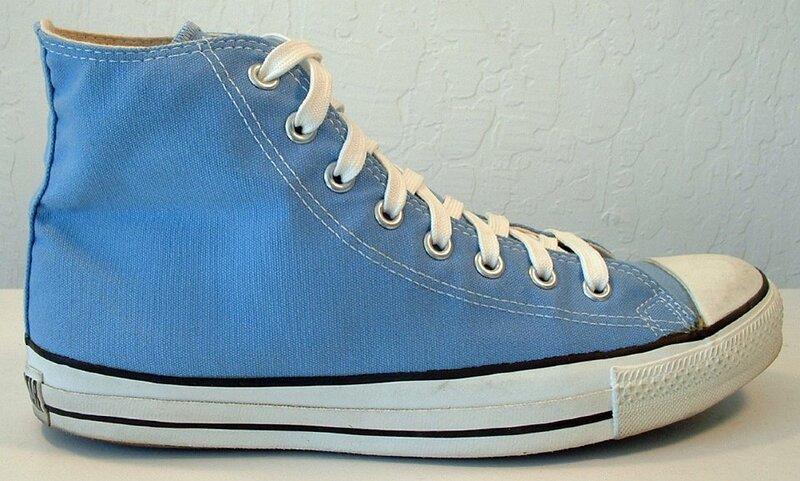 31 Blue High Top Chucks Inside patch view of a left caribbean blue high top. 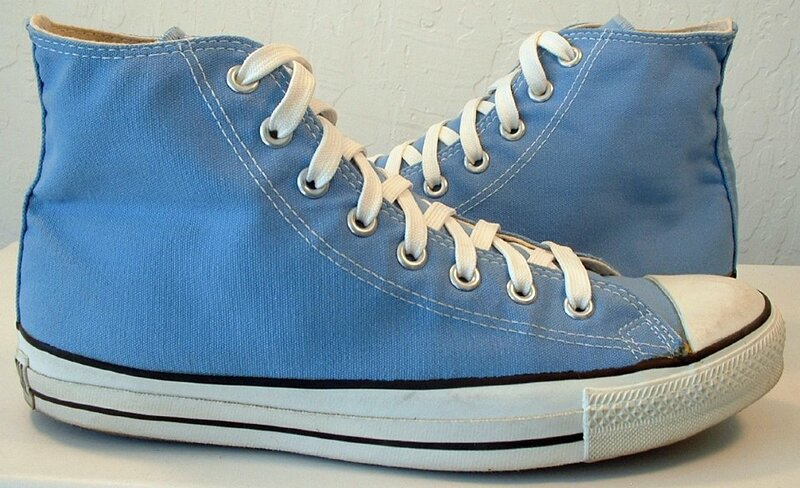 32 Blue High Top Chucks Outside view of a left caribbean blue high top. 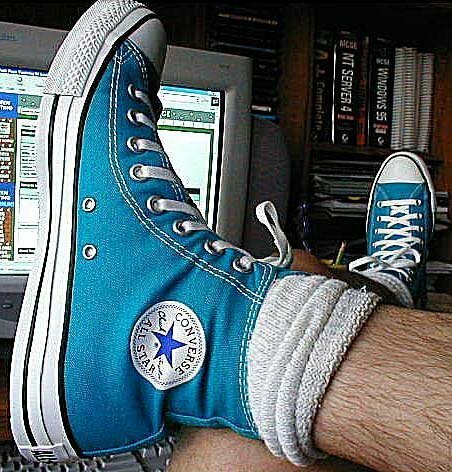 33 Blue High Top Chucks Rear view of caribbean blue high tops. 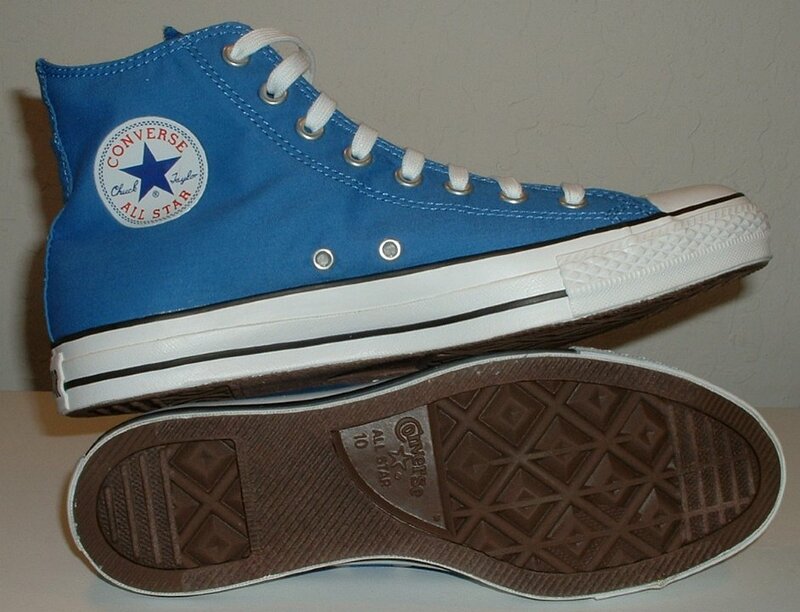 34 Blue High Top Chucks Angled rear view of caribbean blue high tops. 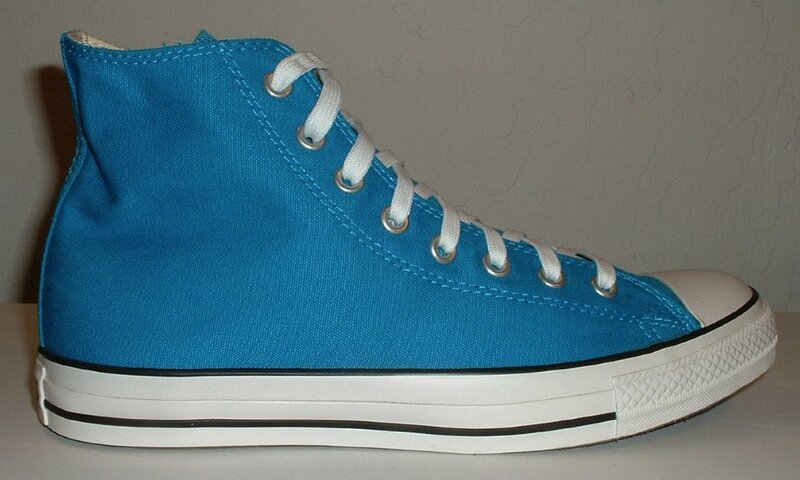 35 Blue High Top Chucks Angled side view of caribbean blue high tops. 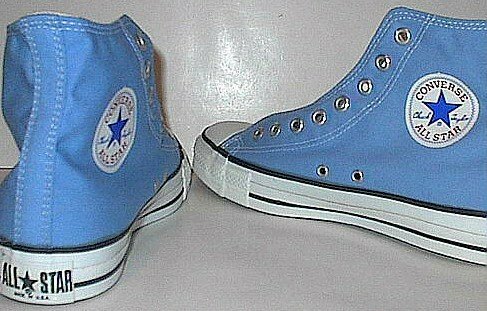 36 Blue High Top Chucks Front view of caribbean blue high tops. 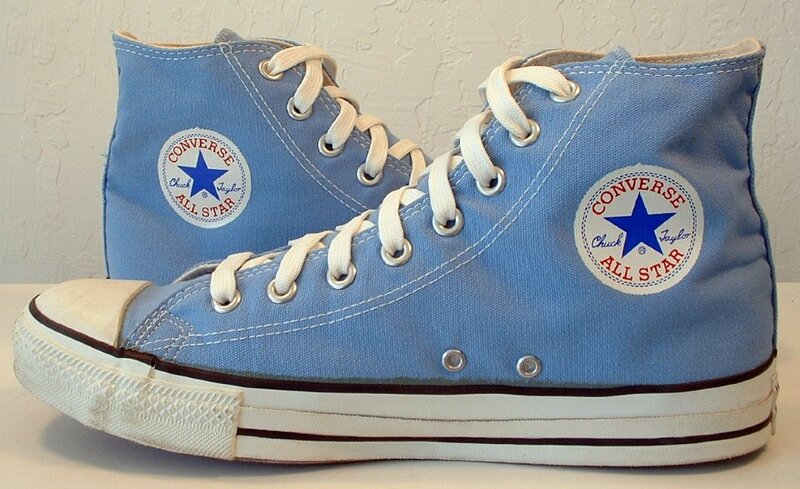 37 Blue High Top Chucks Inside patch views of caribbean blue high tops. 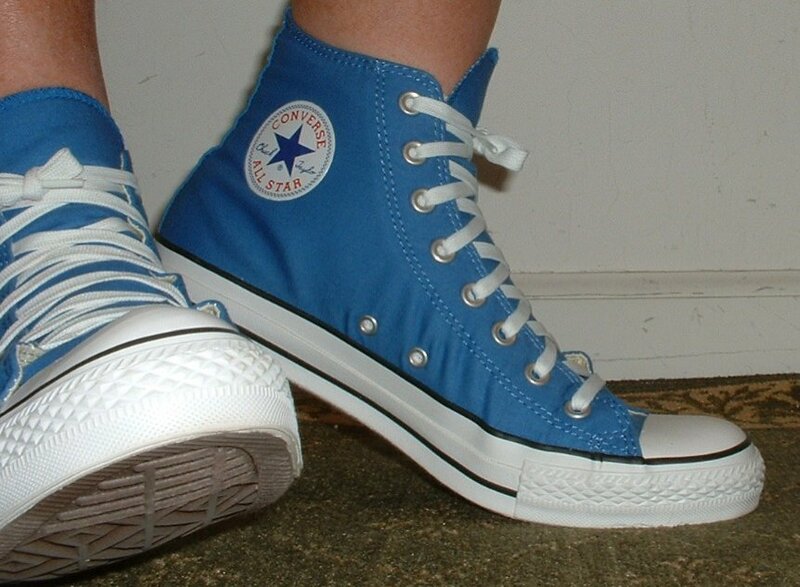 38 Blue High Top Chucks Top view of caribbean blue high tops. 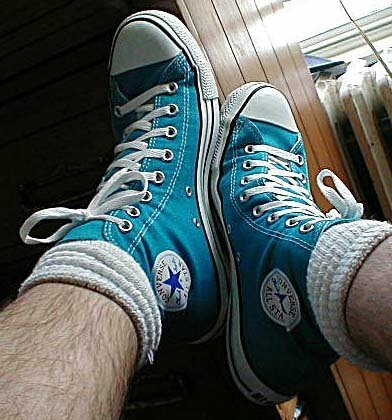 39 Blue High Top Chucks Inside patch views of caribbean blue high tops. 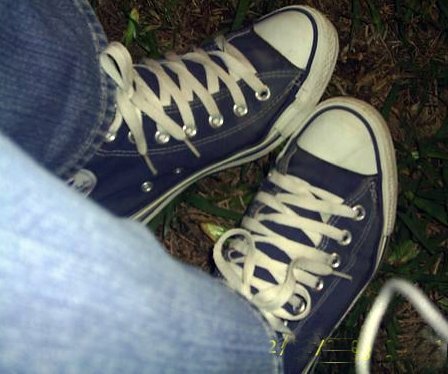 40 Blue High Top Chucks Outside views of caribbean blue high tops. 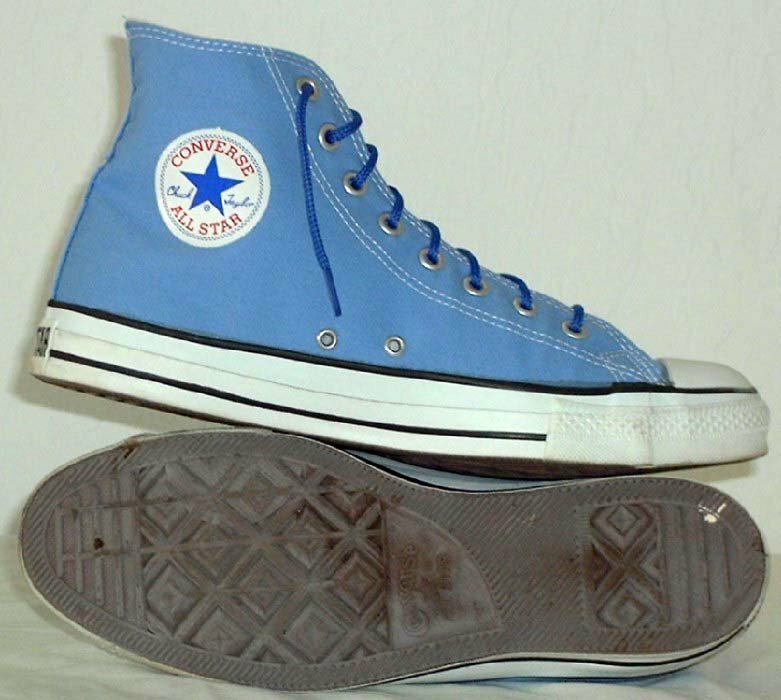 41 Blue High Top Chucks Inside patch and sole views of caribbean blue high tops. 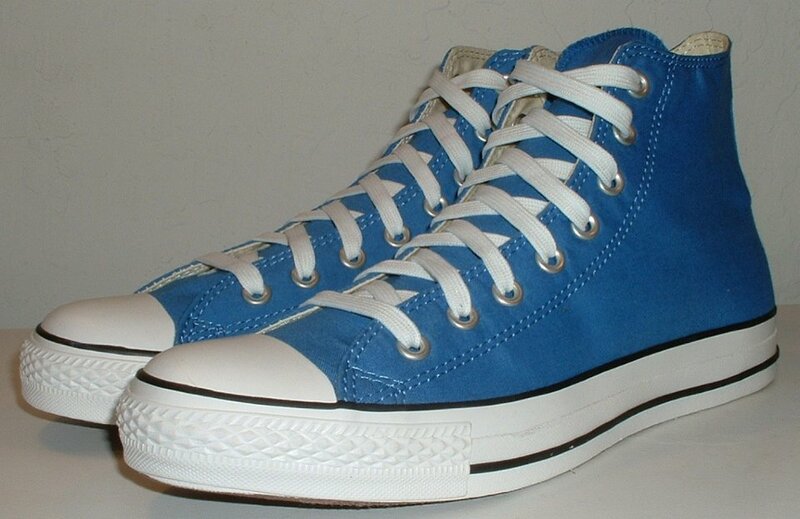 43 Blue High Top Chucks Wearing caribbean blue high tops, front view shot 2. 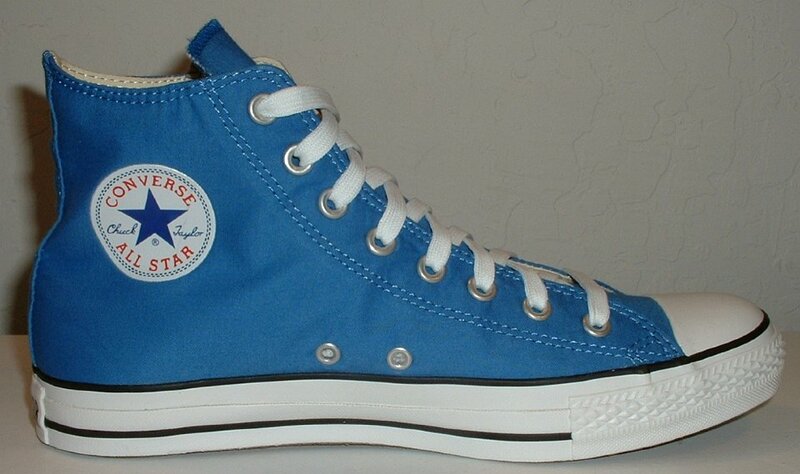 44 Blue High Top Chucks Wearing caribbean blue high tops, front view shot 3. 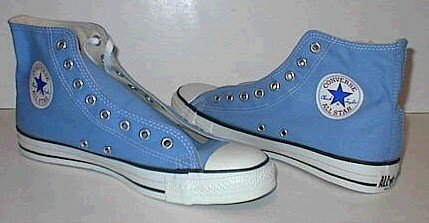 45 Blue High Top Chucks Wearing caribbean blue high tops, front view shot 4. 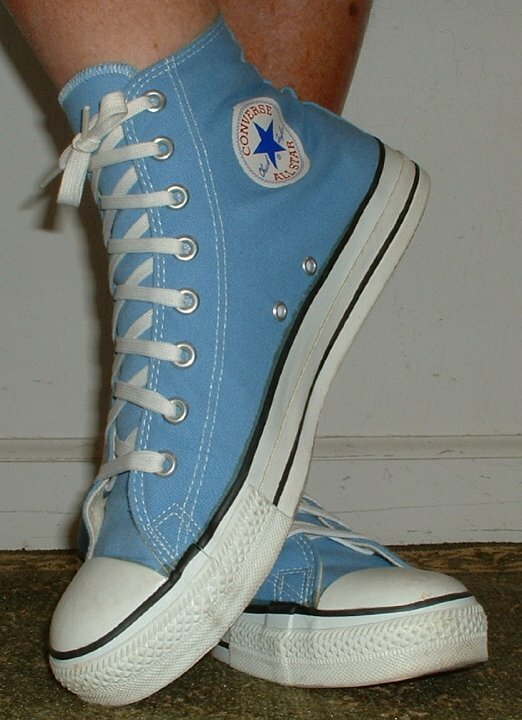 46 Blue High Top Chucks Wearing caribbean blue high tops; front view shot 5. 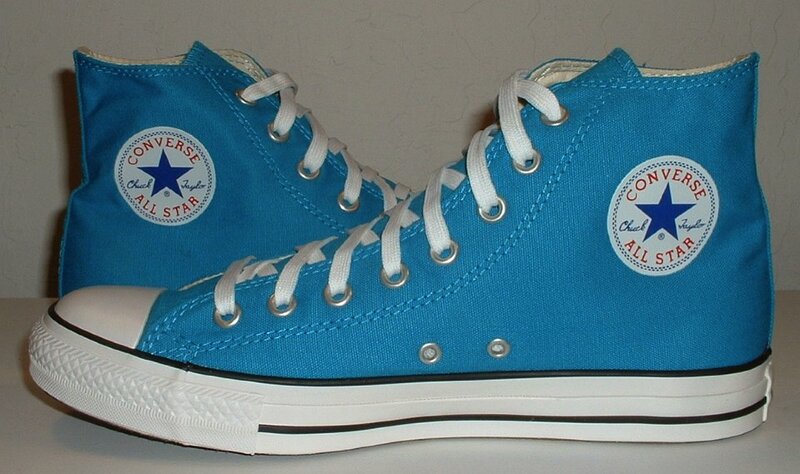 47 Blue High Top Chucks Wearing caribbean blue high tops, front view shot 6. 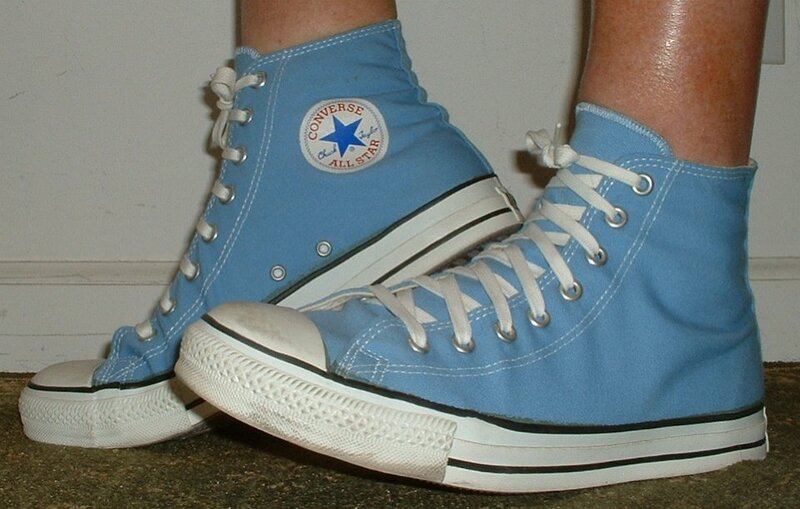 48 Blue High Top Chucks Wearing caribbean blue high tops, front view shot 7. 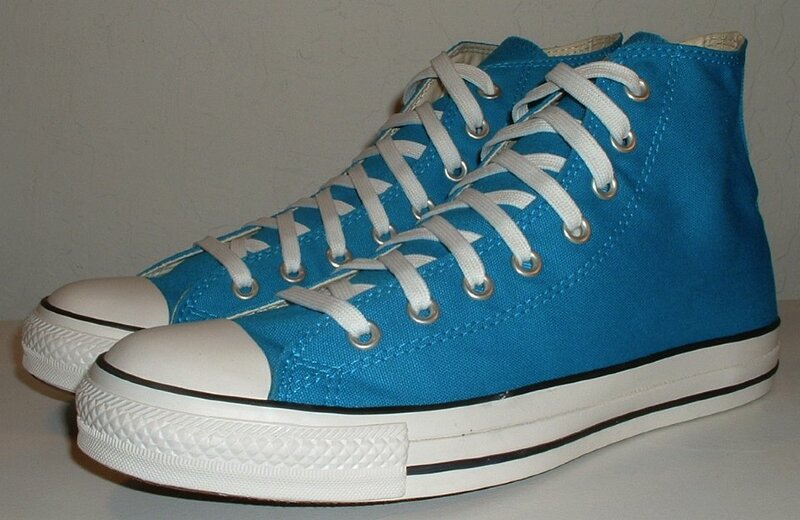 49 Blue High Top Chucks Wearing caribbean blue high tops, left side view shot 1. 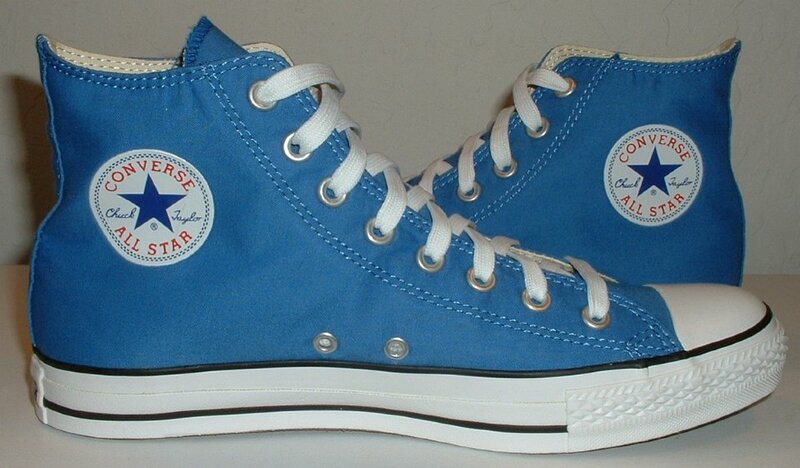 52 Blue High Top Chucks Wearing caribbean blue high tops, rear view shot 1. 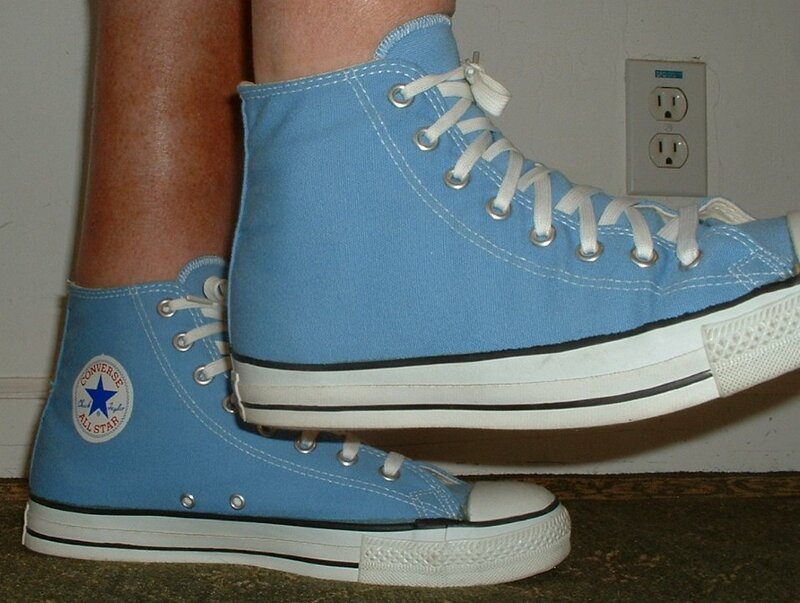 53 Blue High Top Chucks Wearing caribbean blue high tops, rear view shot 2. 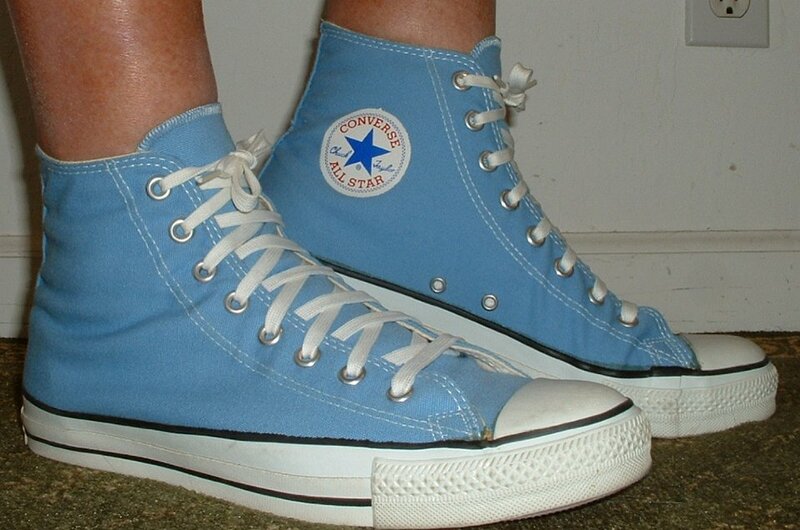 54 Blue High Top Chucks Wearing caribbean blue high tops, rear view shot 3. 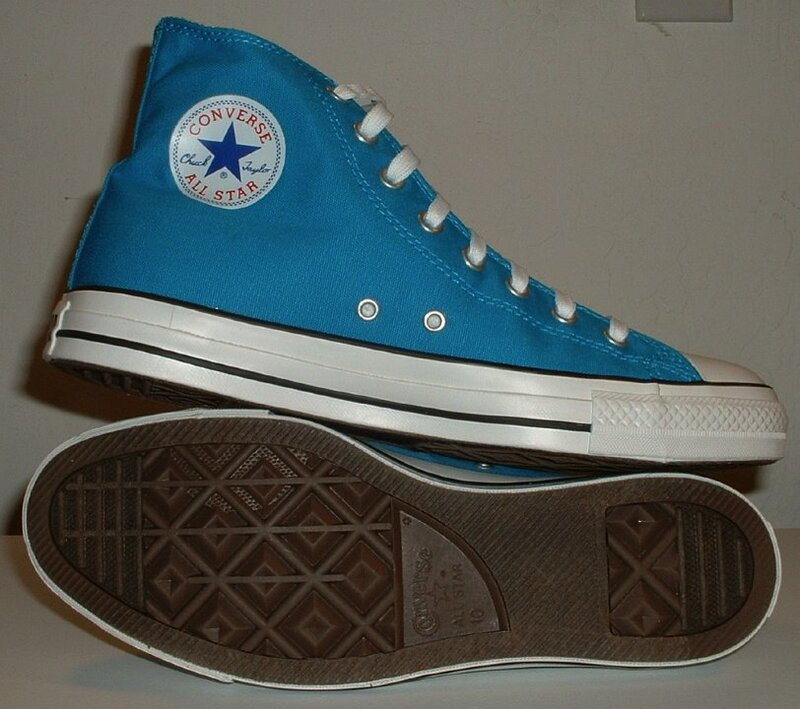 55 Blue High Top Chucks Wearing caribbean blue high tops, rear view shot 4. 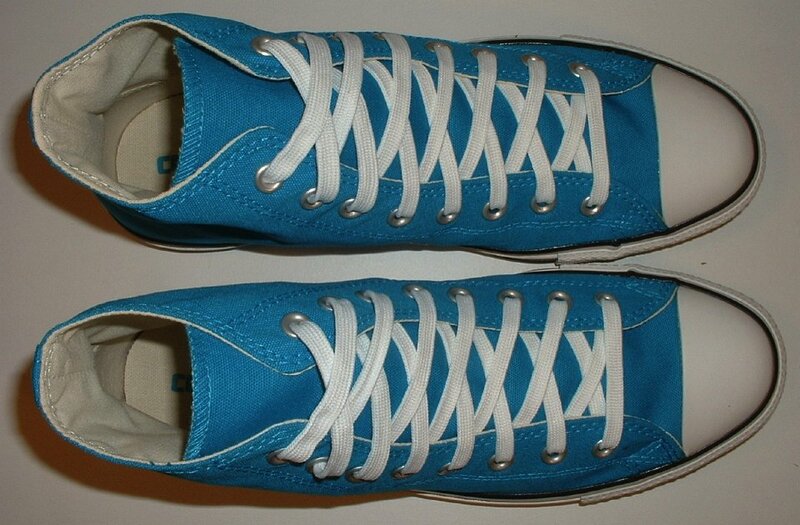 56 Blue High Top Chucks Wearing caribbean blue high tops, right side view shot 1. 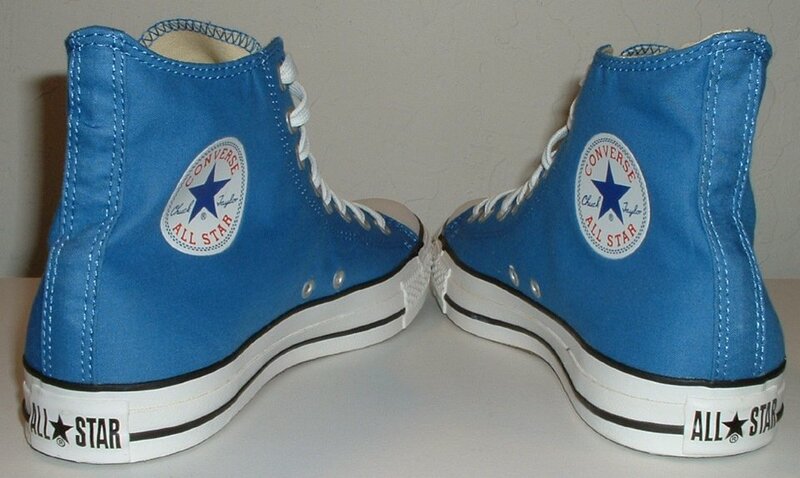 57 Blue High Top Chucks Wearing caribbean blue high tops, right side view shot 2. 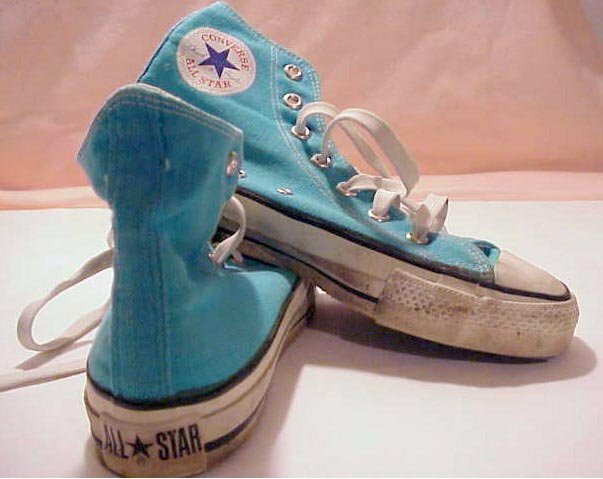 58 Blue High Top Chucks Wearing caribbean blue high tops, right side view shot 3. 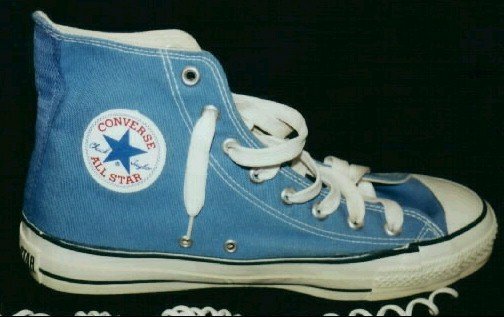 59 Blue High Top Chucks Wearing caribbean blue high tops, right side view shot 4. 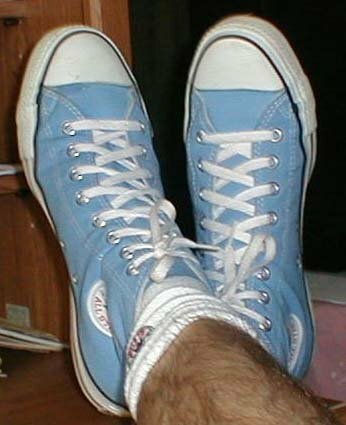 60 Blue High Top Chucks Wearing caribbean blue high tops, top view. 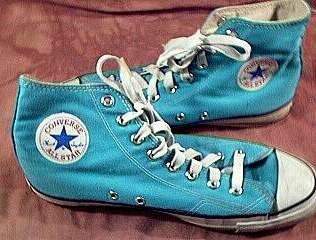 61 Blue High Top Chucks Wearing Caribbean Blue High Tops, shot 1. 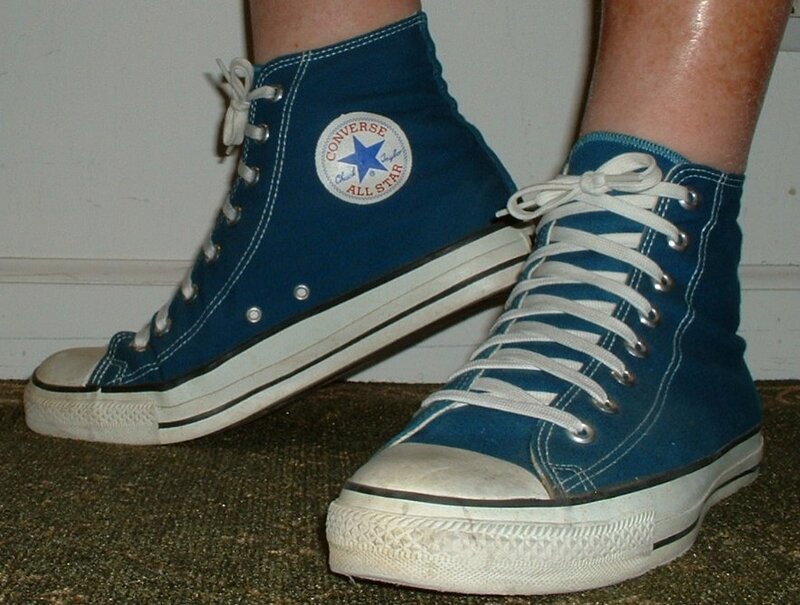 62 Blue High Top Chucks Wearing Caribbean Blue High Tops, shot 2. 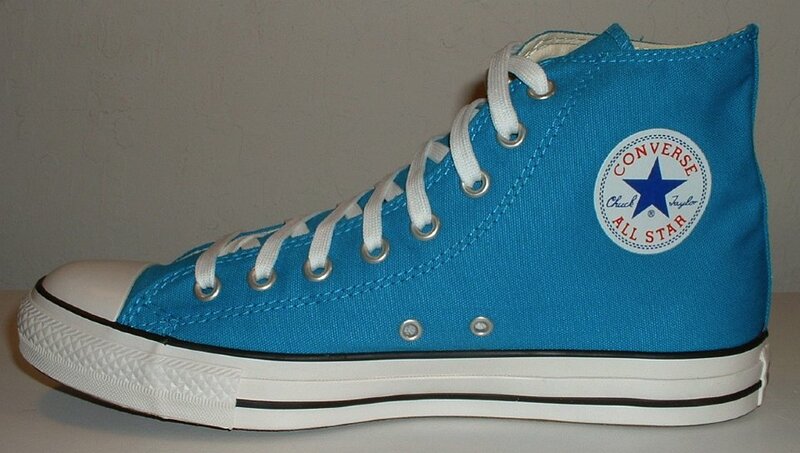 63 Blue High Top Chucks Wearing Caribbean Blue high tops, top and inside patch view. 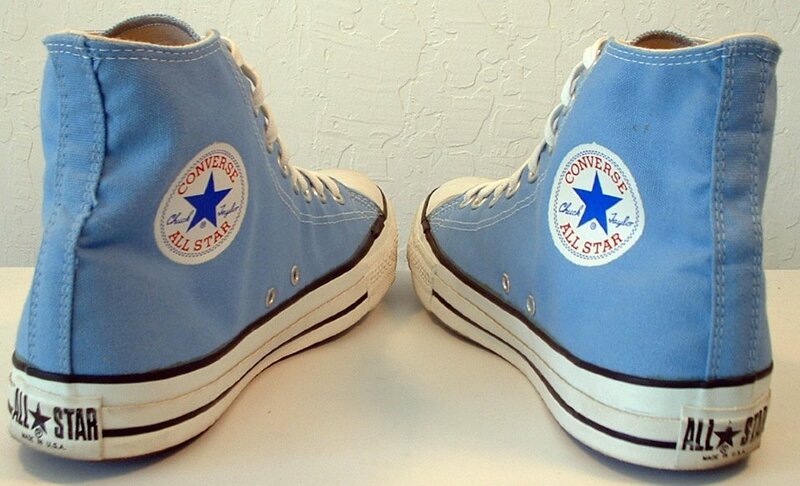 64 Blue High Top Chucks Wearing vintage Caribbean Blue high tops, front and inside patch view. 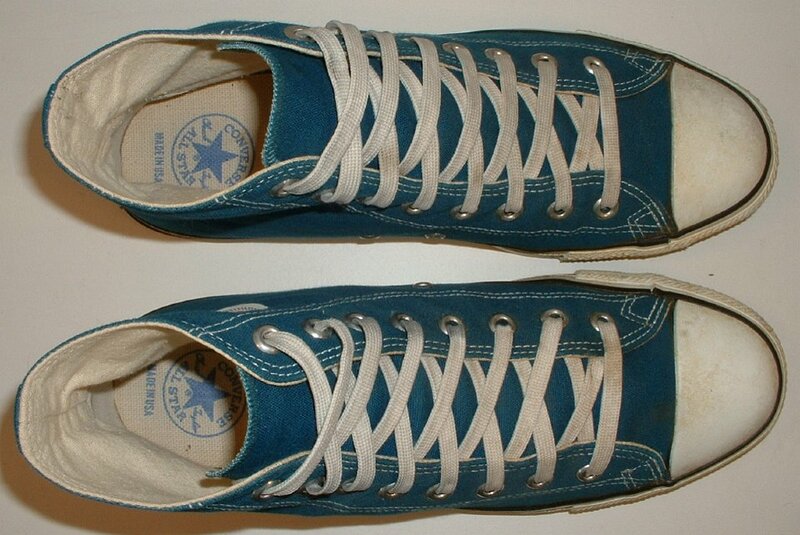 65 Blue High Top Chucks Wearing vintage Caribbean Blue high tops, inside patch view. 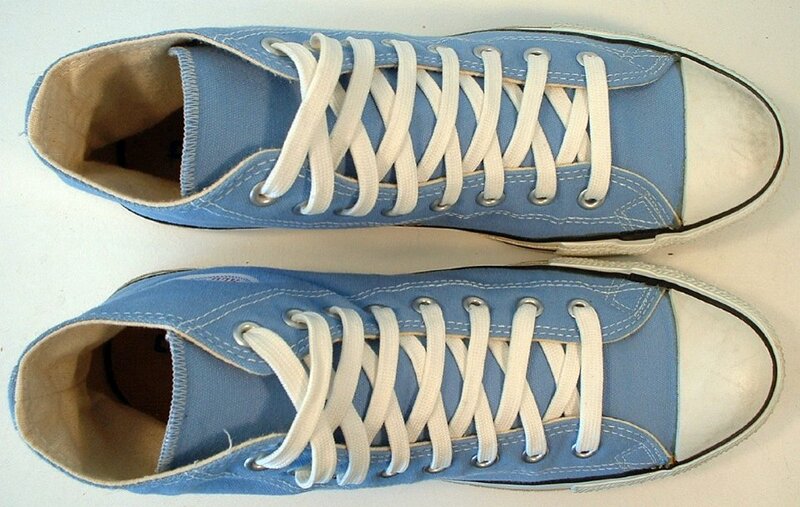 66 Blue High Top Chucks Navy and Carolina blue fold over high top with wide sky blue laces. 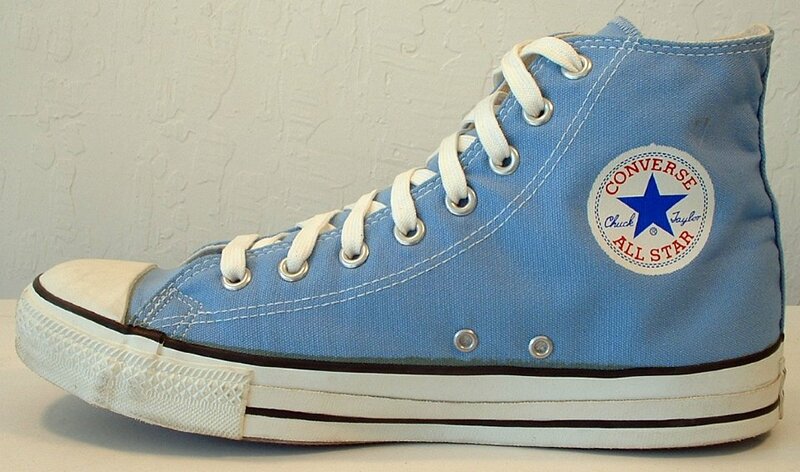 67 Blue High Top Chucks Angled inside patch view of a left China Blue high top. 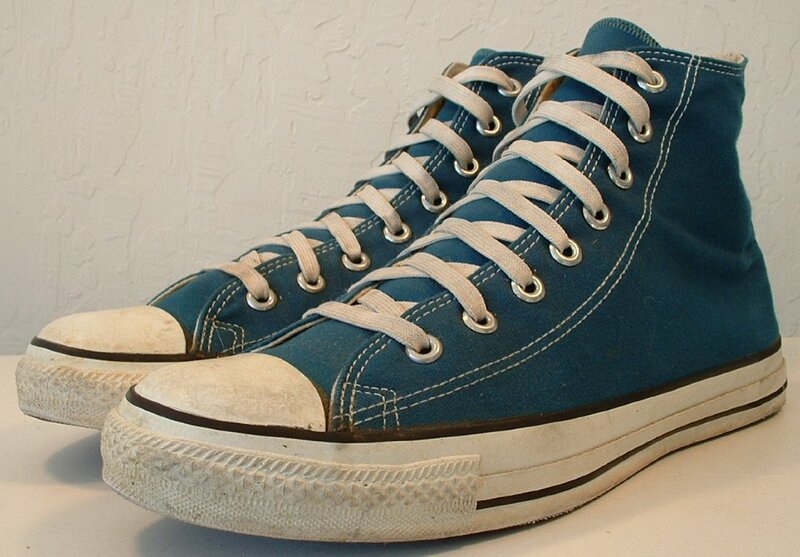 68 Blue High Top Chucks Unlaced new cobalt blue high tops, inside patch views. 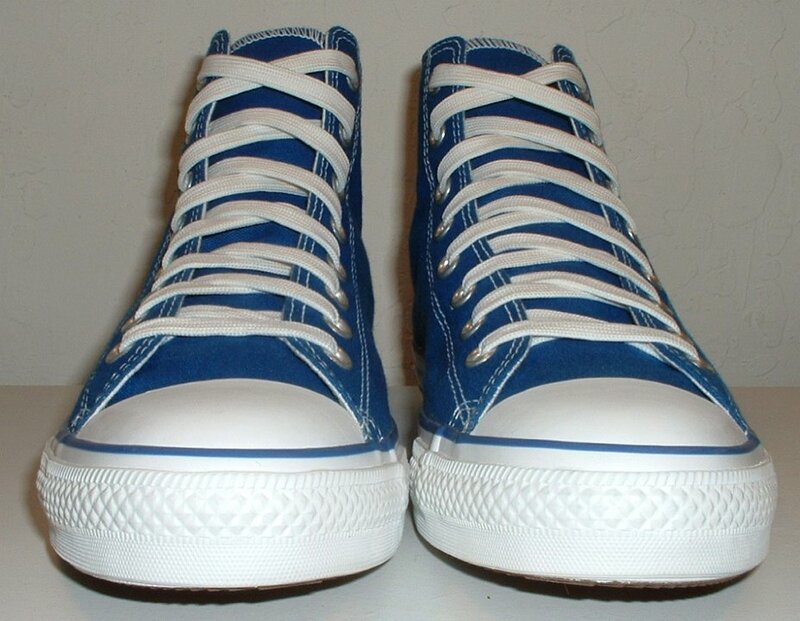 69 Blue High Top Chucks Unlaced new cobalt blue high tops, rear view. 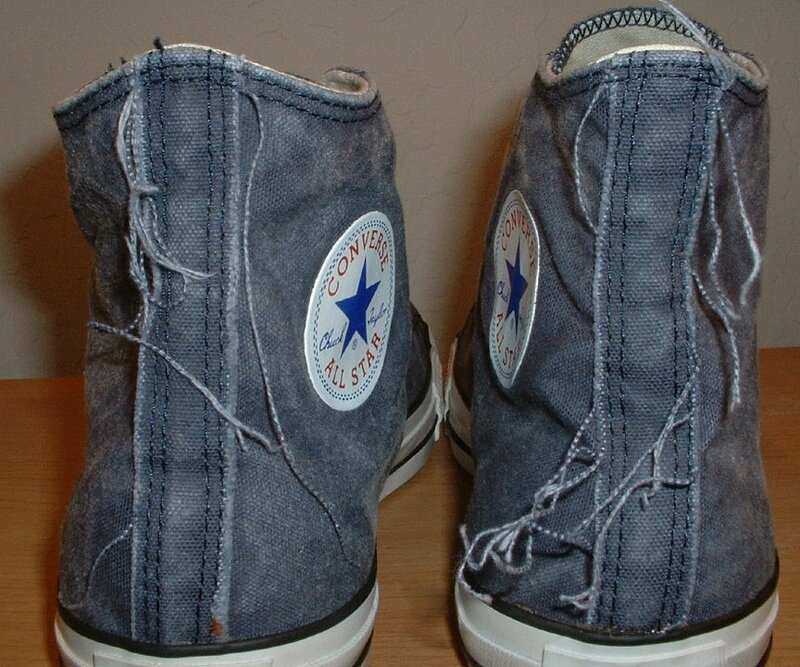 70 Blue High Top Chucks Inside patch view of a right distressed blue high top. 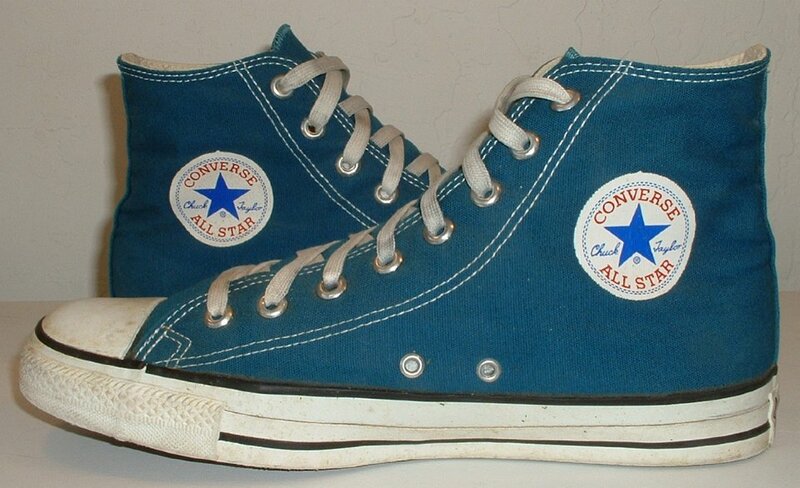 71 Blue High Top Chucks Outside view of a right distressed blue high top. 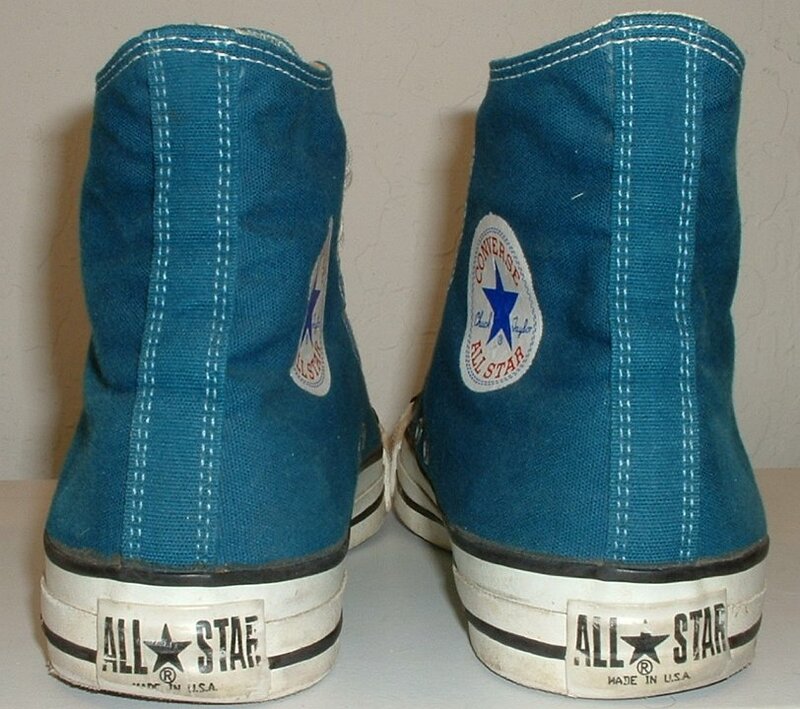 72 Blue High Top Chucks Inside patch view of a left distressed blue high top. 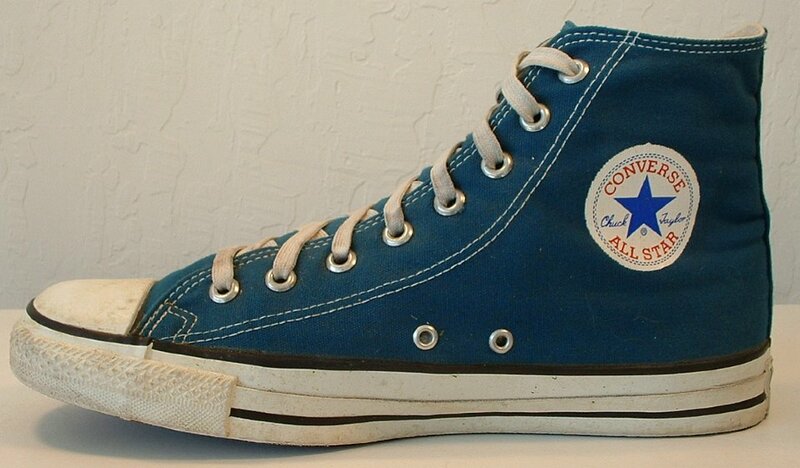 73 Blue High Top Chucks Outside view of a left distressed blue high top. 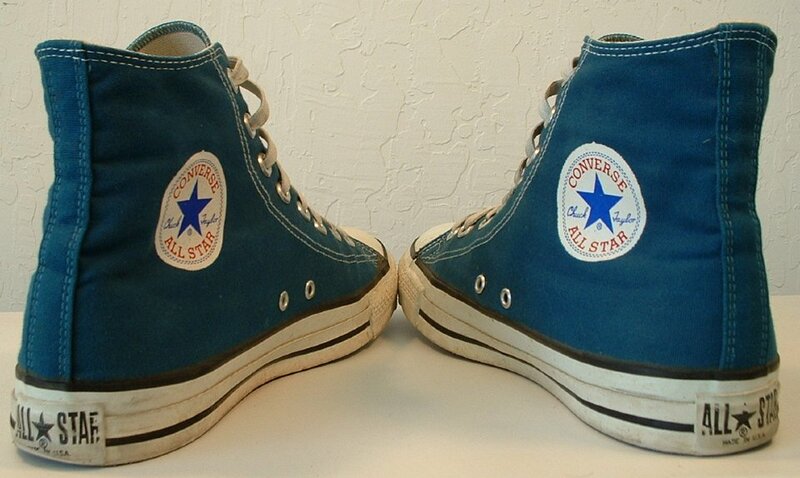 74 Blue High Top Chucks Rear view of distressed blue high tops. 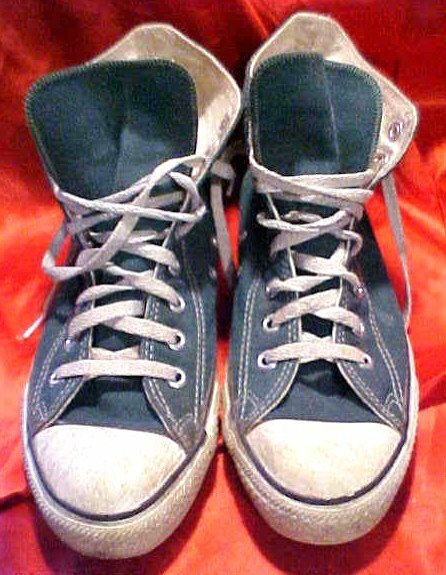 75 Blue High Top Chucks Front view of distressed blue high tops. 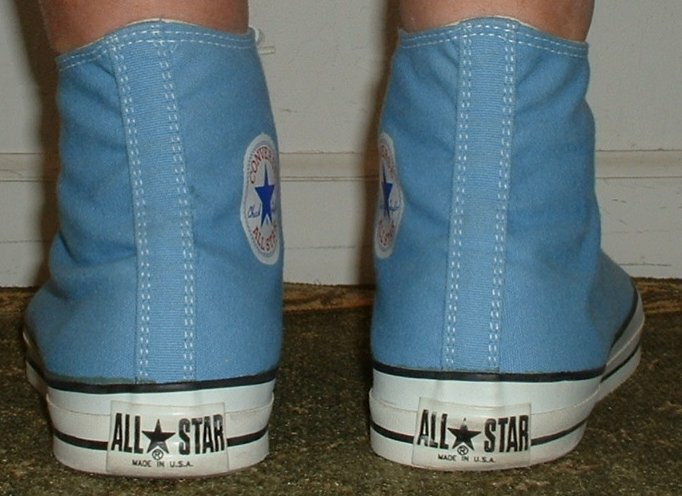 76 Blue High Top Chucks Angled inside patch view of distressed blue high tops. 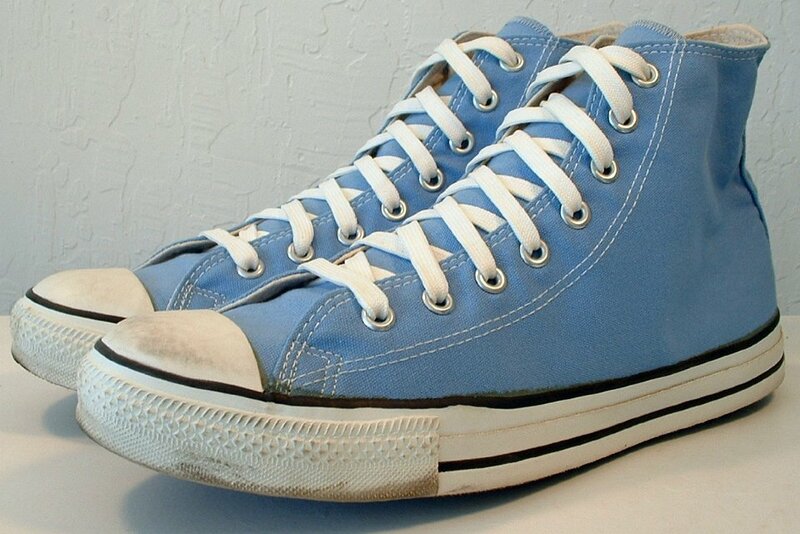 77 Blue High Top Chucks Top view of distressed blue high tops. 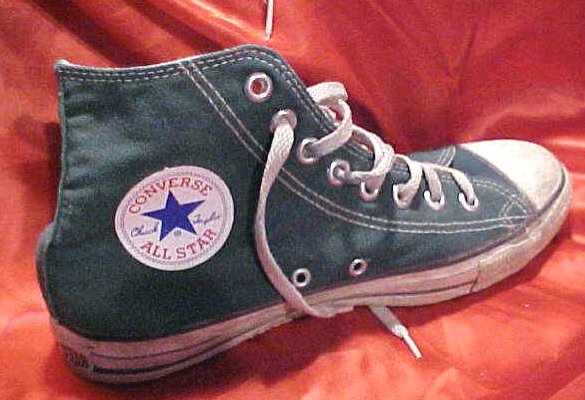 78 Blue High Top Chucks Inside patch views of distressed blue high tops. 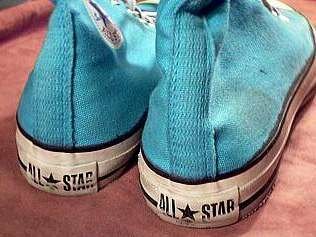 79 Blue High Top Chucks Closeup of the frayed threads on a pair of distressed blue high tops. 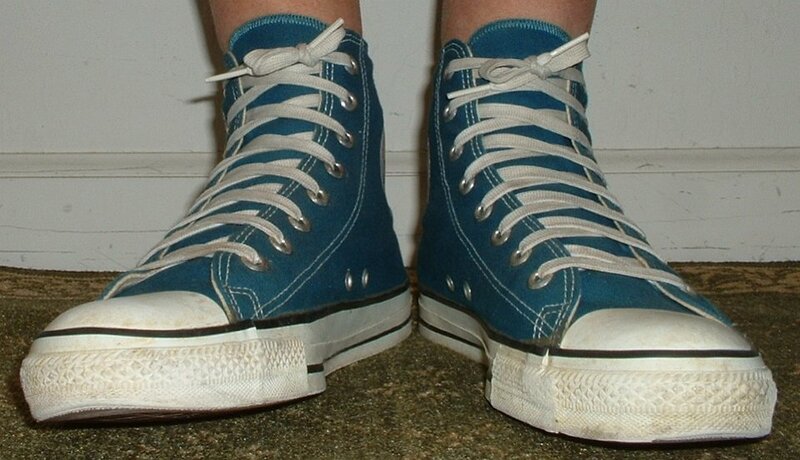 80 Blue High Top Chucks Inside patch and sole views of distressed blue high tops. 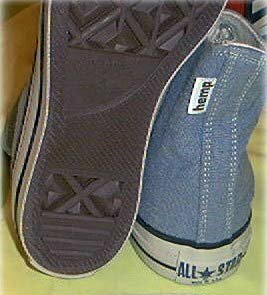 81 Blue High Top Chucks Angled inside patch view of a right dusk blue high top. 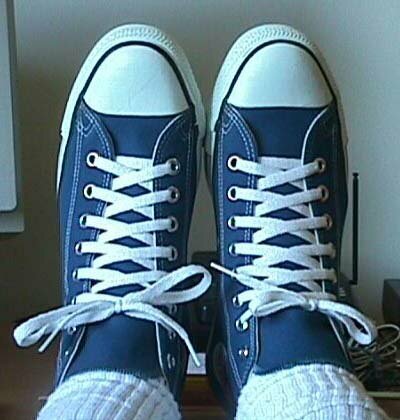 82 Blue High Top Chucks Top view of dusk blue high tops with narrow navy blue laces. 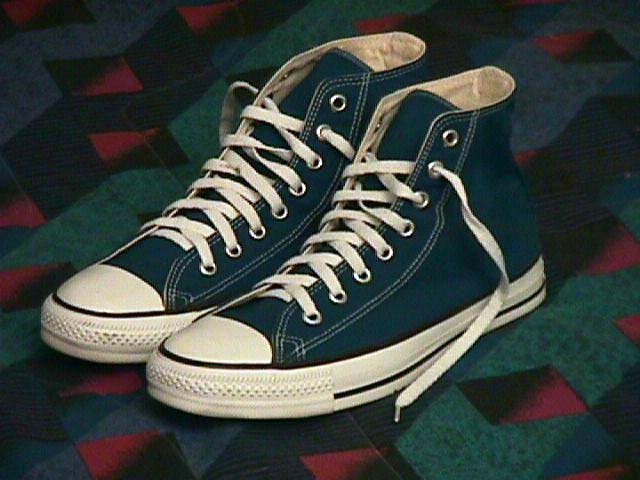 83 Blue High Top Chucks Front view of dusk blue high tops with narrow navy blue laces. 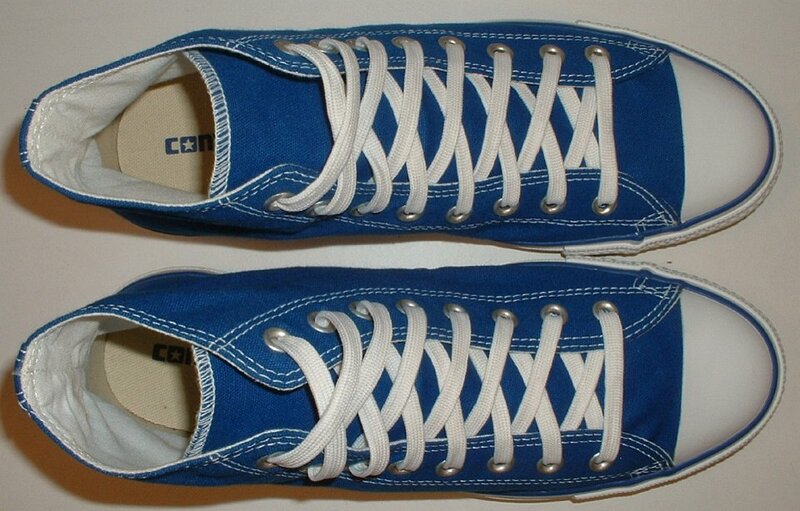 84 Blue High Top Chucks Angled front view of dusk blue high tops with narrow navy blue laces. 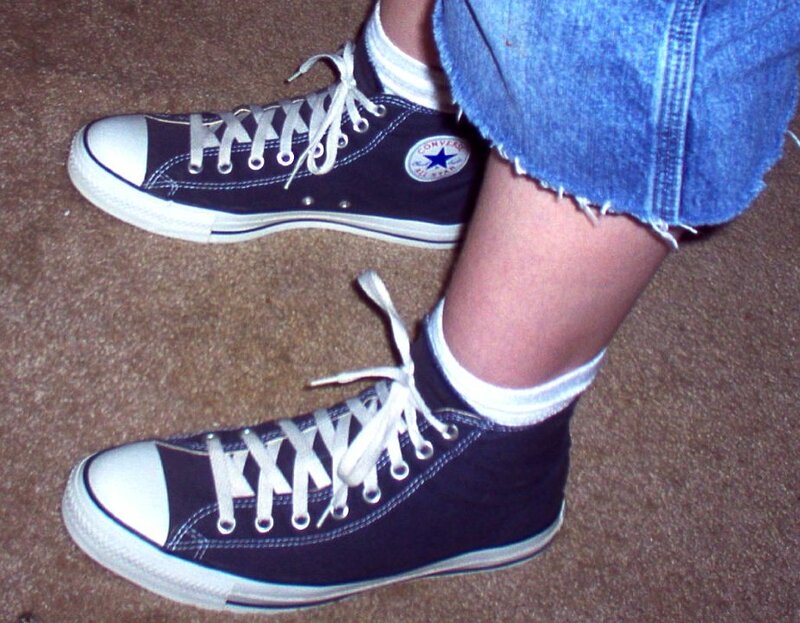 85 Blue High Top Chucks Inside patch views of dusk blue high tops with narrow navy blue laces. 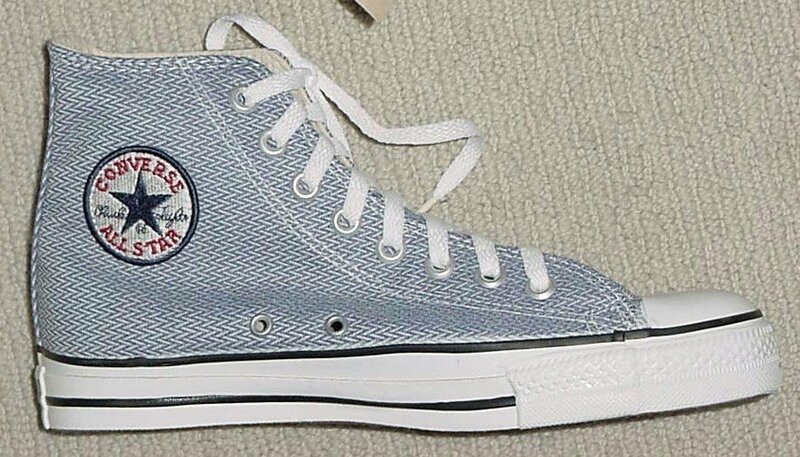 86 Blue High Top Chucks Inside patch and sole views of dusk blue high tops with narrow navy blue laces. 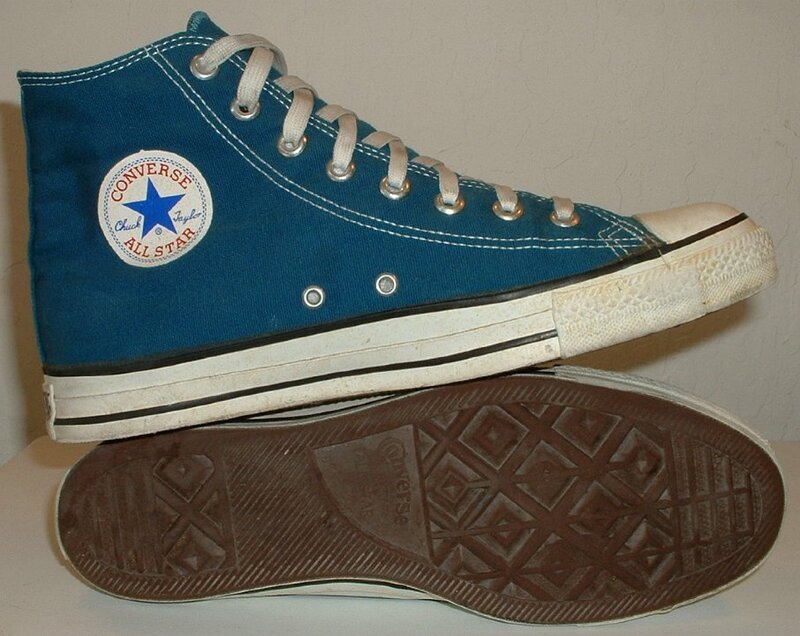 87 Blue High Top Chucks Wearing dusk blue high tops, top view shot 1. 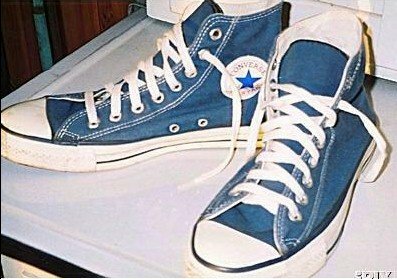 88 Blue High Top Chucks Wearing dusk blue high tops, top view shot 2. 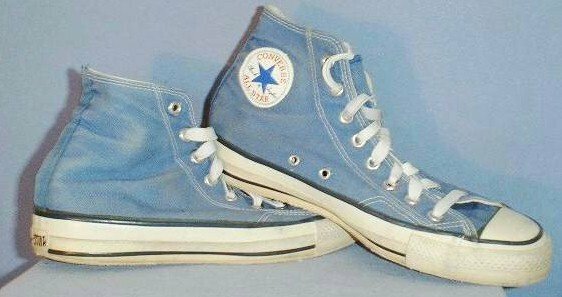 89 Blue High Top Chucks Top and inside patch view of hemp denim blue high tops. 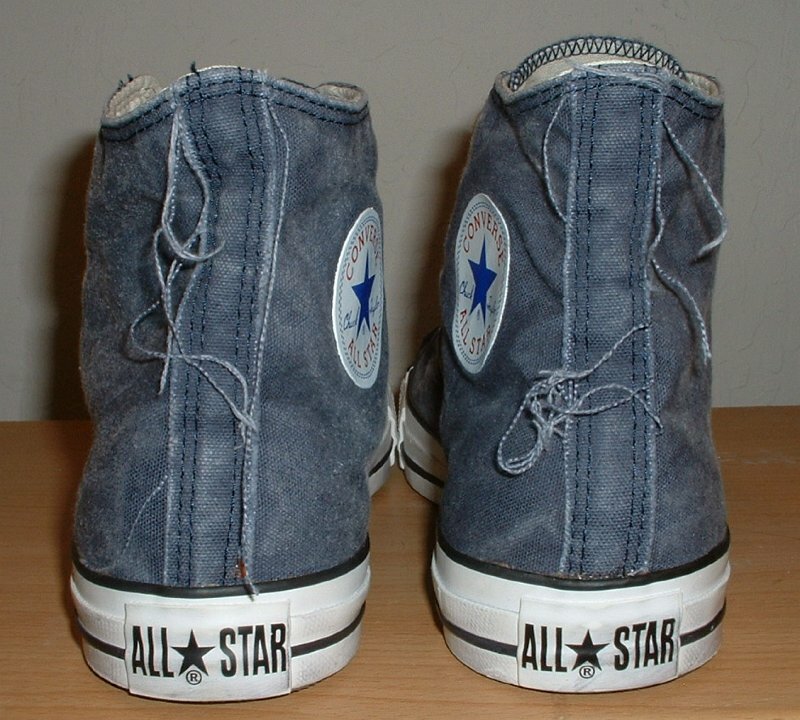 90 Blue High Top Chucks Rear and outer sole views of hemp denim blue high tops. 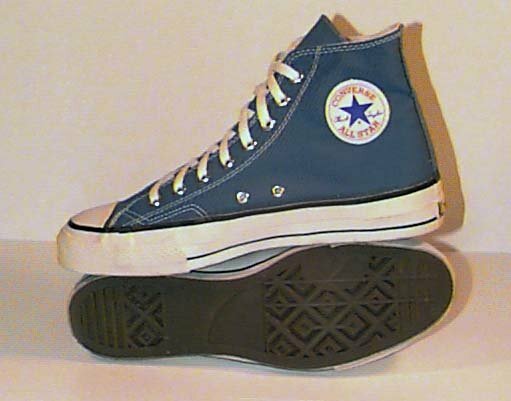 91 Blue High Top Chucks Angled rear view of unlaced huckleberry blue high tops. 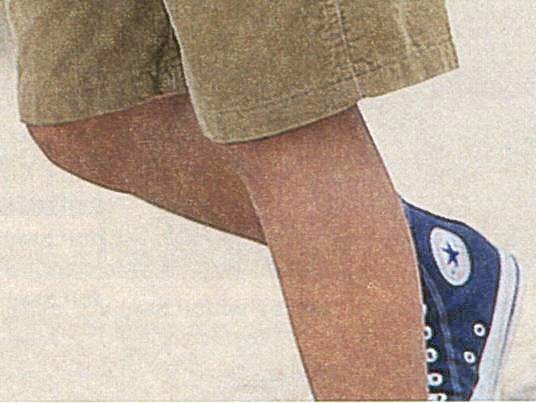 92 Blue High Top Chucks Inside patch views of unlaced huckleberry blue high tops, shot 1. 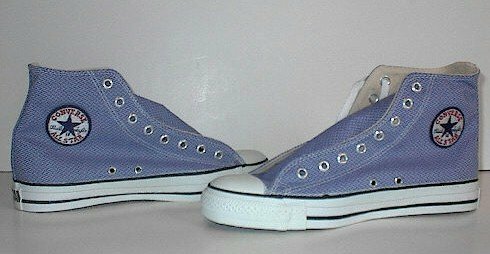 93 Blue High Top Chucks Inside patch views of unlaced huckleberry blue high tops, shot 2. 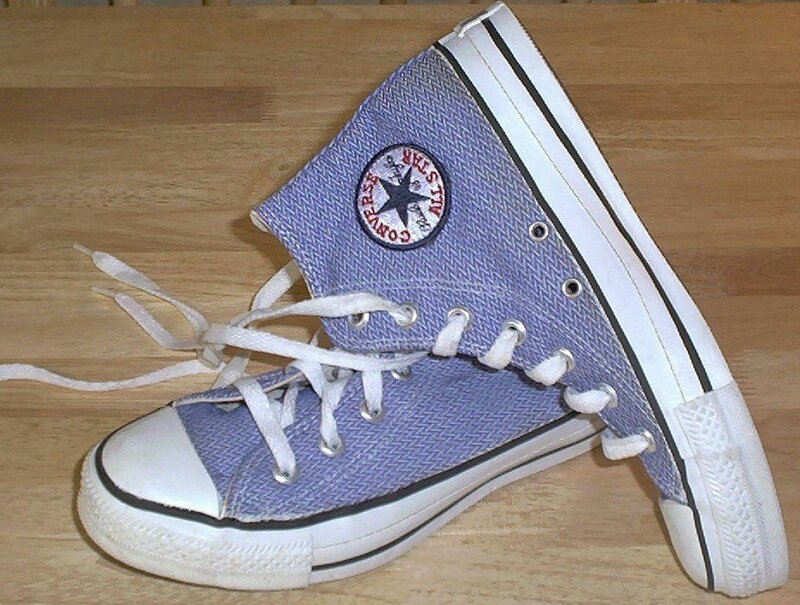 94 Blue High Top Chucks Inside patch view of a right huckleberry blue high top. 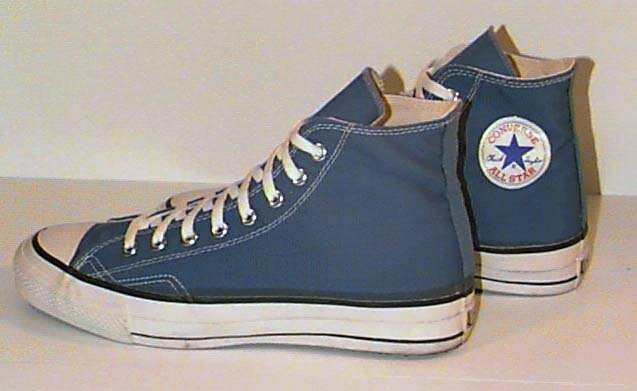 95 Blue High Top Chucks Outside view of a right huckleberry blue high top. 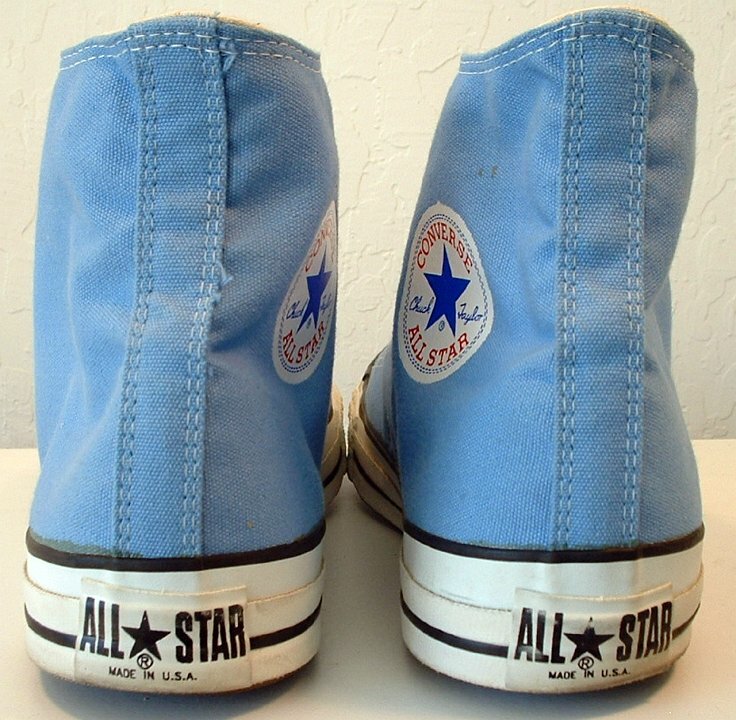 96 Blue High Top Chucks Inside patch view of a left huckleberry blue high top. 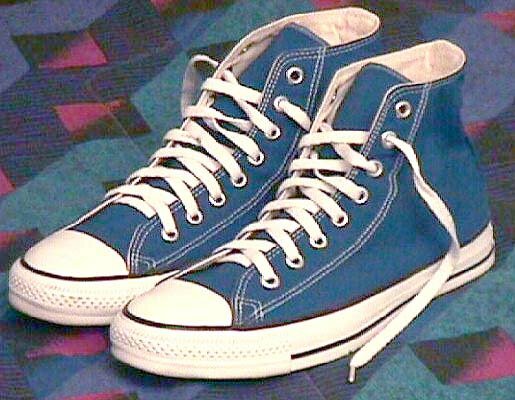 97 Blue High Top Chucks Outside view of a left huckleberry blue high top. 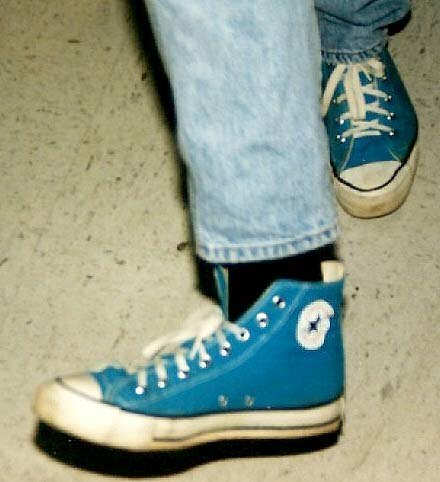 98 Blue High Top Chucks Rear view of huckleberry blue high tops. 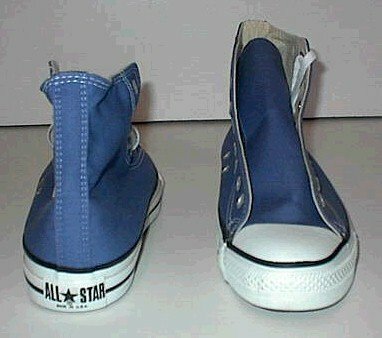 99 Blue High Top Chucks Angled rear view of huckleberry blue high tops. 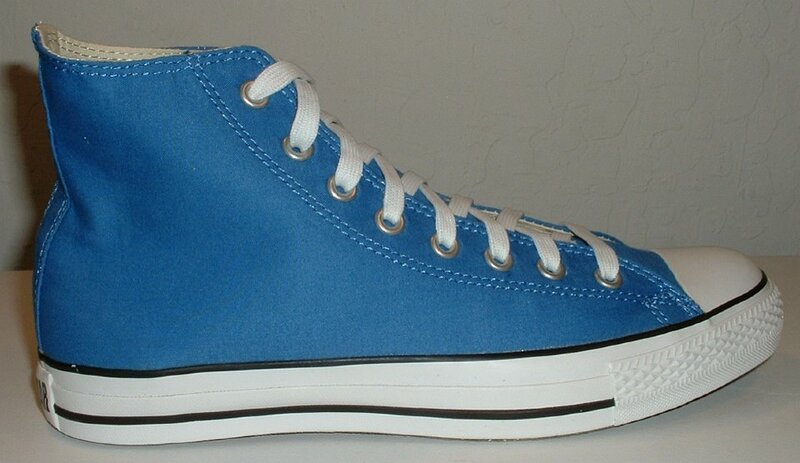 100 Blue High Top Chucks Angled side view of huckleberry blue high tops. 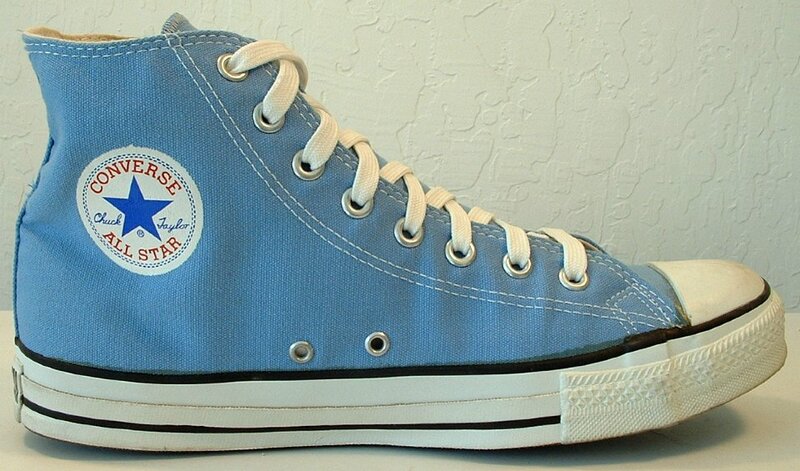 101 Blue High Top Chucks Front view of huckleberry blue high tops. 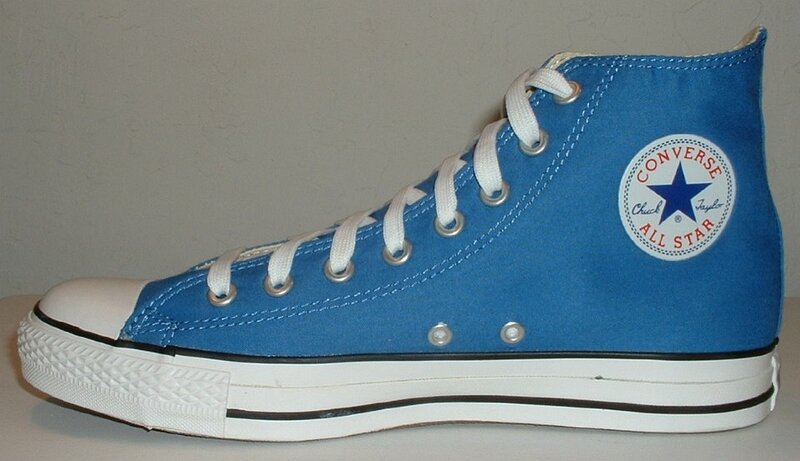 102 Blue High Top Chucks Angled front view of huckleberry blue high tops. 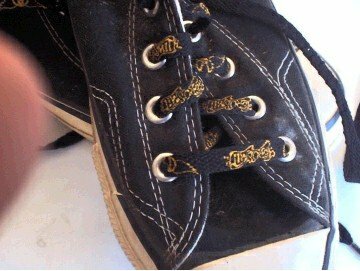 103 Blue High Top Chucks Top view of huckleberry blue high tops. 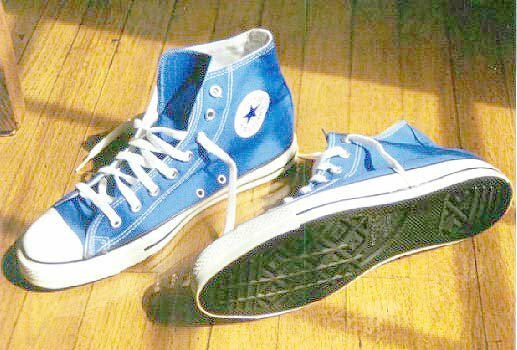 104 Blue High Top Chucks Inside patch views of huckleberry blue high tops. 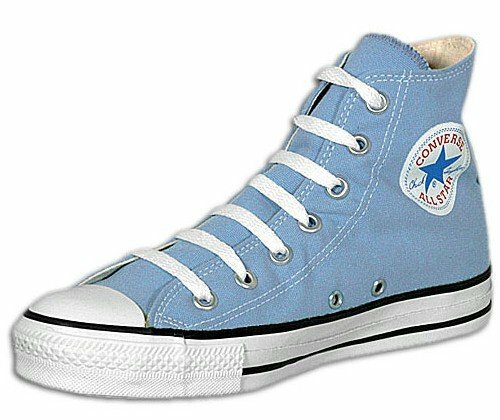 105 Blue High Top Chucks Outside views of huckleberry blue high tops. 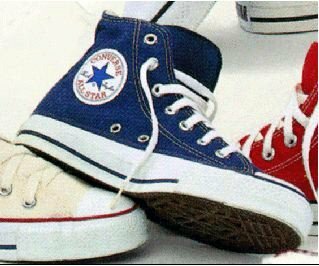 106 Blue High Top Chucks Inside patch and sole views of huckleberry blue high tops. 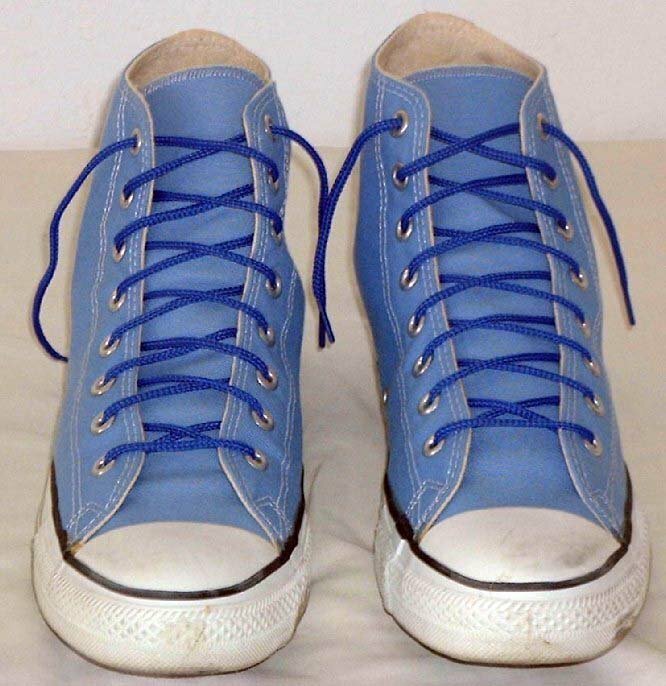 107 Blue High Top Chucks Wearing huckleberry blue high tops, front view shot 1. 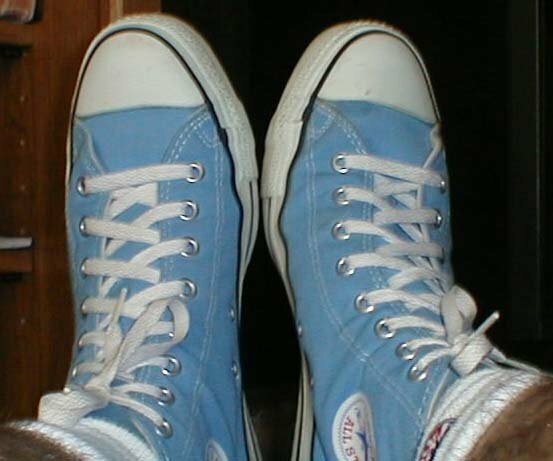 108 Blue High Top Chucks Wearing huckleberry blue high tops, front view shot 2. 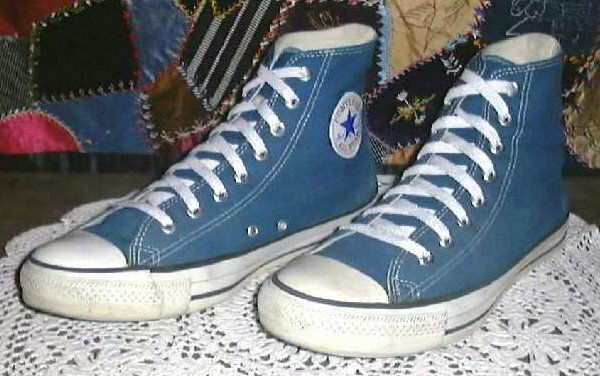 109 Blue High Top Chucks Wearing huckleberry blue high tops, front view shot 3. 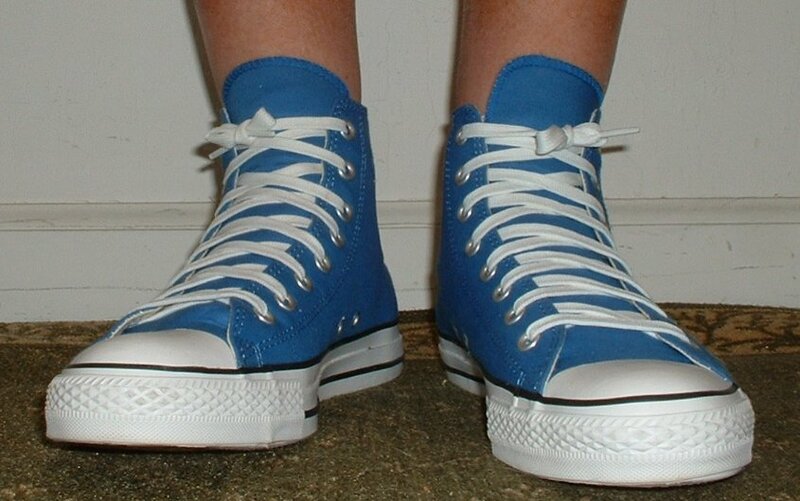 110 Blue High Top Chucks Wearing huckleberry blue high tops, front view shot 4. 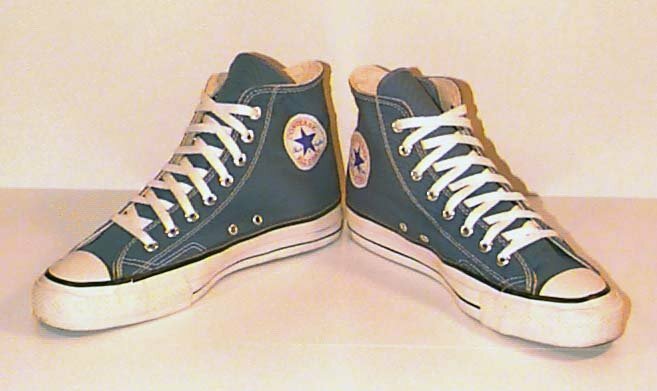 111 Blue High Top Chucks Wearing huckleberry blue high tops, right side view shot 1. 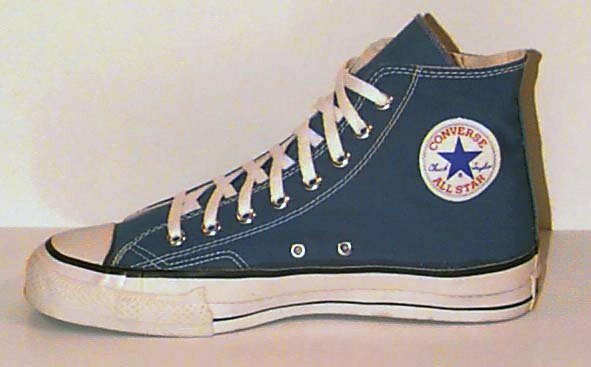 112 Blue High Top Chucks Wearing huckleberry blue high tops, right side view shot 2. 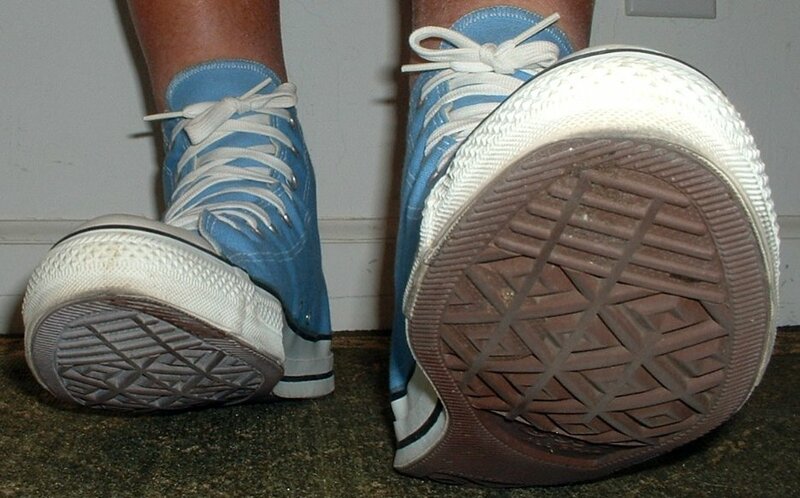 113 Blue High Top Chucks Wearing huckleberry blue high tops, rear view shot 1. 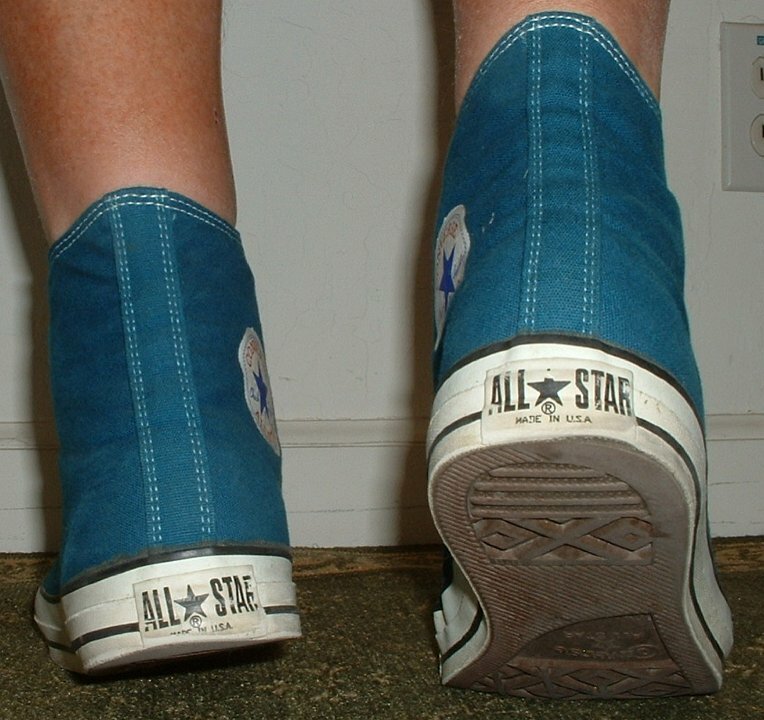 114 Blue High Top Chucks Wearing huckleberry blue high tops, rear view shot 2. 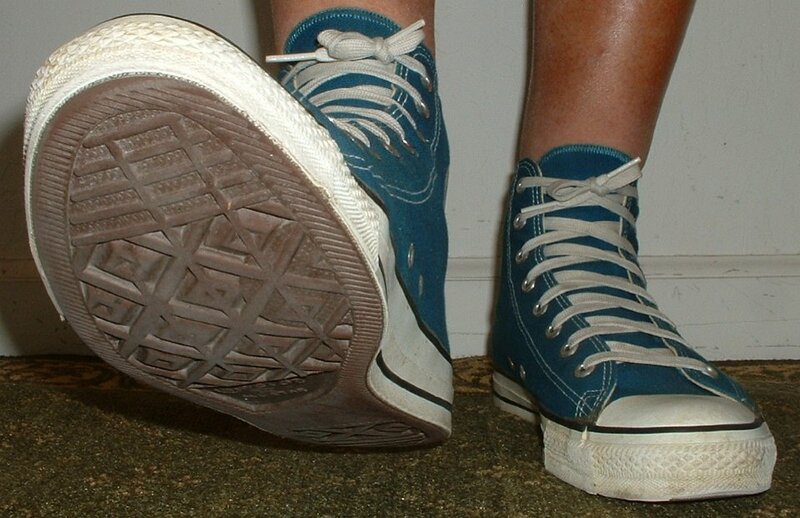 115 Blue High Top Chucks Wearing huckleberry blue high tops, rear view shot 3. 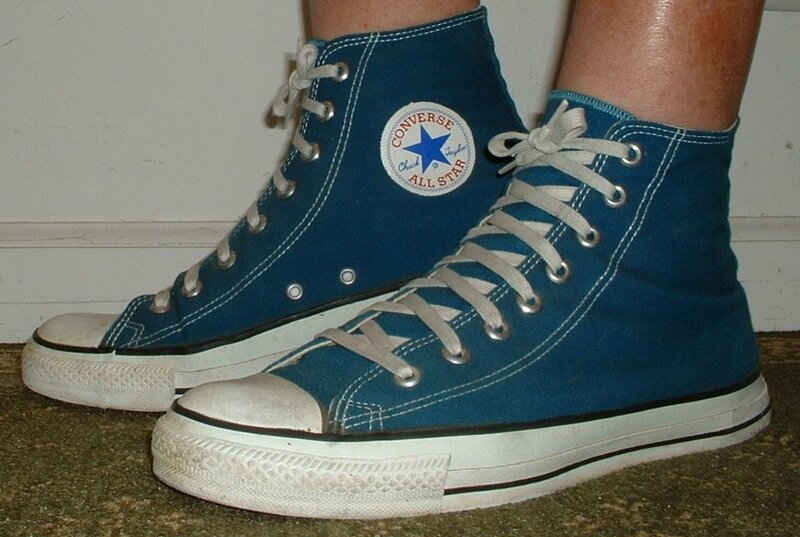 116 Blue High Top Chucks Wearing huckleberry blue high tops, left side view shot 1. 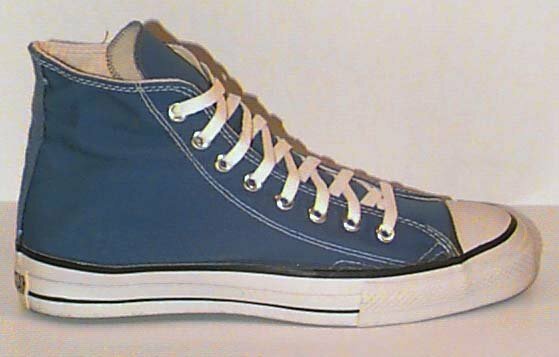 117 Blue High Top Chucks Wearing huckleberry blue high tops, left side view shot 2. 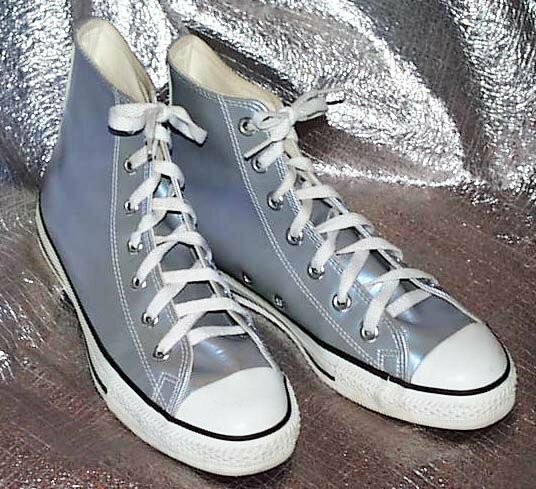 118 Blue High Top Chucks Metallic blue high tops, side view. 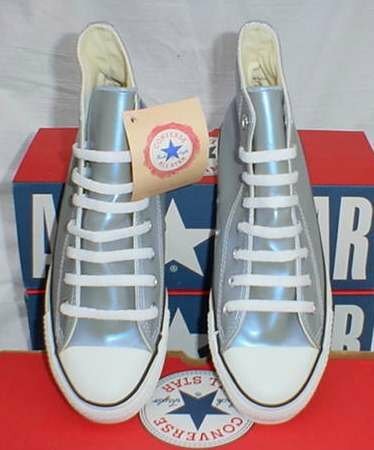 119 Blue High Top Chucks Metallic blue high tops, top view. 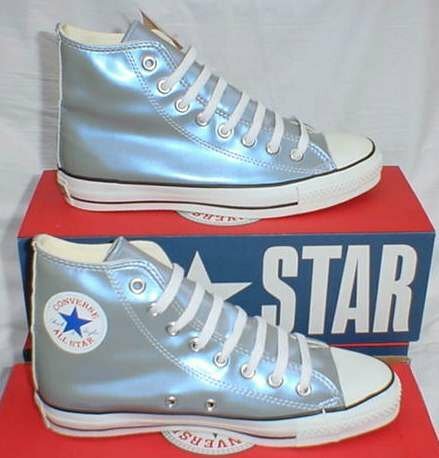 120 Blue High Top Chucks Metallic blue high tops, angled side view. 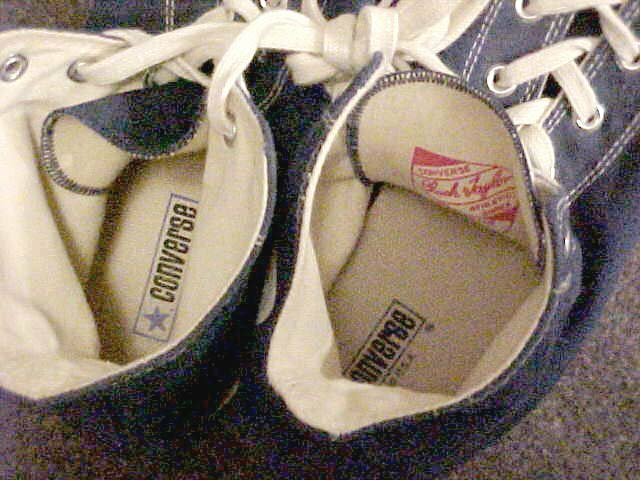 121 Blue High Top Chucks Inside patch view of a right nautical blue high top. 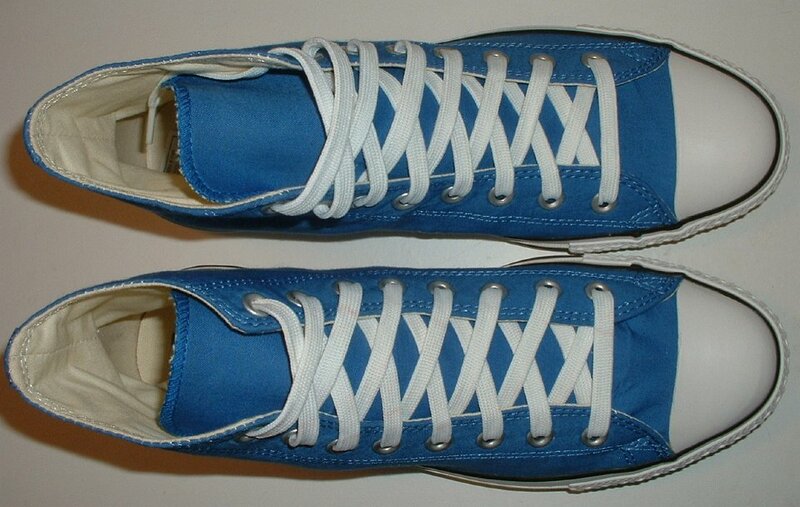 122 Blue High Top Chucks Outside view of a right nautical blue high top. 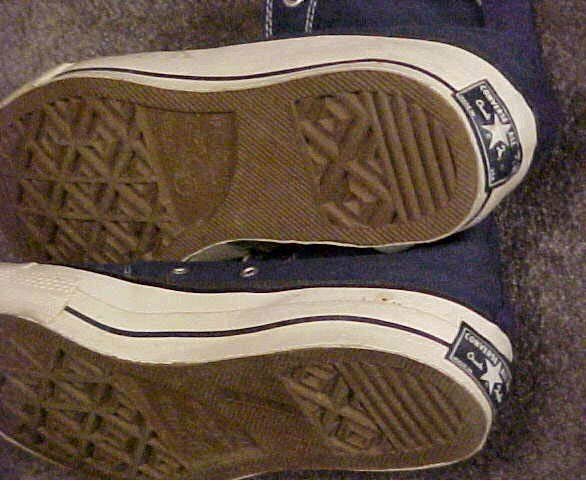 123 Blue High Top Chucks Inside patch view of a left nautical blue high top. 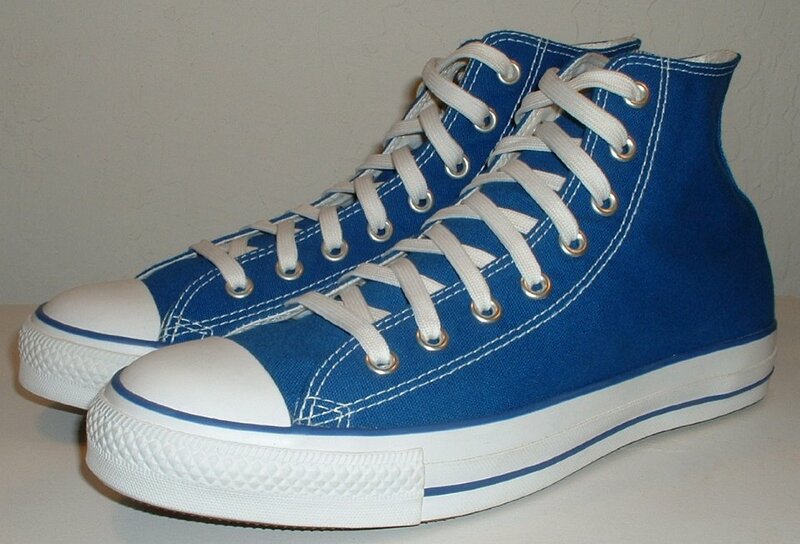 124 Blue High Top Chucks Outside view of a left nautical blue high top. 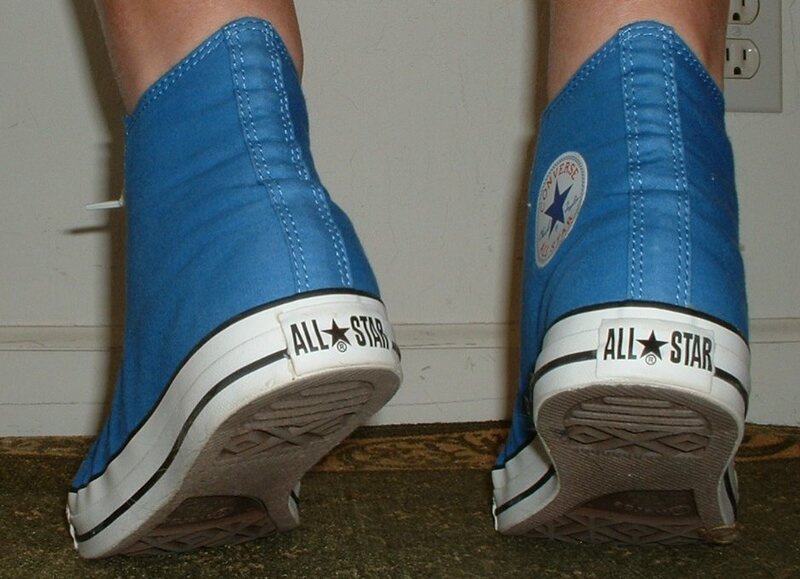 125 Blue High Top Chucks Rear view of nautical blue high tops. 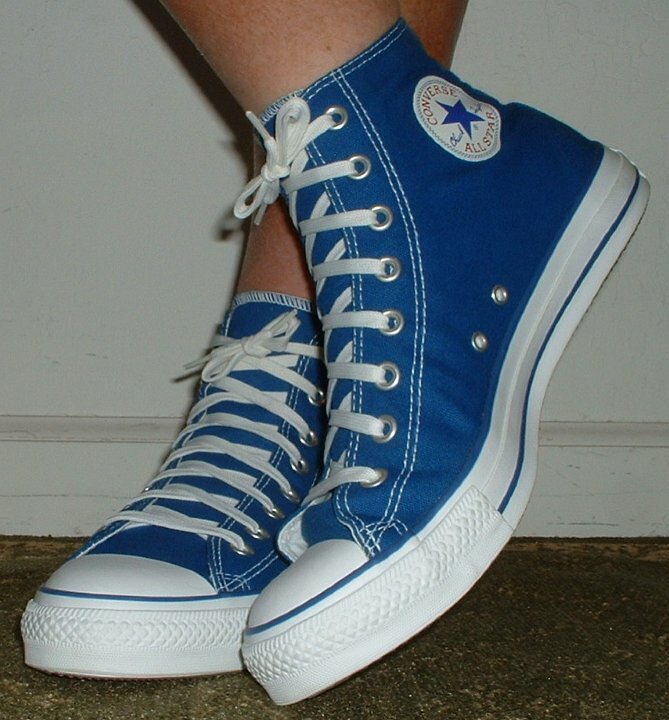 126 Blue High Top Chucks Angled side view of nautical blue high tops. 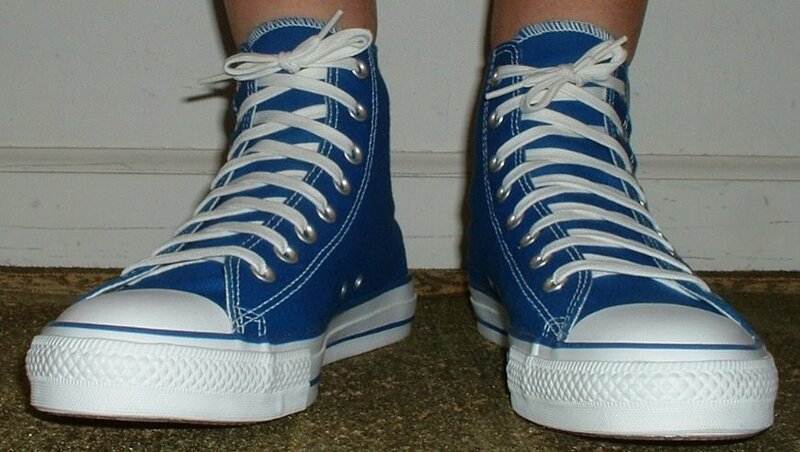 127 Blue High Top Chucks Front view of nautical blue high tops. 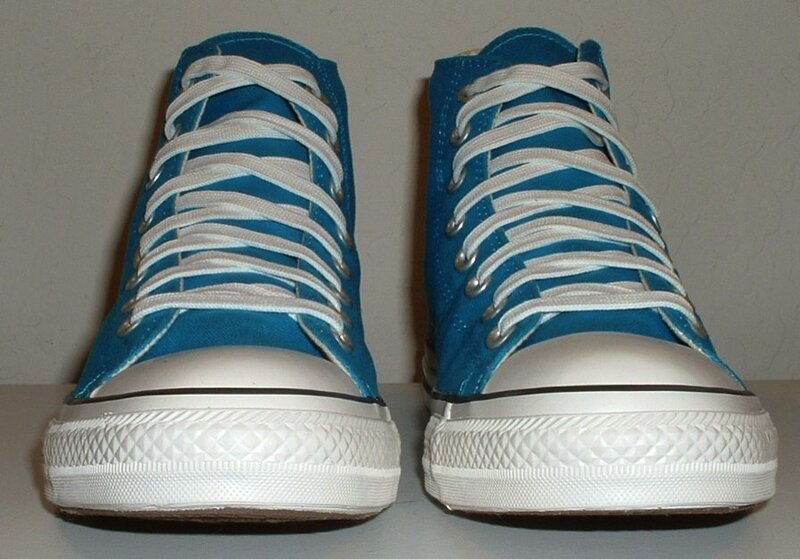 128 Blue High Top Chucks Angled front view of nautical blue high tops. 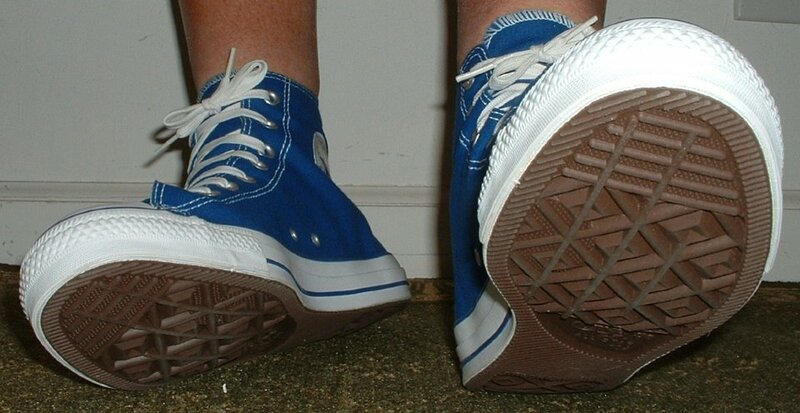 129 Blue High Top Chucks Top view of nautical blue high tops. 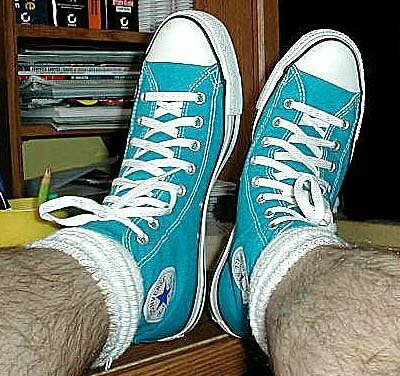 130 Blue High Top Chucks Inside patch views of nautical blue high tops. 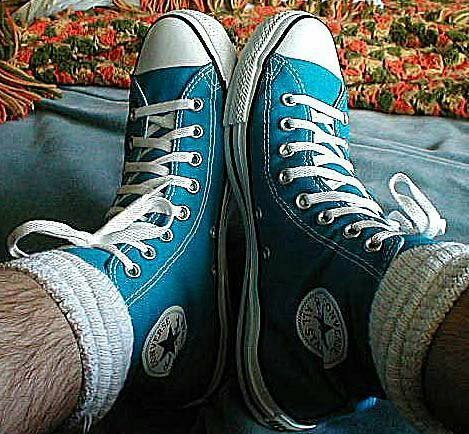 131 Blue High Top Chucks Outside views of nautical blue high tops. 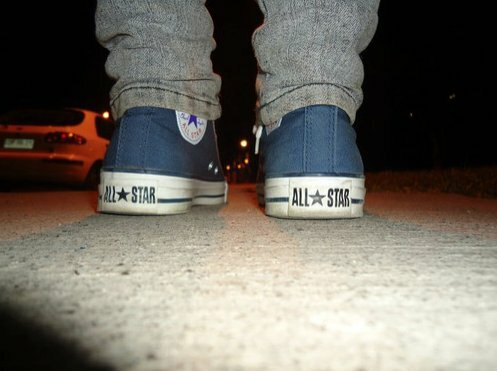 132 Blue High Top Chucks inside patch and sole views of nautical blue high tops. 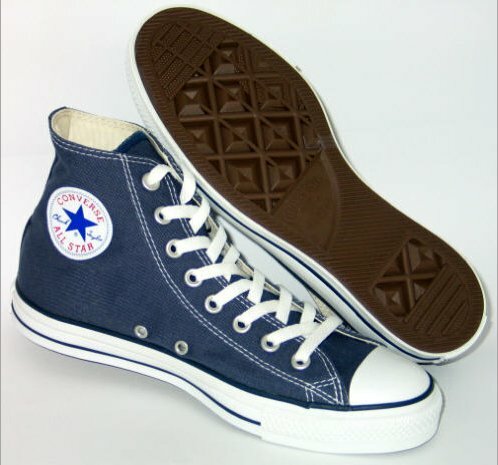 133 Blue High Top Chucks Inside patch view of a right navy blue high top. 134 Blue High Top Chucks Outside patch view of a right navy blue high top. 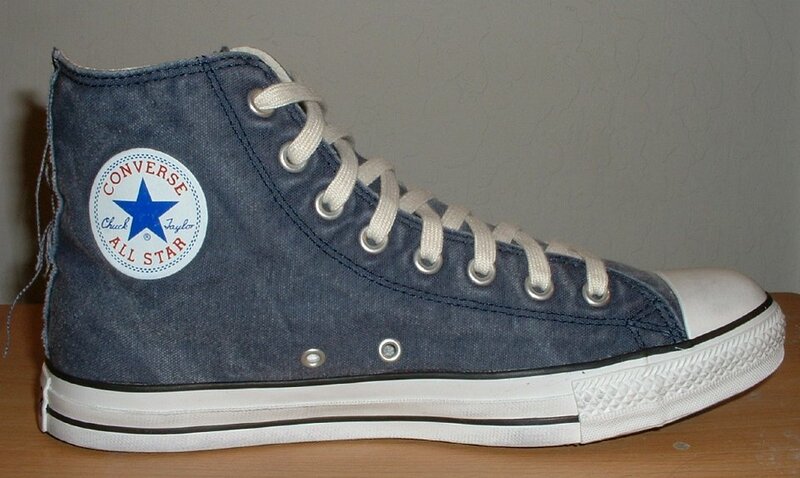 135 Blue High Top Chucks Inside patch view of a left navy blue high top. 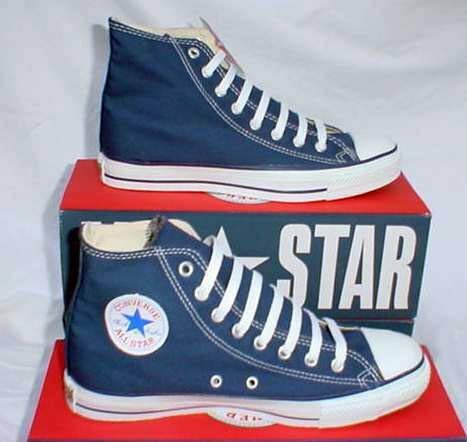 136 Blue High Top Chucks Outside patch view of a left navy blue high top. 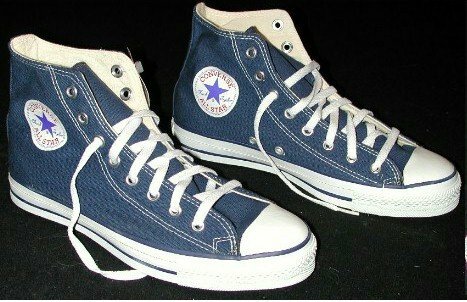 137 Blue High Top Chucks Rear view of navy blue high tops. 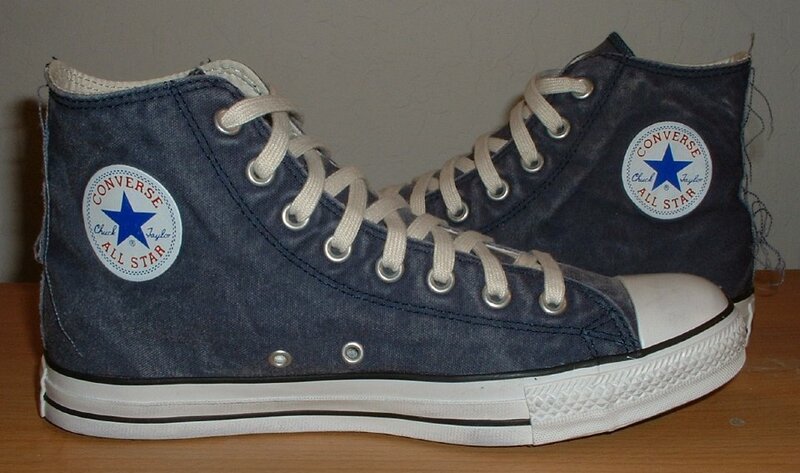 139 Blue High Top Chucks Inside patch view of a left navy blue high top. 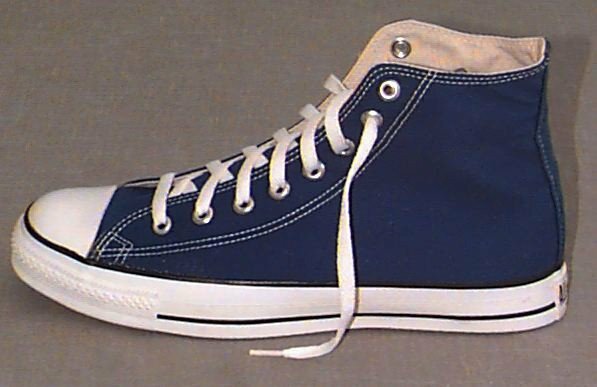 140 Blue High Top Chucks Angled top and side view of a right navy blue high top. 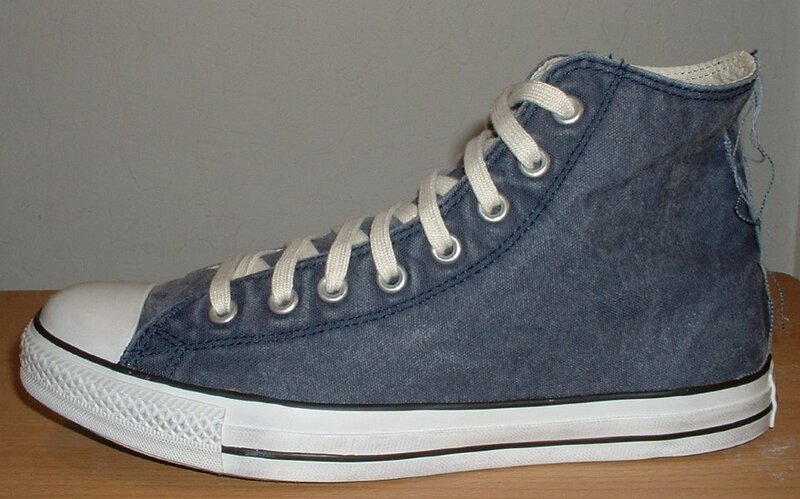 141 Blue High Top Chucks Angled inside patch view of a left navy blue high top. 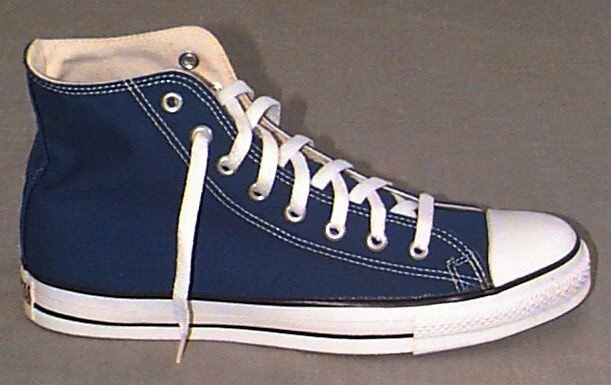 142 Blue High Top Chucks Angled side view of navy blue high tops. 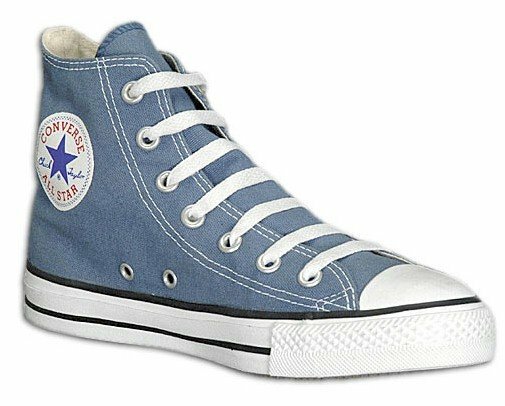 144 Blue High Top Chucks Angled side views of navy blue high tops. 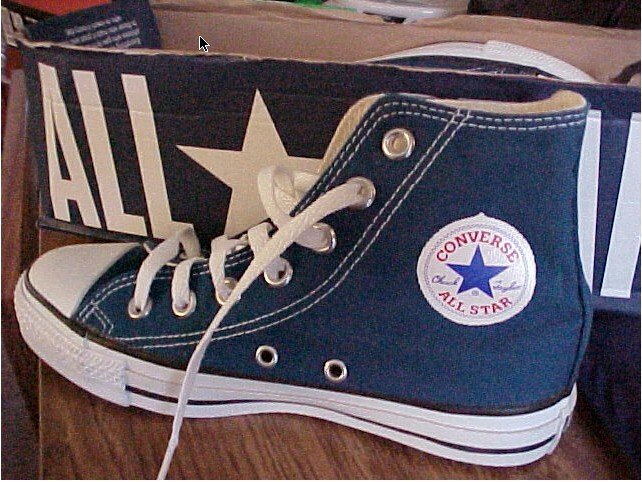 145 Blue High Top Chucks Angled front view of navy blue high tops. 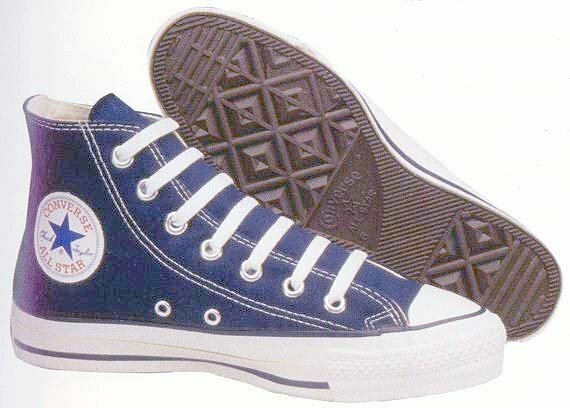 146 Blue High Top Chucks Angled top view of navy blue high tops. 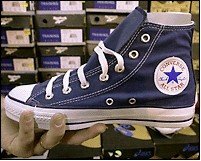 147 Blue High Top Chucks Store display of a right navy blue high top. 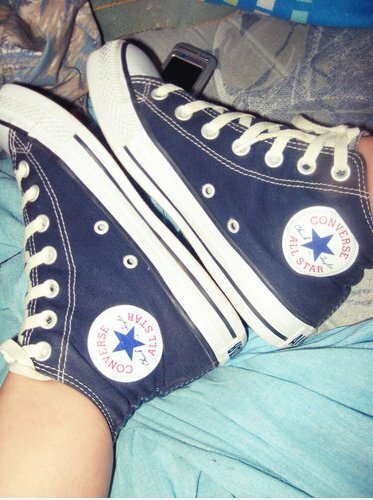 148 Blue High Top Chucks Angled side and sole views of navy blue high tops. 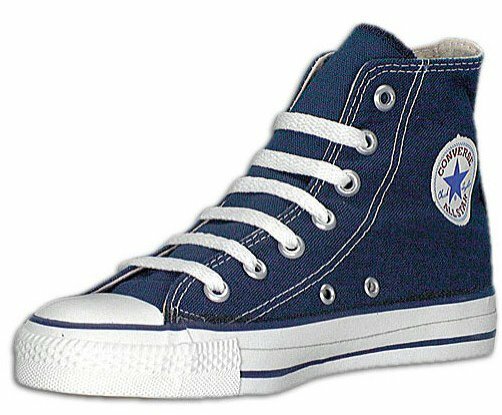 150 Blue High Top Chucks Angled side views of navy blue high tops. 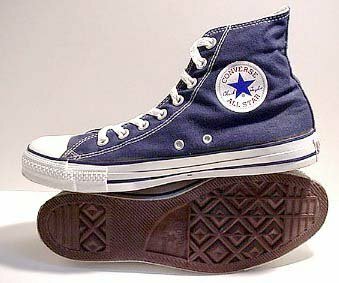 151 Blue High Top Chucks Angled side views of navy blue high tops. 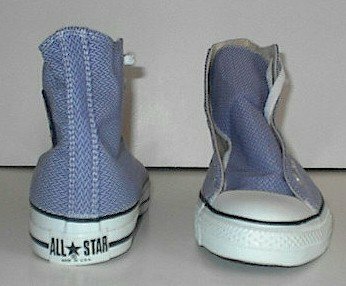 152 Blue High Top Chucks Front and rear views of navy blue high tops. 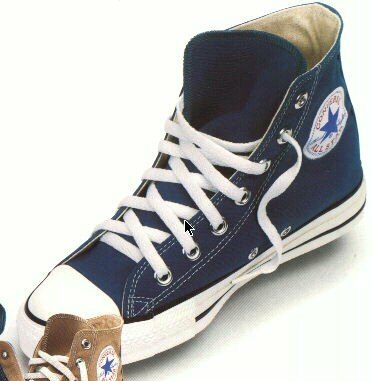 156 Blue High Top Chucks Side view of straight laced navy blue high tops. 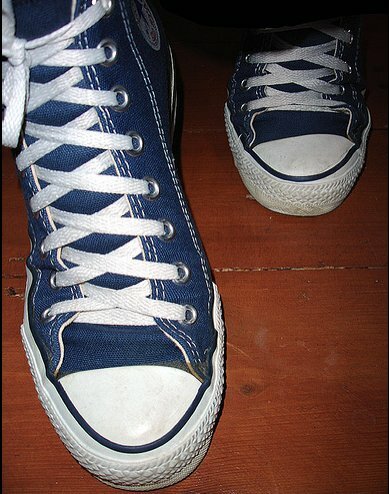 157 Blue High Top Chucks Top view of straight laced navy blue high tops. 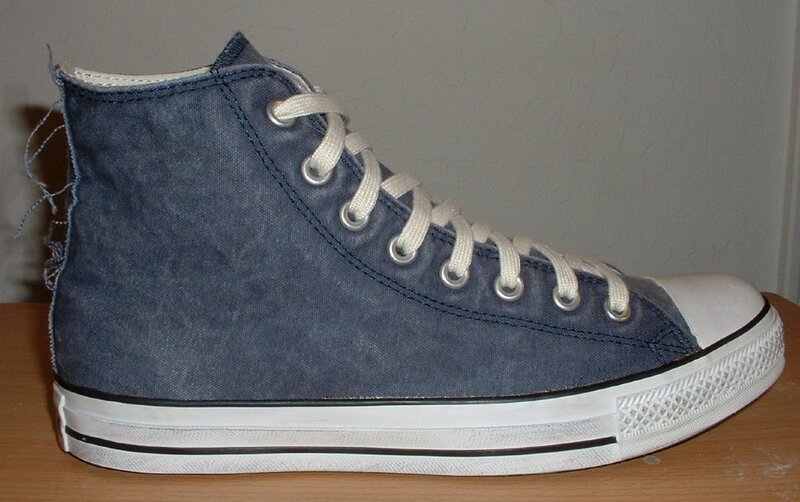 158 Blue High Top Chucks Angled side view of a right navy blue high top. 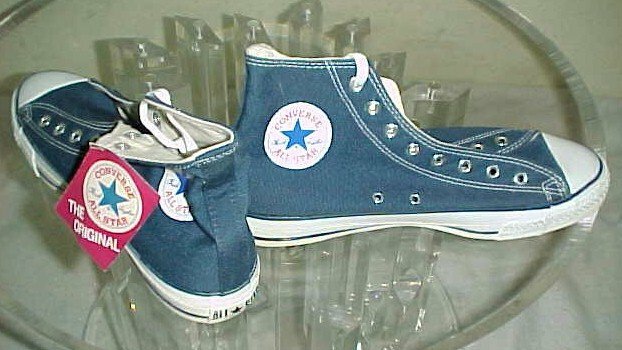 159 Blue High Top Chucks Navy Blue High Tops, left inside patch and right sole views. 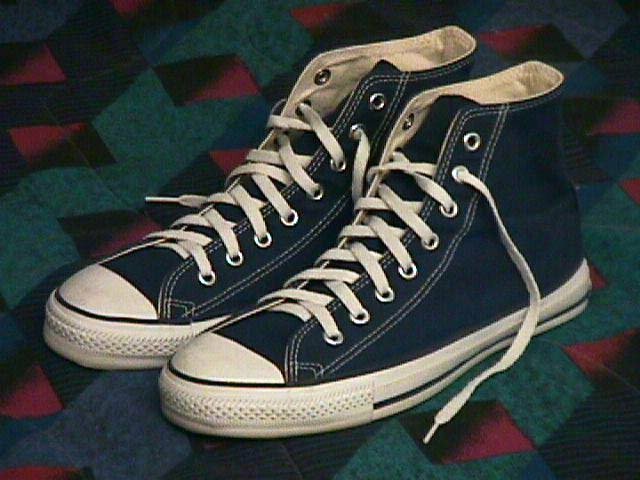 161 Blue High Top Chucks Angled front view of navy blue high tops. 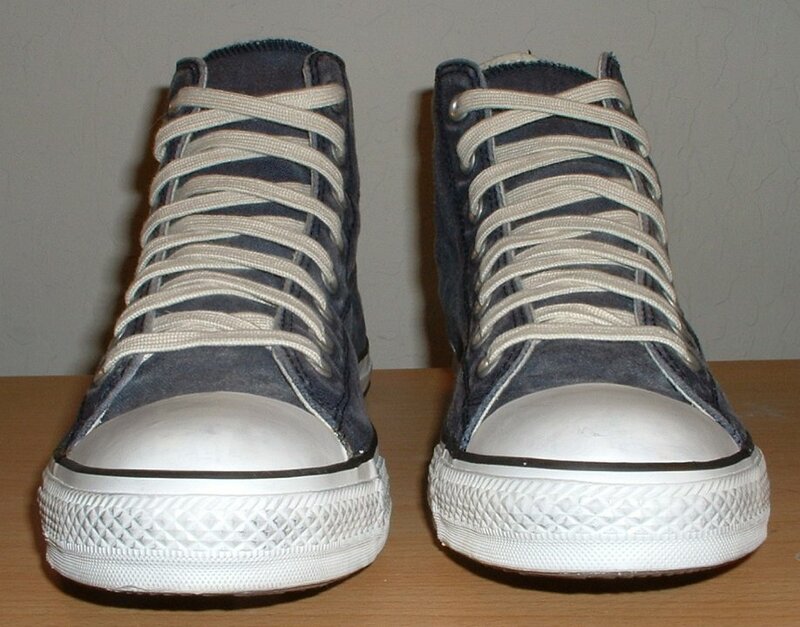 162 Blue High Top Chucks Angled side view of navy blue high tops. 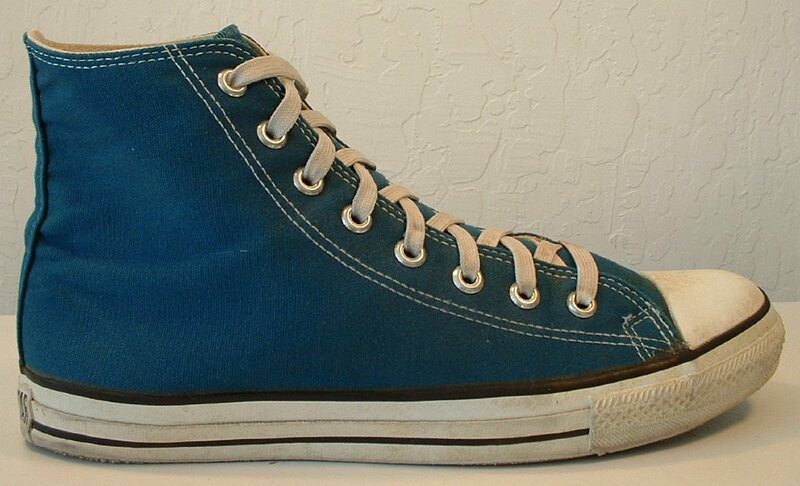 163 Blue High Top Chucks Suede monochrome blue high tops, rear and inside patch views. 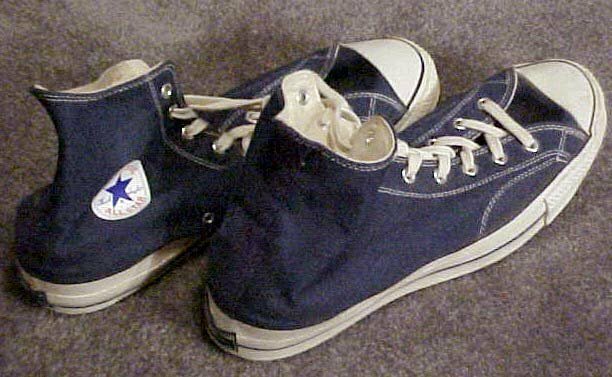 166 Blue High Top Chucks Inside patch view of a right vintage navy blue high top. 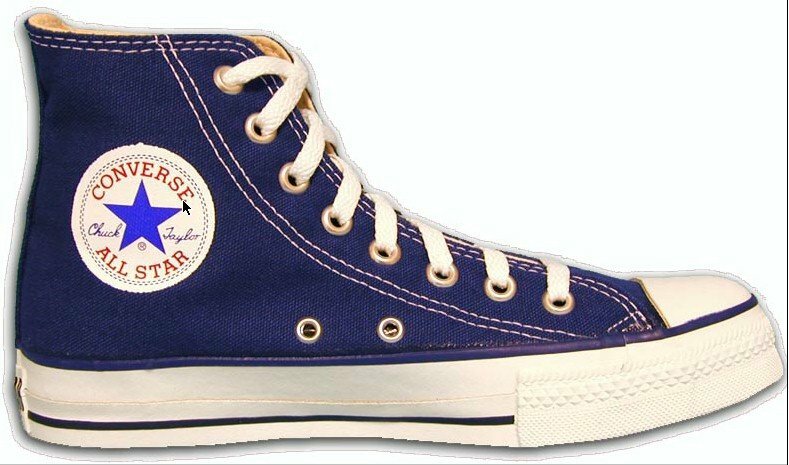 167 Blue High Top Chucks Inside patch view of a left vintage navy blue high top. 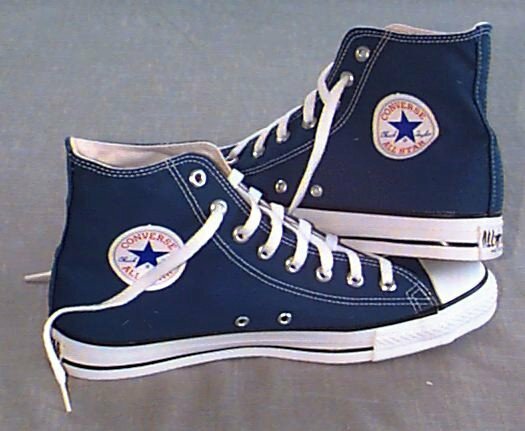 168 Blue High Top Chucks Outside patch view of a left vintage navy blue high top. 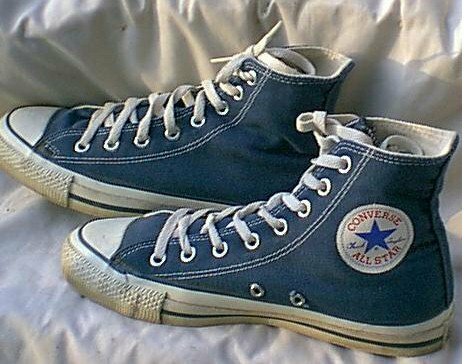 169 Blue High Top Chucks Outside patch view of a right vintage navy blue high top. 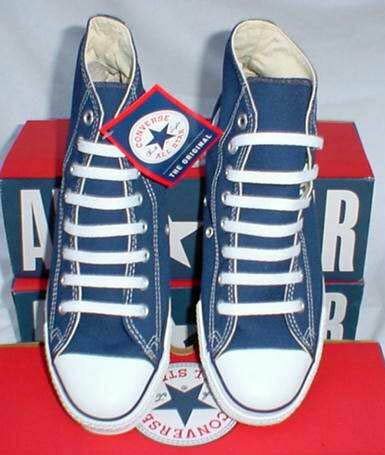 170 Blue High Top Chucks Vintage Navy Blue High Tops, right inside and left sole views. 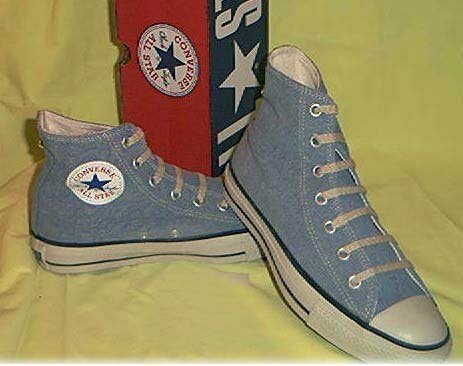 171 Blue High Top Chucks Vintage Navy Blue High Tops, right inside and left outside views. 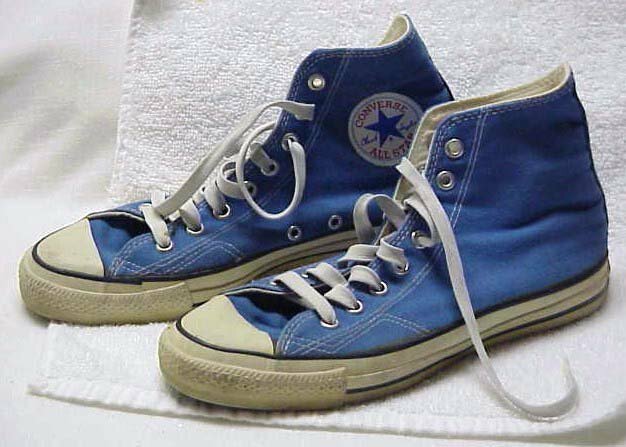 172 Blue High Top Chucks Vintage Navy Blue High Tops, angled front views. 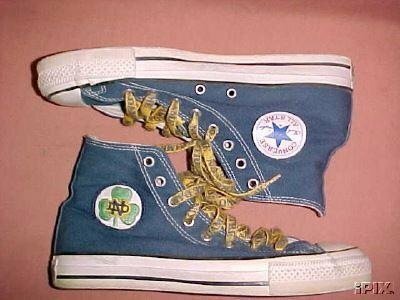 173 Blue High Top Chucks Notre Dame Fighting Irish high topcs, side view. 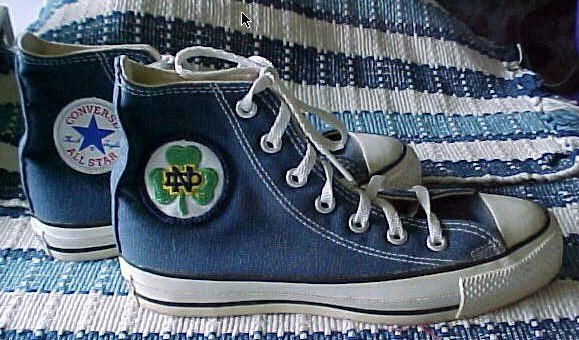 174 Blue High Top Chucks Notre Dame Fighting Irish high topcs, top view sowing the laces and different logos. 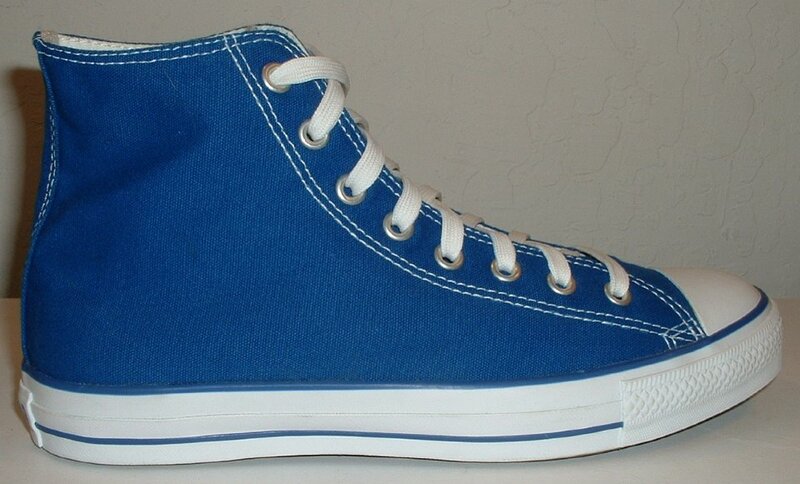 175 Blue High Top Chucks Inside patch view of a right royal blue high top. 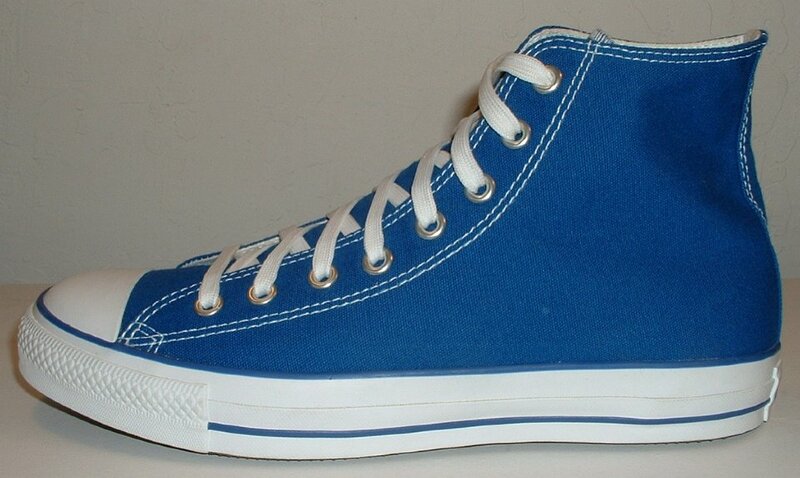 176 Blue High Top Chucks Outside view of a right royal blue high top. 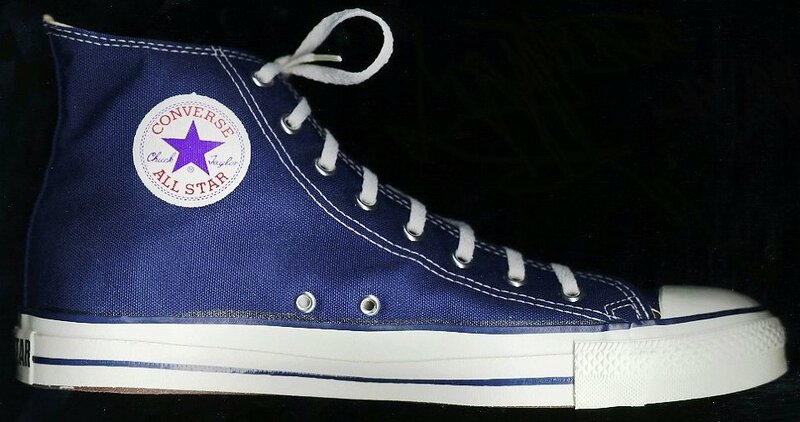 177 Blue High Top Chucks Inside patch view of a left royal blue high top. 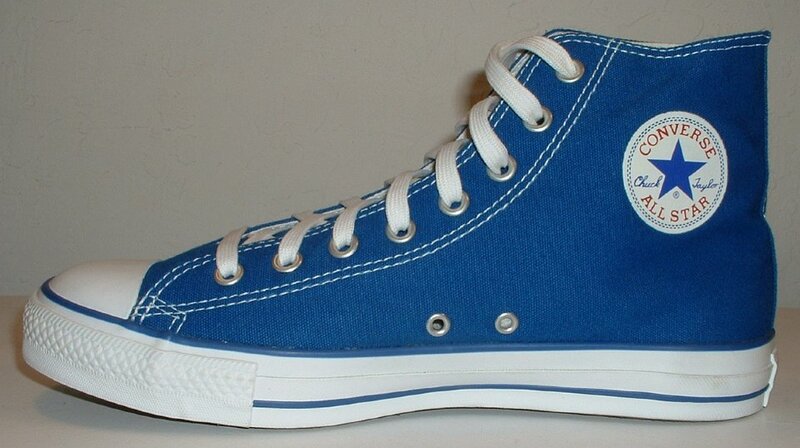 178 Blue High Top Chucks Outside view of a left royal blue high top. 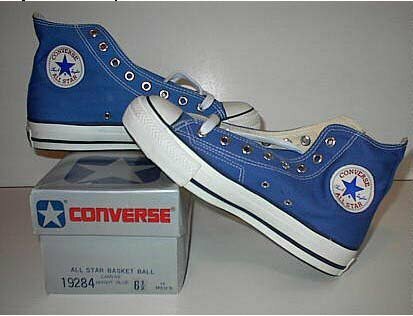 179 Blue High Top Chucks Rear view of royal blue high top chucks. 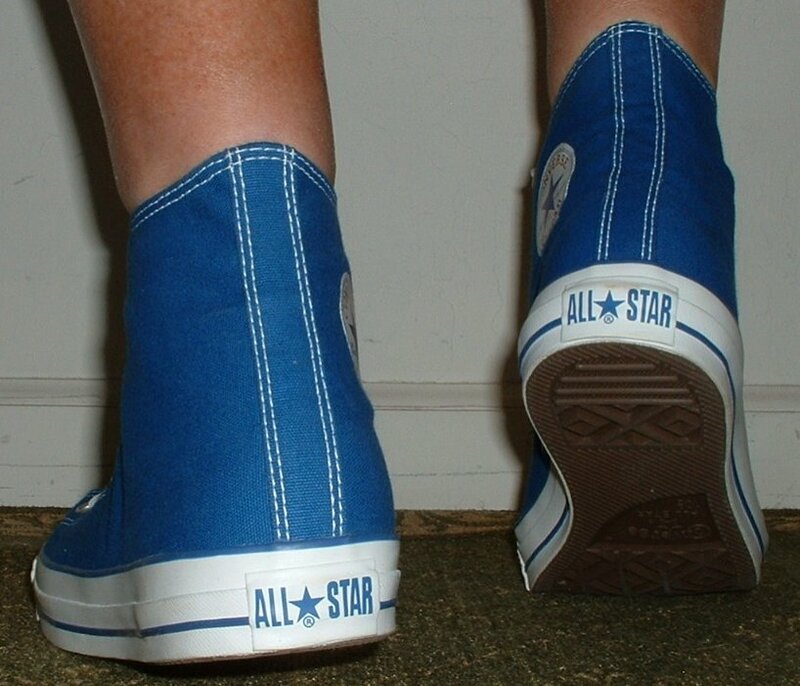 180 Blue High Top Chucks Angled rear view of royal blue high top chucks. 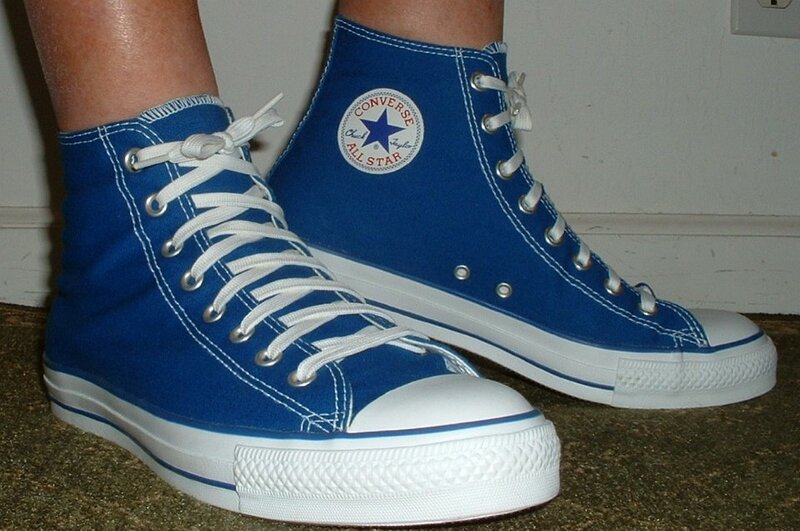 181 Blue High Top Chucks Angled side view of royal blue high top chucks. 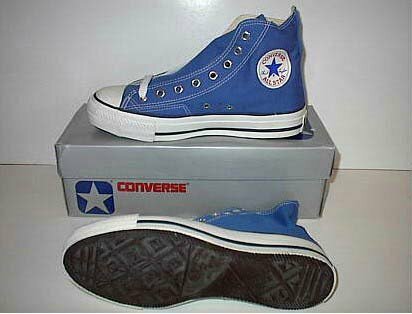 182 Blue High Top Chucks Front view of royal blue high top chucks. 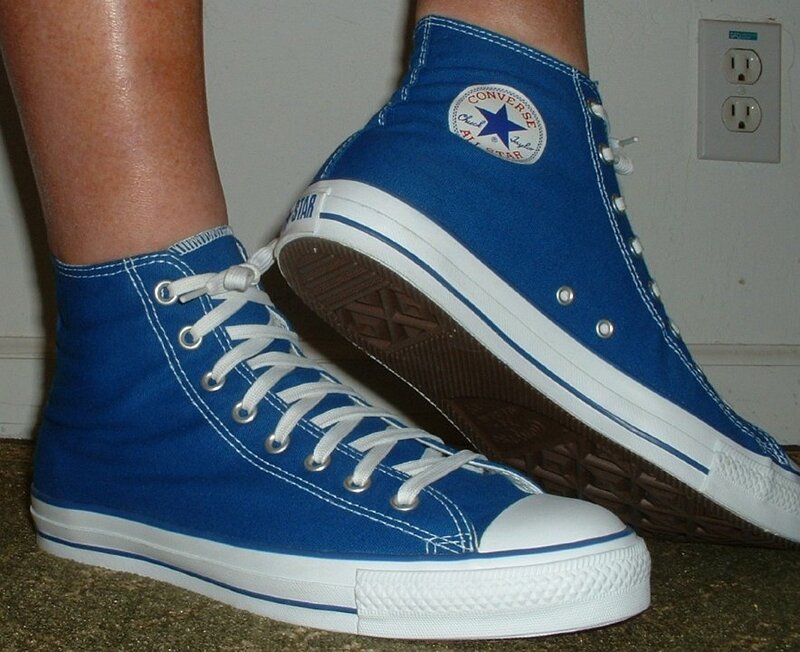 183 Blue High Top Chucks Angled frontr view of royal blue high top chucks. 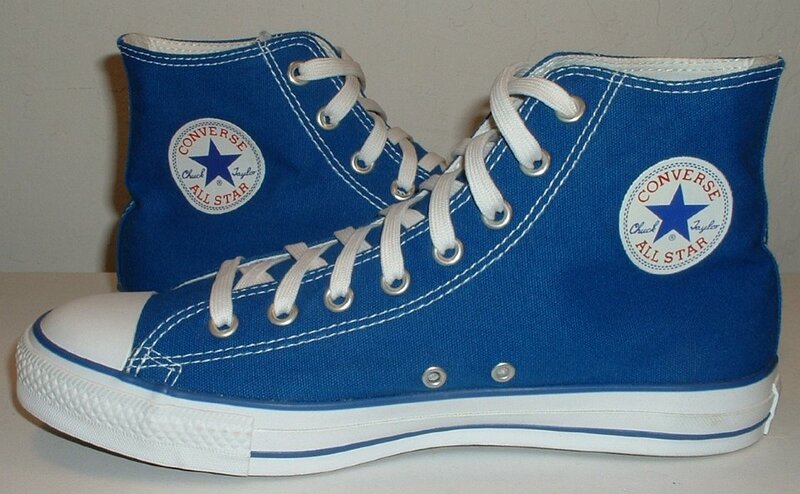 184 Blue High Top Chucks Top view of royal blue high top chucks. 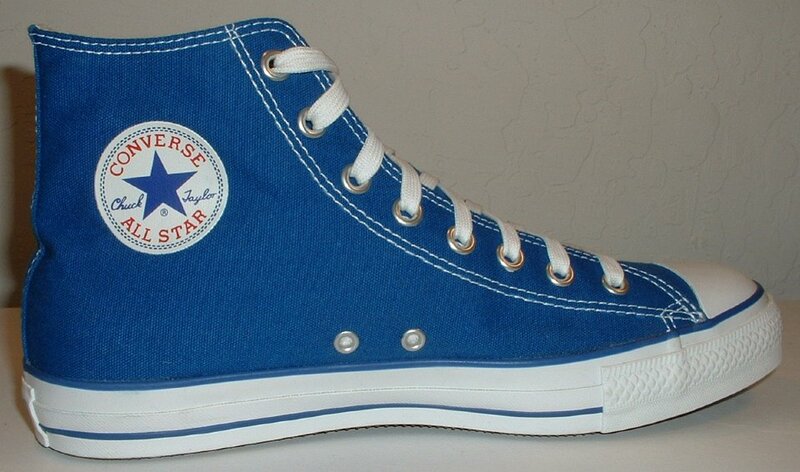 185 Blue High Top Chucks Inside patch views of royal blue high top chucks. 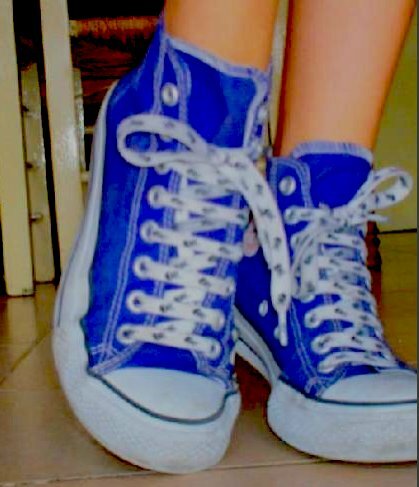 186 Blue High Top Chucks Outside views of royal blue high top chucks. 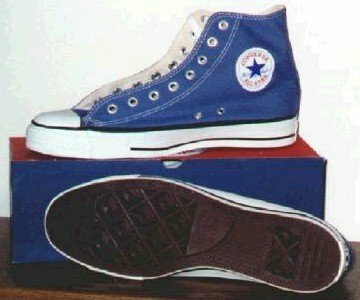 187 Blue High Top Chucks Inside patch and sole views of royal blue high top chucks. 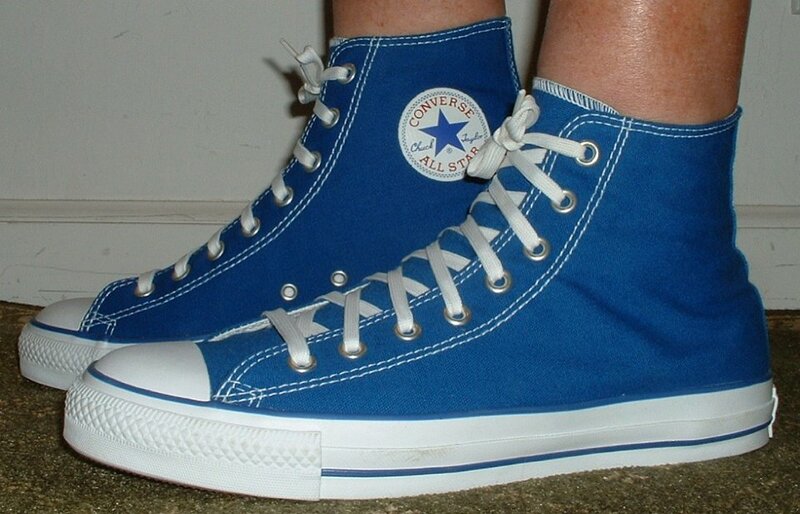 188 Blue High Top Chucks Wearing royal blue high tops, front view shot 1. 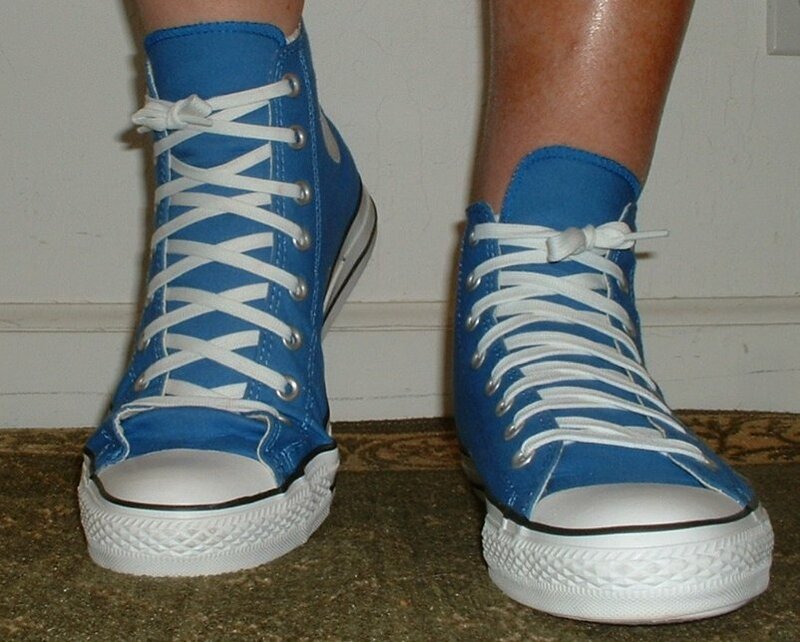 189 Blue High Top Chucks Wearing royal blue high tops, front view shot 2. 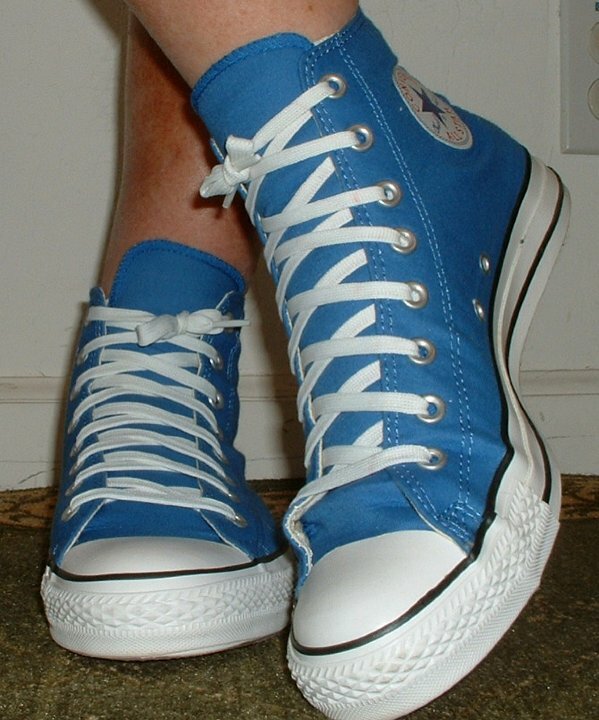 190 Blue High Top Chucks Wearing royal blue high tops, front view shot 3. 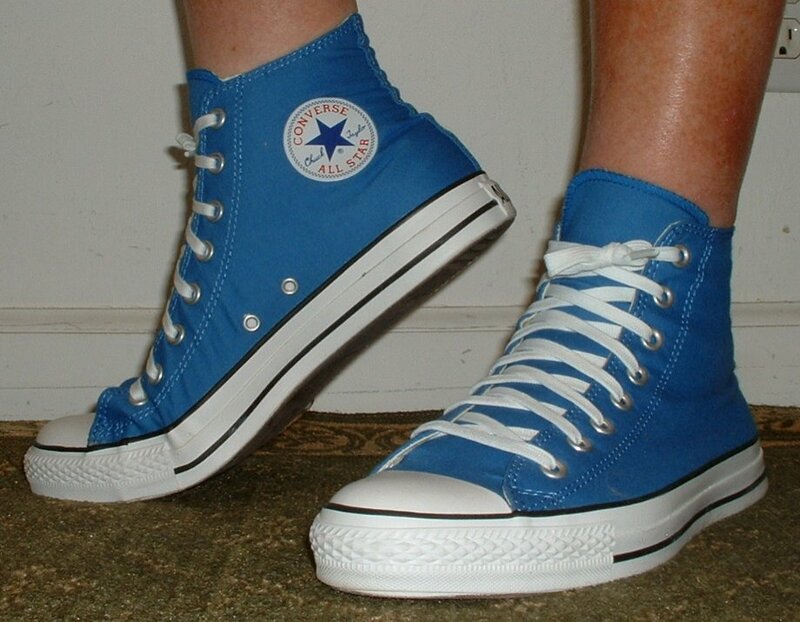 191 Blue High Top Chucks Wearing royal blue high tops, front view shot 4. 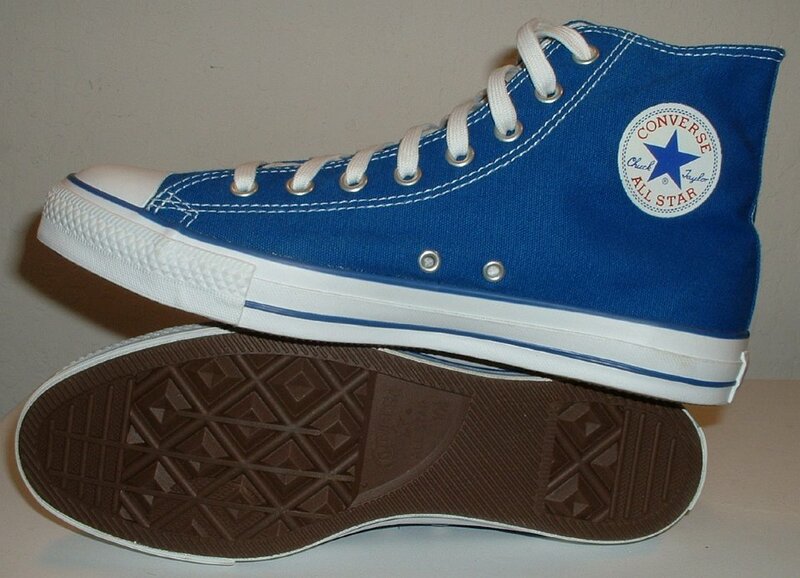 192 Blue High Top Chucks Wearing royal blue high tops, right side view shot 1. 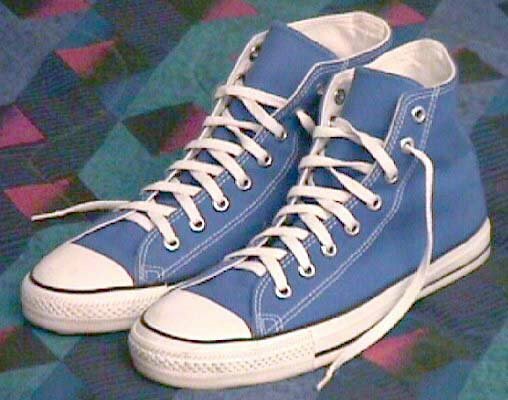 193 Blue High Top Chucks Wearing royal blue high tops, right side view shot 2. 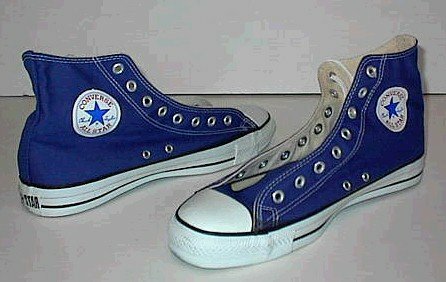 194 Blue High Top Chucks Wearing royal blue high tops, rear view shot 1. 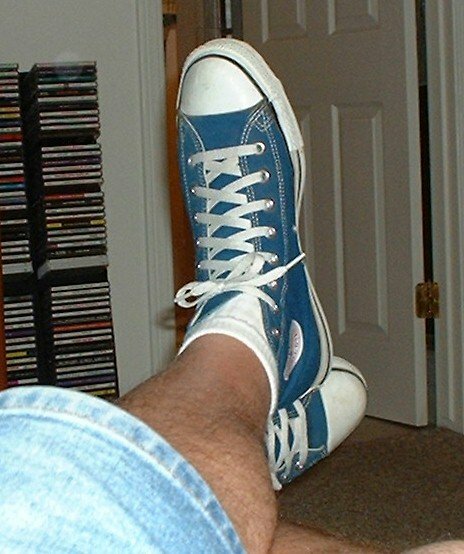 195 Blue High Top Chucks Wearing royal blue high tops, rear view shot 2. 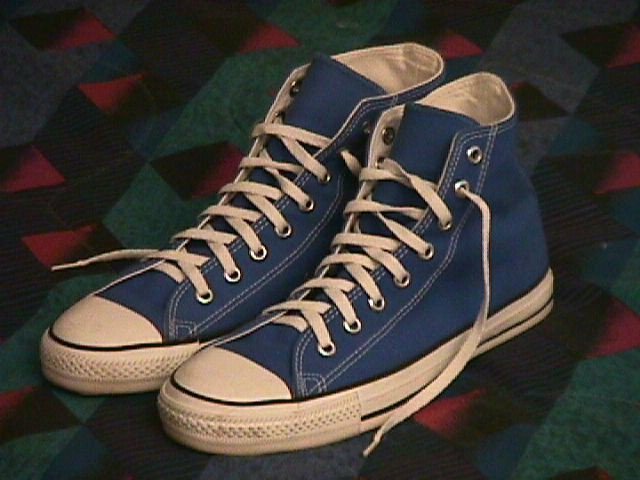 196 Blue High Top Chucks Wearing royal blue high tops, rear view shot 3. 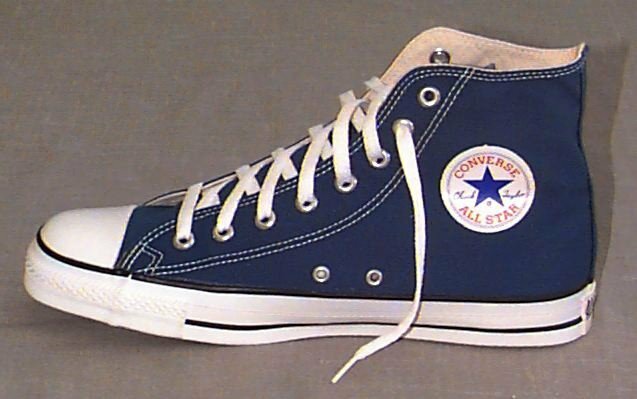 197 Blue High Top Chucks Wearing royal blue high tops, left side view shot 1. 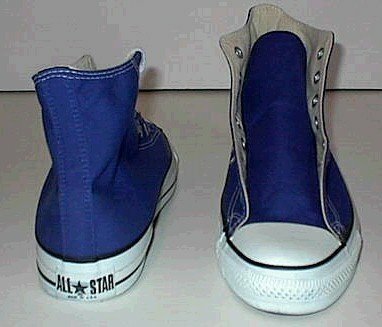 198 Blue High Top Chucks Wearing royal blue high tops, left side view shot 2. 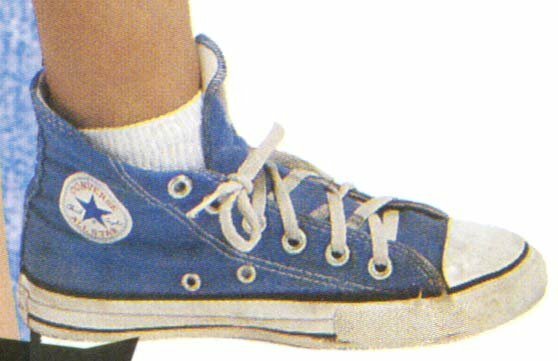 199 Blue High Top Chucks Wearing royal blue high tops, inside patch view. 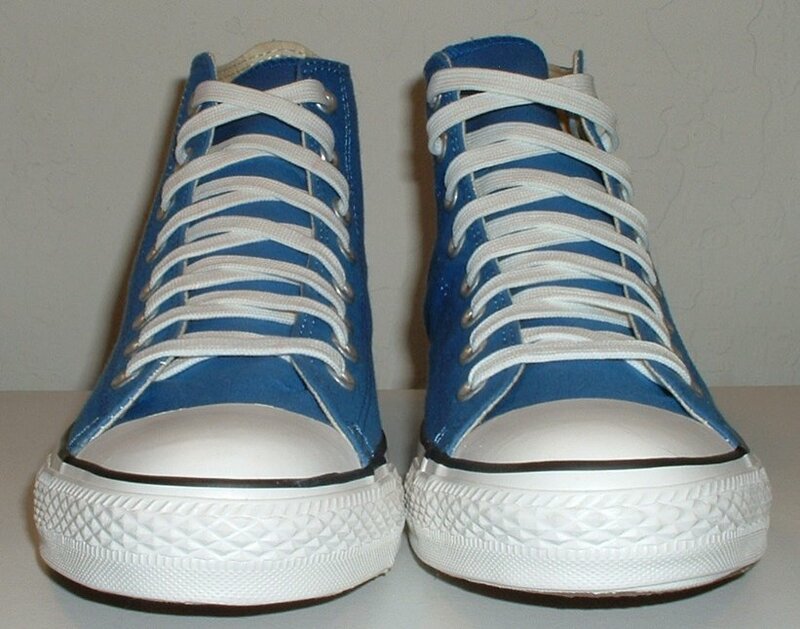 200 Blue High Top Chucks Angled side view of royal blue high top chucks. 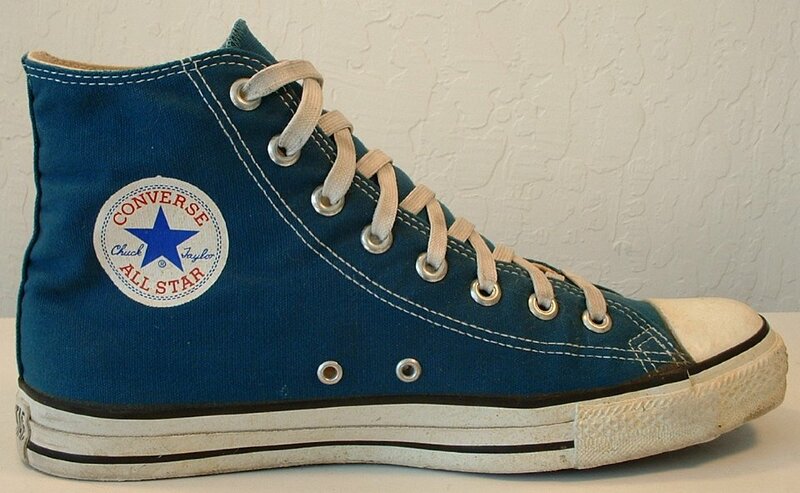 202 Blue High Top Chucks Inside patch view of a left vintage blue high top. 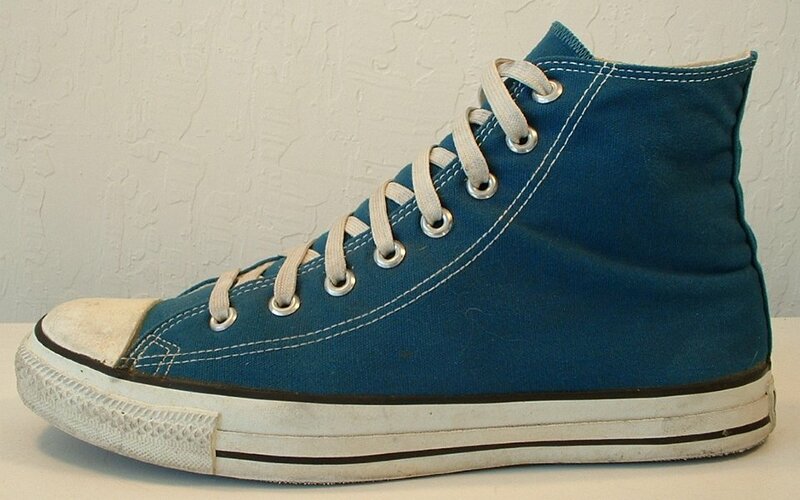 203 Blue High Top Chucks Side views of vintage blue high tops. 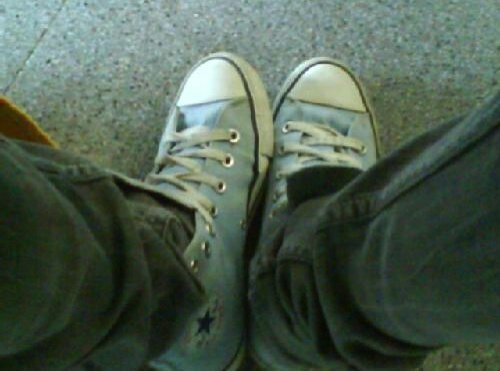 205 Blue High Top Chucks Wearing sky blue high top chucks. 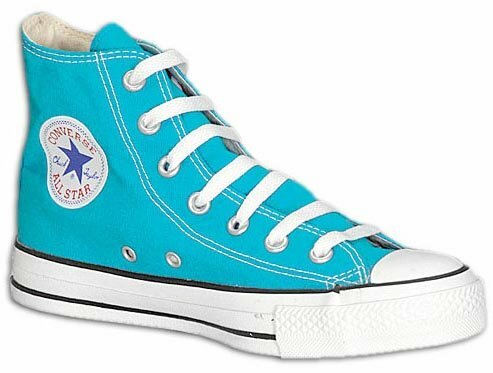 206 Blue High Top Chucks Angled inside patch view of a left turquoise high top. 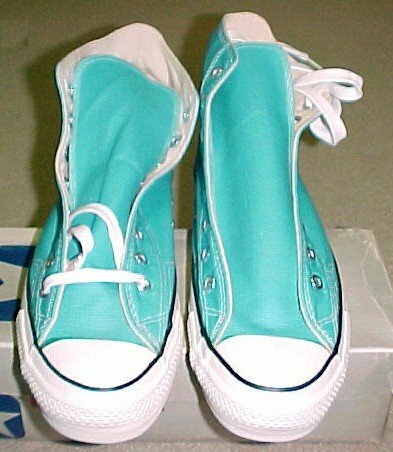 207 Blue High Top Chucks Rear and inside patch views of turquoise high tops. 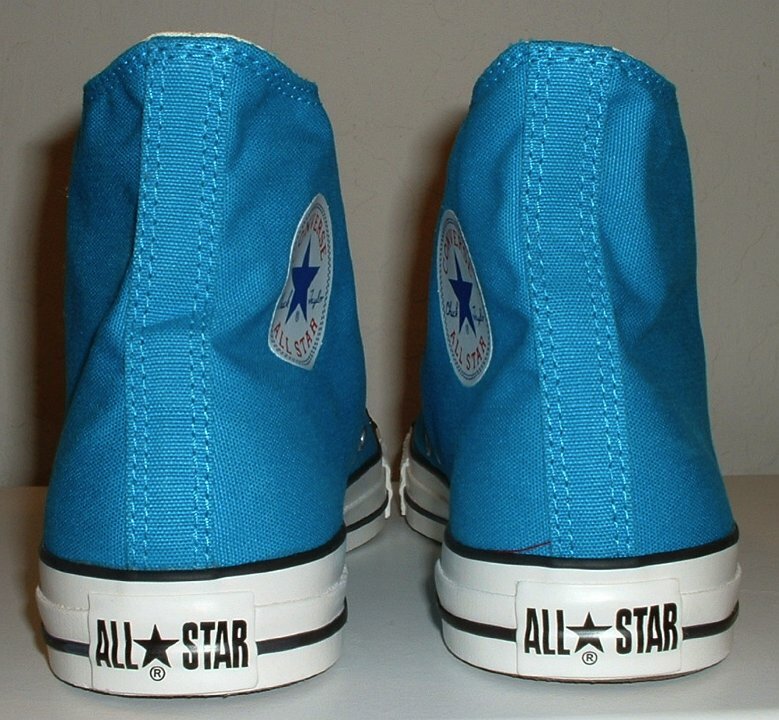 208 Blue High Top Chucks Rear and inside patch views of turquoise high tops. 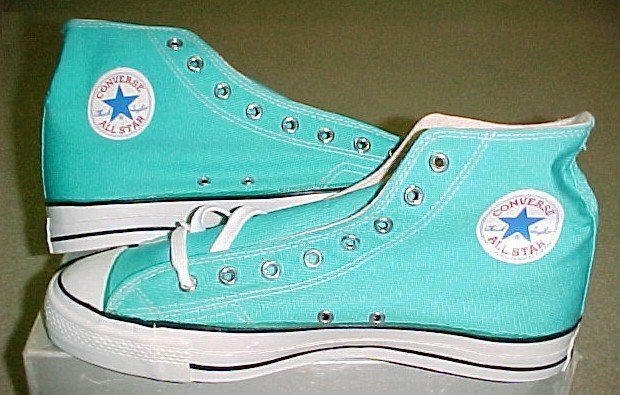 209 Blue High Top Chucks Outside and inside patch views of turquoise high top. 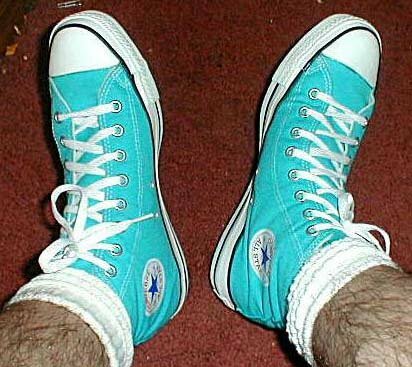 210 Blue High Top Chucks Inside patch views of turquoise high top. 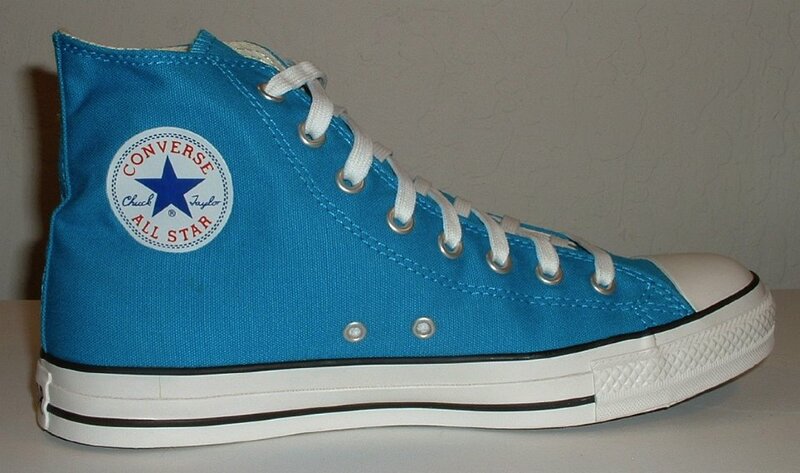 211 Blue High Top Chucks Front view of new unlaced turquoise high top. 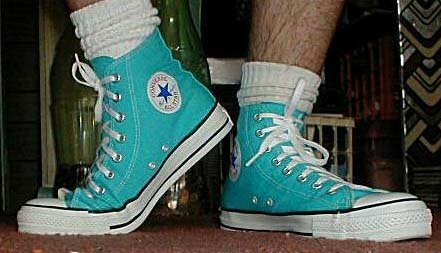 212 Blue High Top Chucks Inside patch views of turquoise high top. 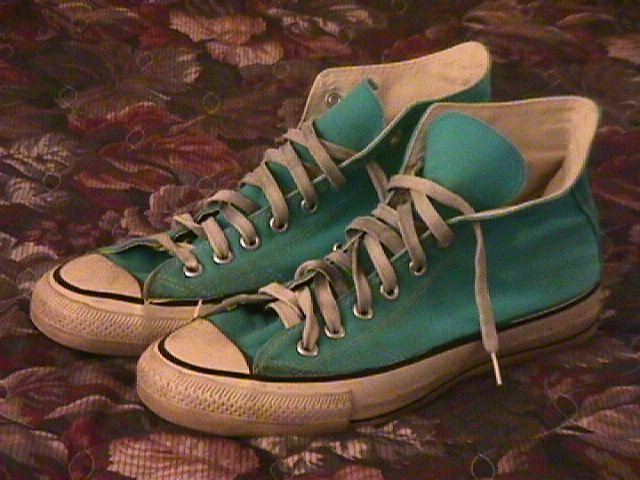 213 Blue High Top Chucks Rear view of turquoise high top. 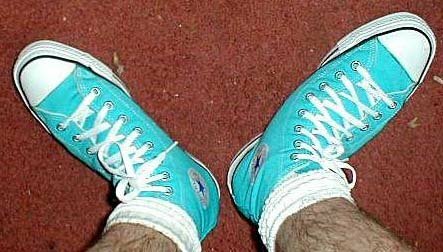 214 Blue High Top Chucks Wearing turquoise high tops, top view 1. 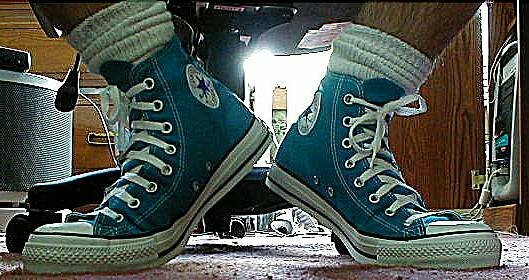 215 Blue High Top Chucks Wearing turquoise high tops, top view 2. 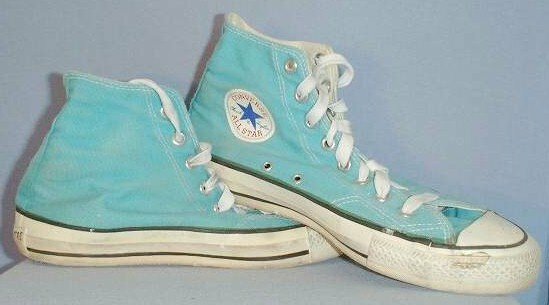 216 Blue High Top Chucks Wearing turquoise high tops, top view 3. 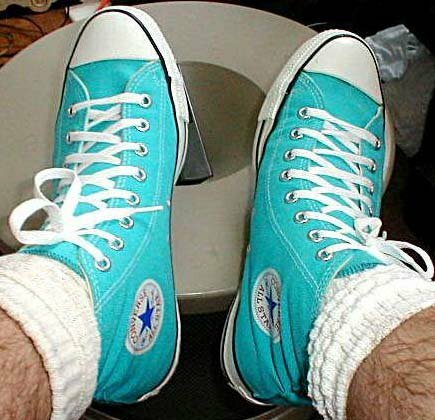 217 Blue High Top Chucks Wearing turquoise high tops, inside views. 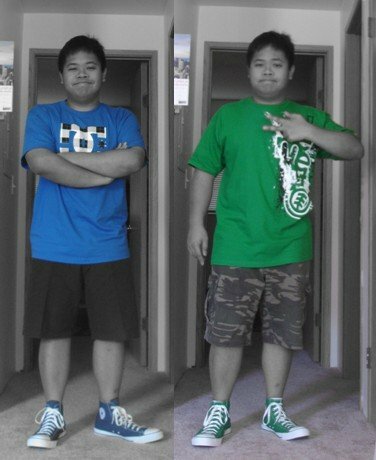 218 Blue High Top Chucks Twins wearing blue and green high top chucks. 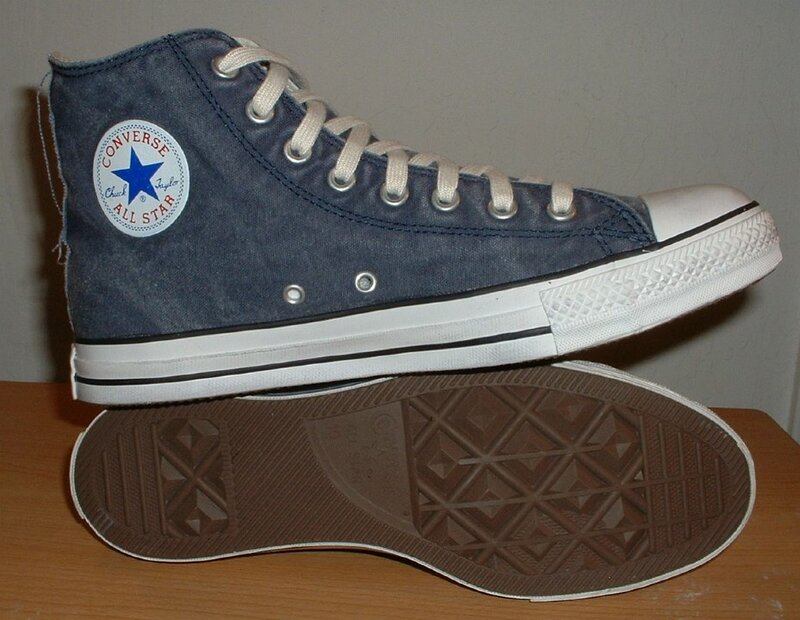 219 Blue High Top Chucks Inside patch view of a left Victoria blue high top. 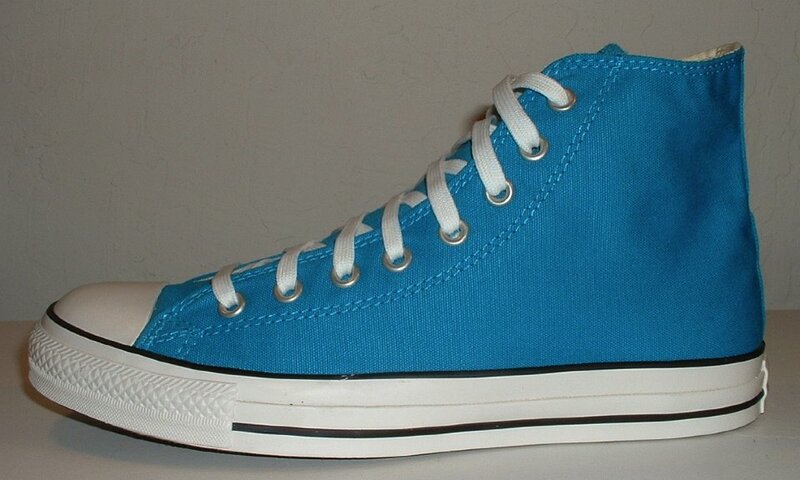 220 Blue High Top Chucks Outside view of a left Victoria blue high top. 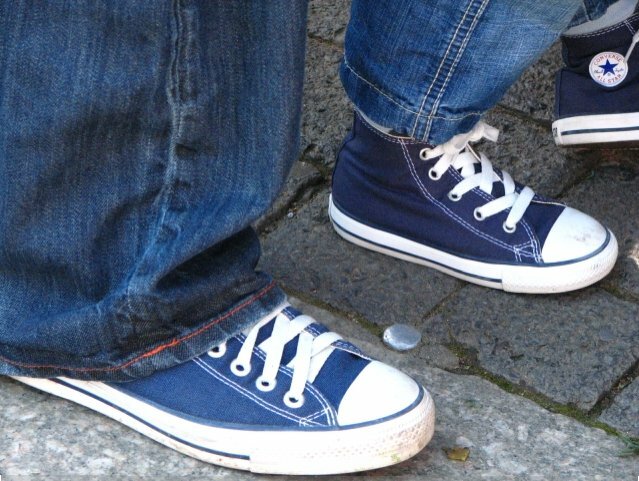 221 Blue High Top Chucks Inside patch view of a right Victoria blue high top. 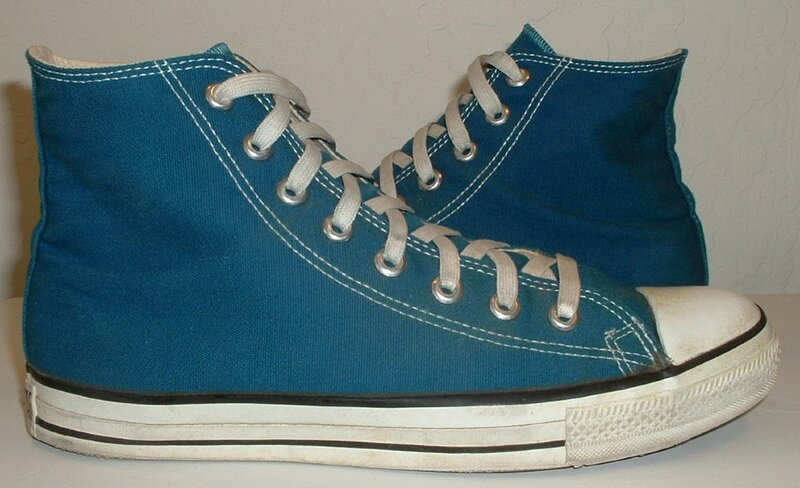 222 Blue High Top Chucks Outside view of a right Victoria blue high top. 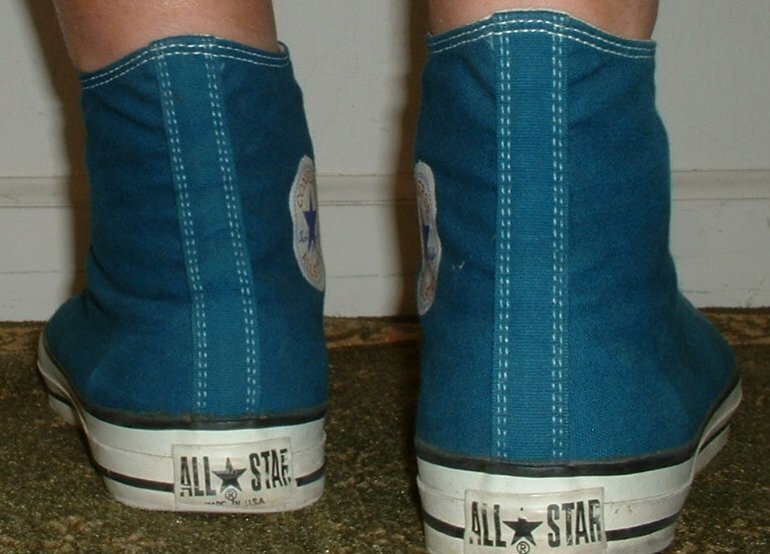 223 Blue High Top Chucks Rear view of Victoria blue high tops. 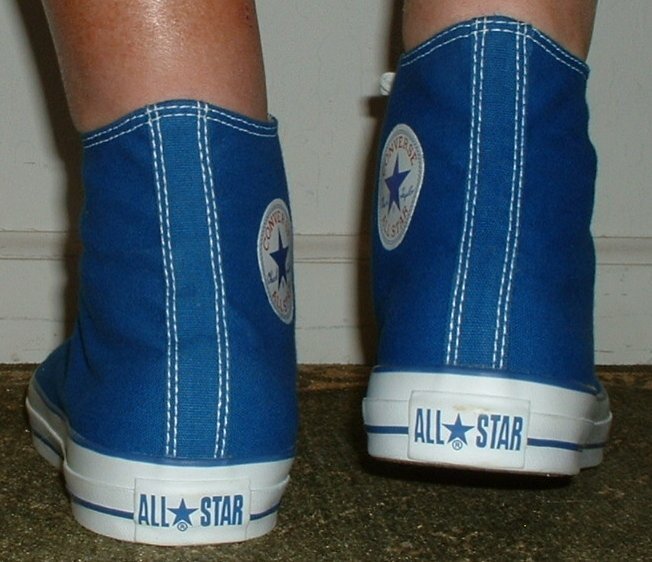 224 Blue High Top Chucks Angled rear view of Victoria blue high tops. 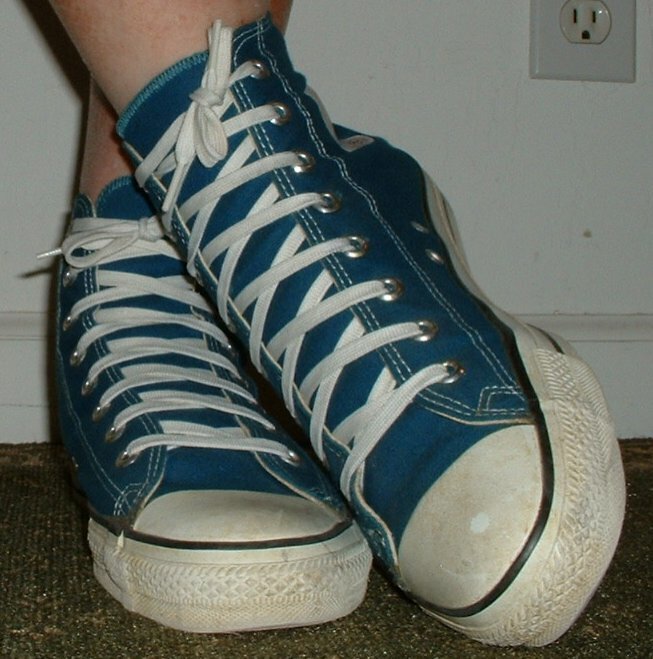 225 Blue High Top Chucks Angled side view of Victoria blue high tops. 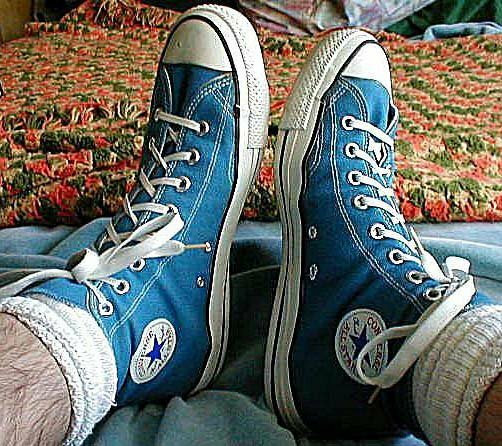 226 Blue High Top Chucks Front view of Victoria blue high tops. 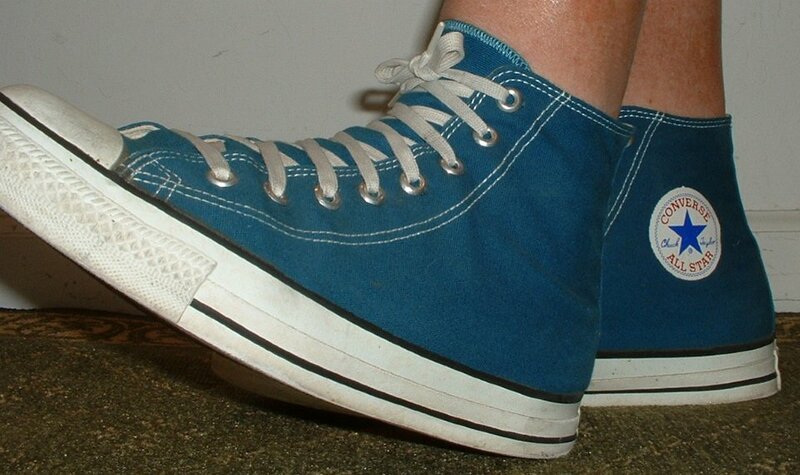 227 Blue High Top Chucks Angled front view of Victoria blue high tops. 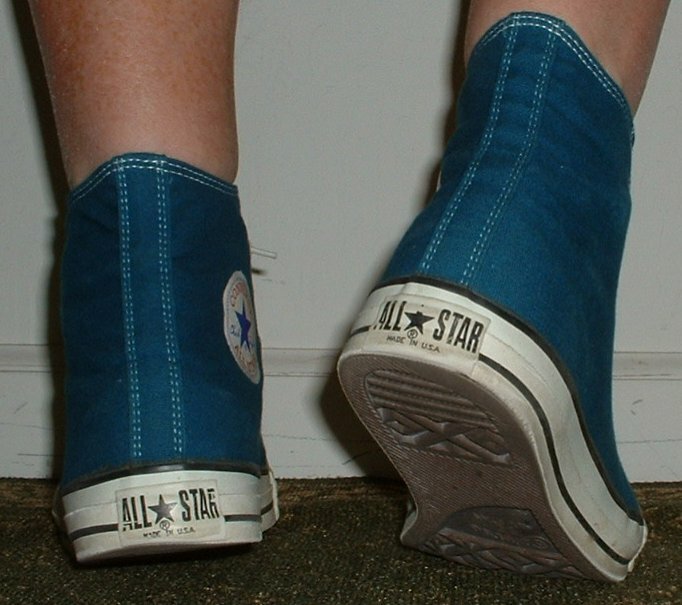 228 Blue High Top Chucks Top view of Victoria blue high tops. 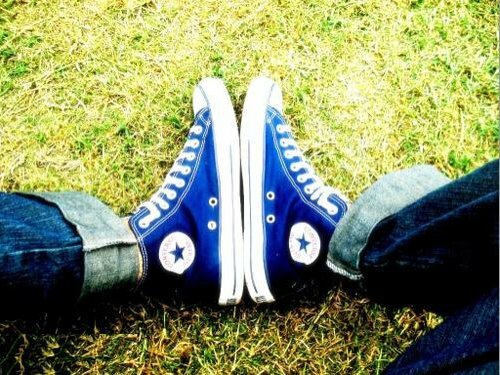 229 Blue High Top Chucks Inside ptach views of Victoria blue high tops. 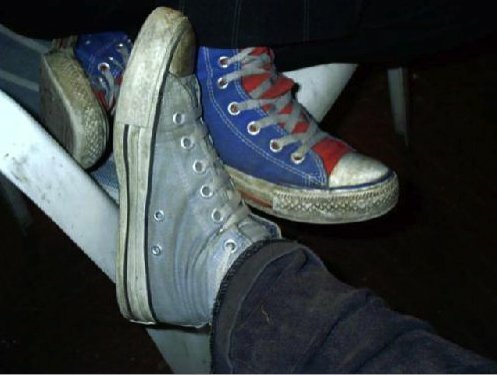 230 Blue High Top Chucks Inside ptach and sole views of Victoria blue high tops. 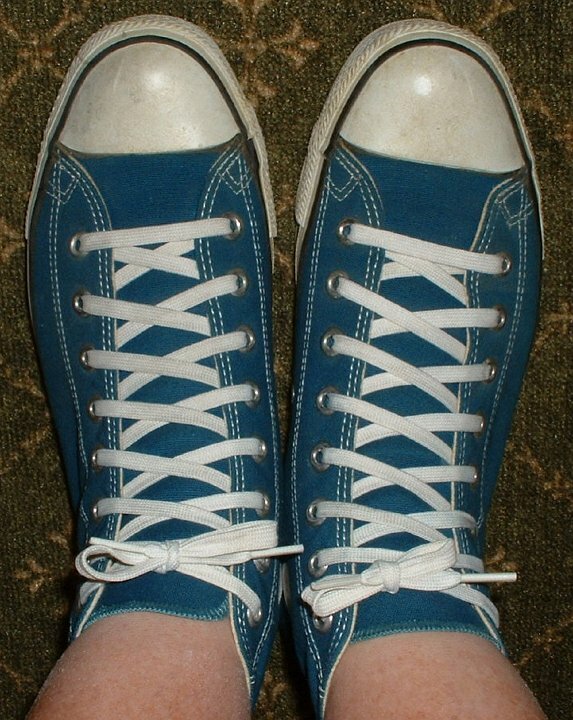 231 Blue High Top Chucks Wearing Victoria blue high tops, front view shot 1. 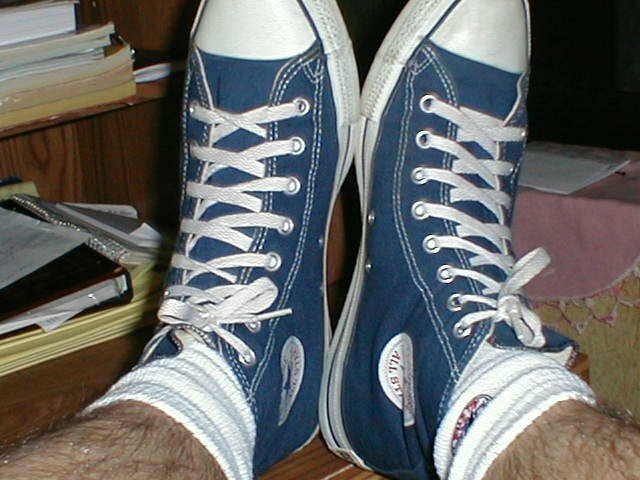 232 Blue High Top Chucks Wearing Victoria blue high tops, front view shot 2. 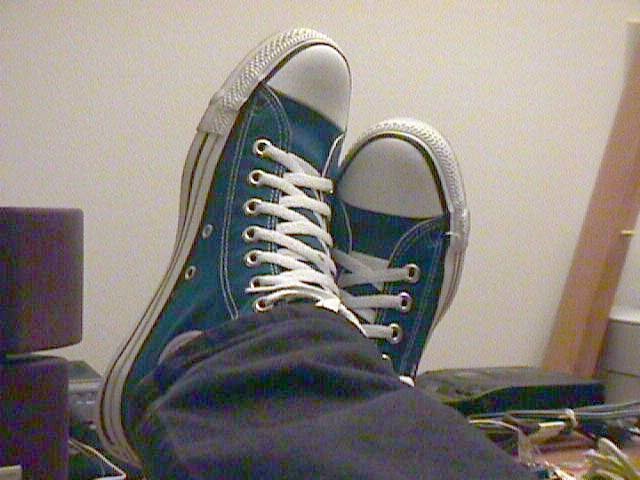 233 Blue High Top Chucks Wearing Victoria blue high tops, front view shot 3. 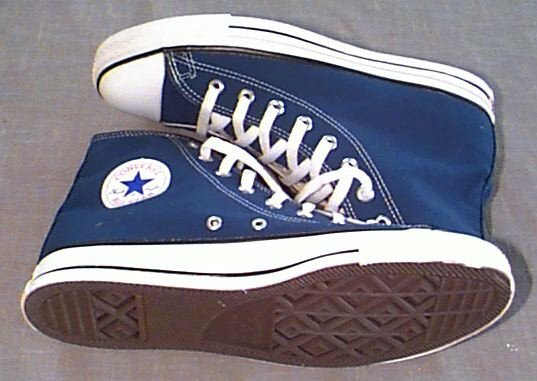 234 Blue High Top Chucks Wearing Victoria blue high tops, left side view shot 1. 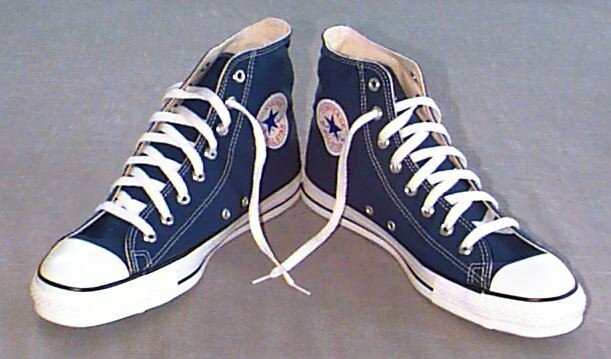 235 Blue High Top Chucks Wearing Victoria blue high tops, left side view shot 2. 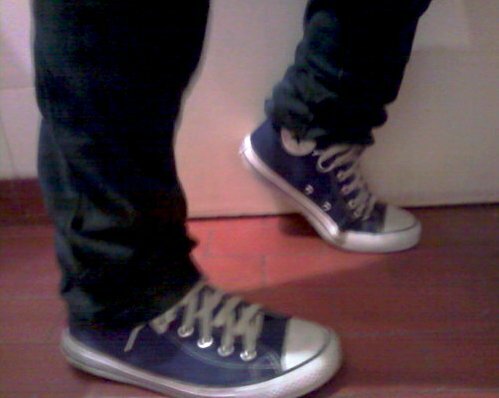 236 Blue High Top Chucks Wearing Victoria blue high tops, rear view shot 1. 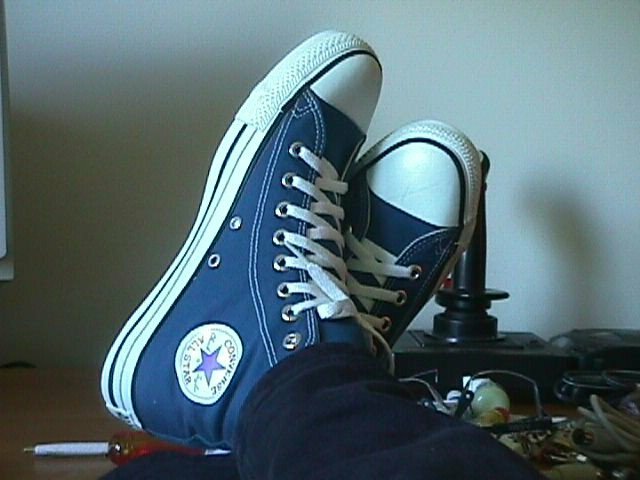 237 Blue High Top Chucks Wearing Victoria blue high tops, rear view shot 2. 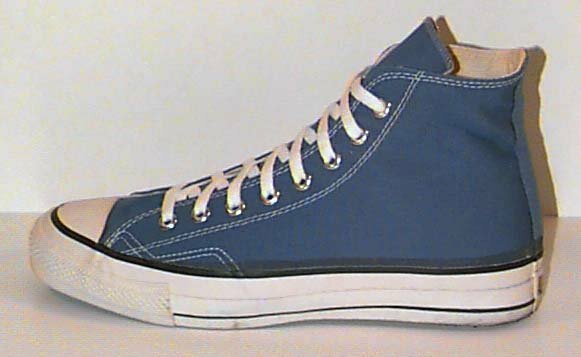 238 Blue High Top Chucks Wearing Victoria blue high tops, right side view shot 1. 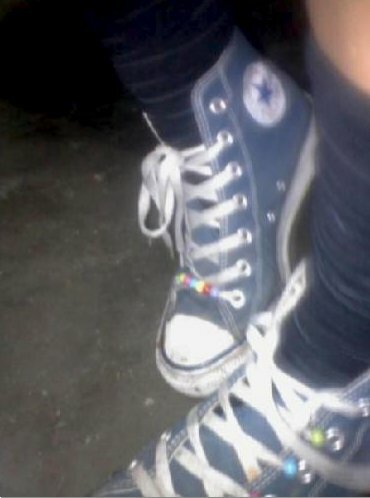 239 Blue High Top Chucks Wearing Victoria blue high tops, right side view shot 2. 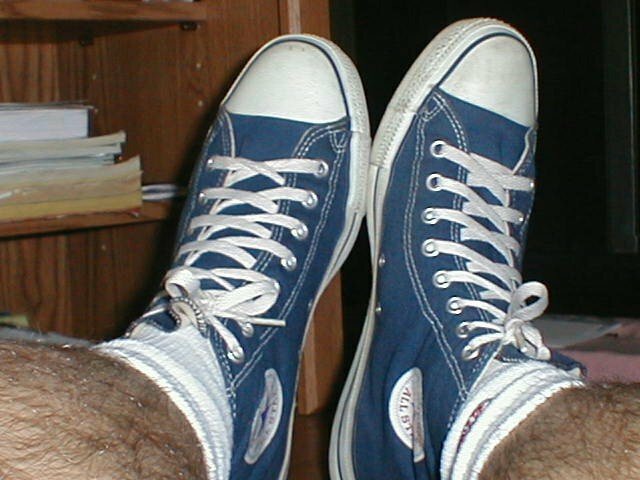 240 Blue High Top Chucks Wearing Victoria blue high tops, front view shot 4. 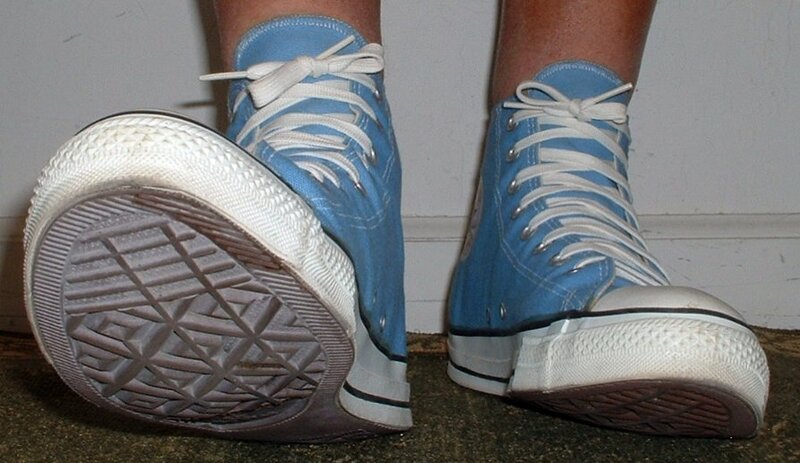 241 Blue High Top Chucks Wearing new blue high tops, top view. 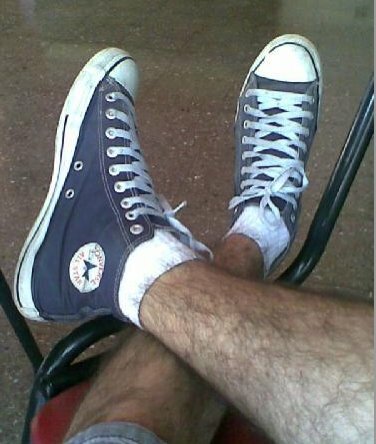 242 Blue High Top Chucks Seated wearing worn navy blue high top chucks. 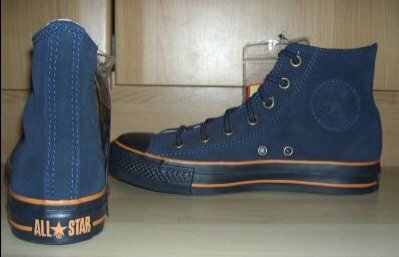 243 Blue High Top Chucks Stepping out in new navy blue high tops, top view. 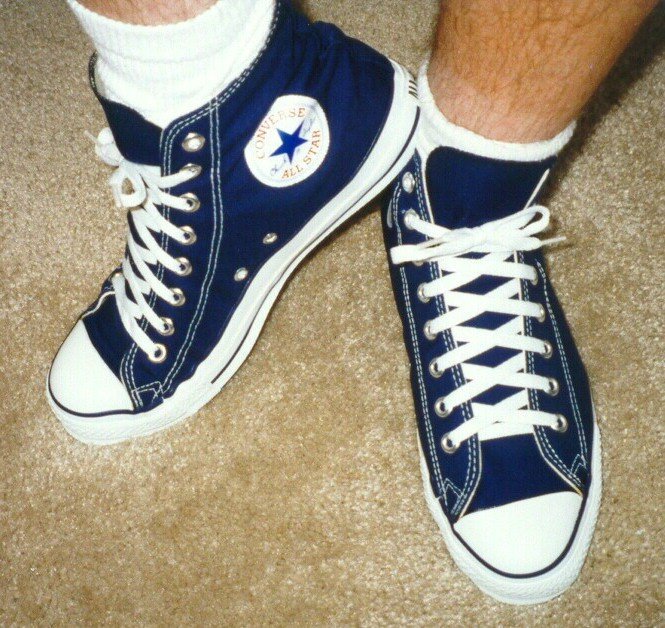 244 Blue High Top Chucks Wearing navy blue high top chucks. 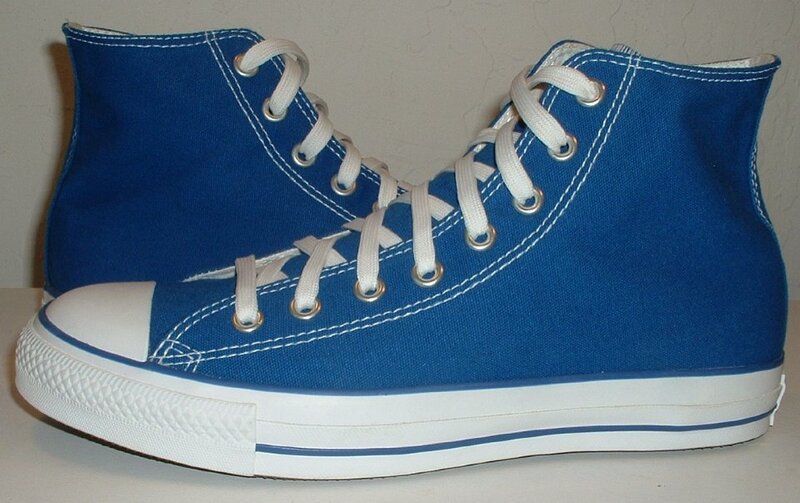 245 Blue High Top Chucks Wearing royal blue high tops with triangle lacing, top view. 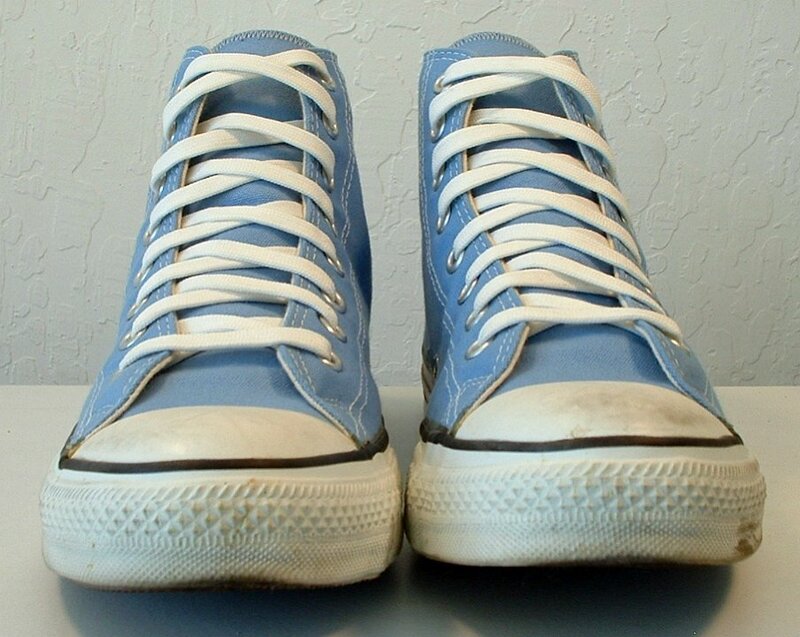 246 Blue High Top Chucks Wearing well worn blue high tops. 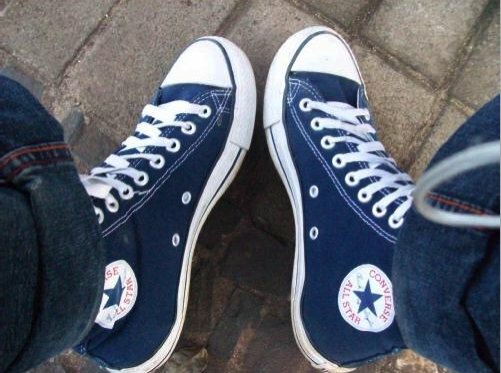 247 Blue High Top Chucks Wearing navy blue high top chucks. 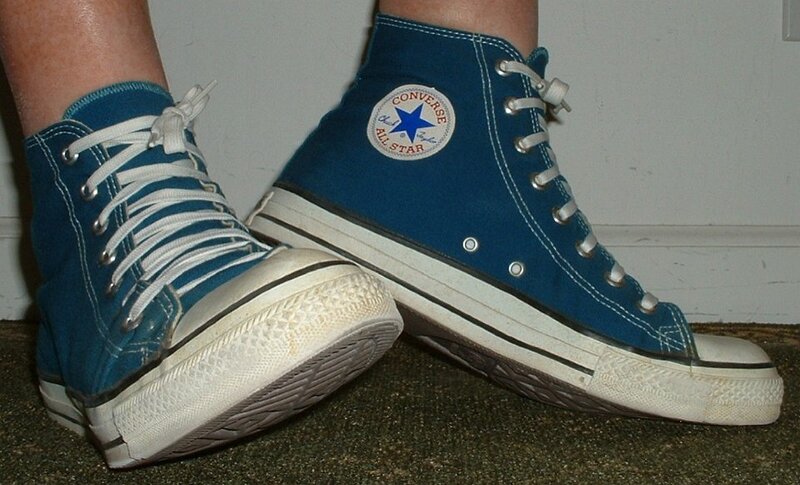 248 Blue High Top Chucks Teen and kid wearing blue high top chucks. 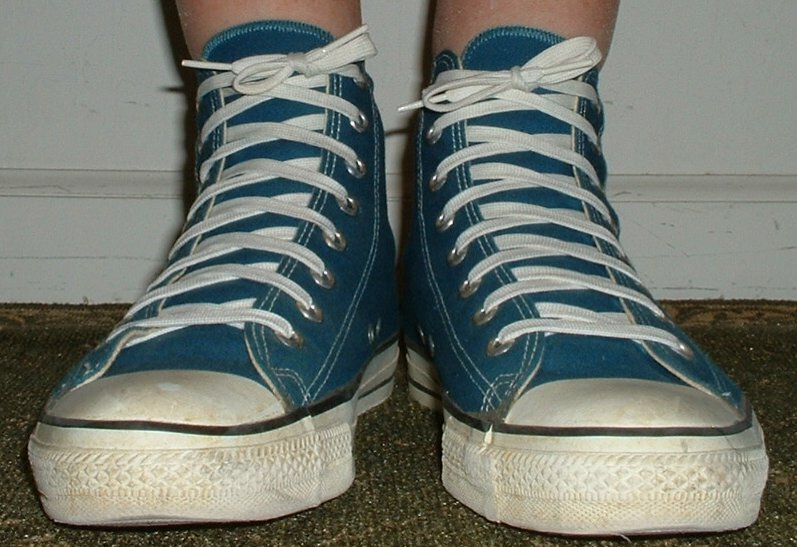 249 Blue High Top Chucks Wearing navy blue high tops. 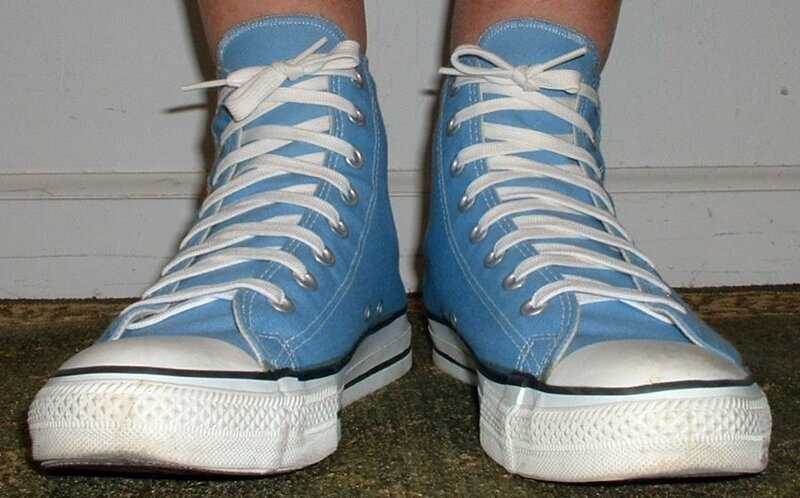 251 Blue High Top Chucks Walking in blue high top chucks. 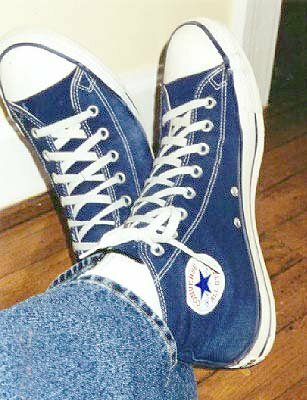 253 Blue High Top Chucks Relaxing in navy blue high tops. 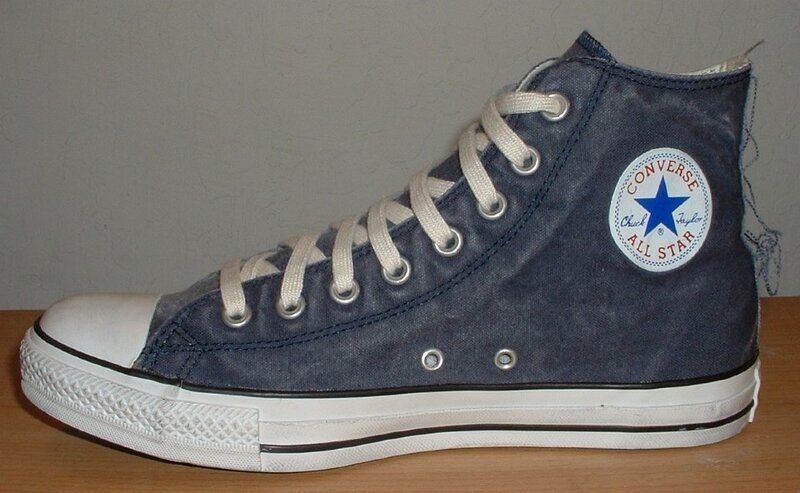 254 Blue High Top Chucks Wearing navy blue high tops, top view. 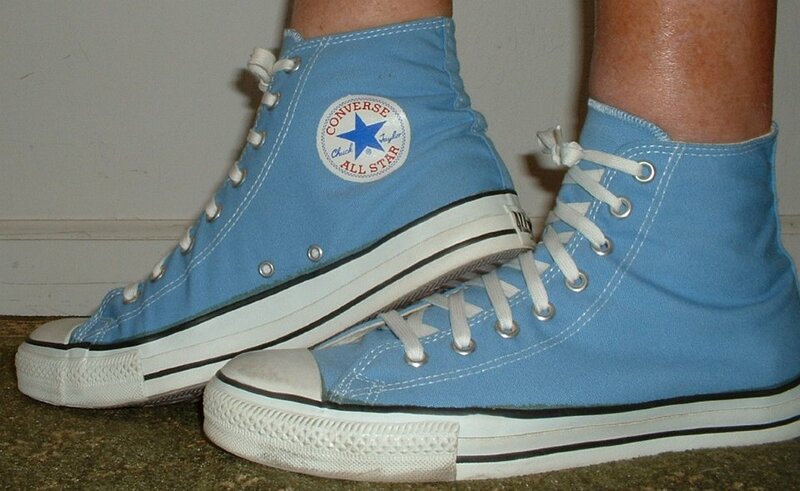 256 Blue High Top Chucks Wearing new blue high tops, showing side patch, shot 1. 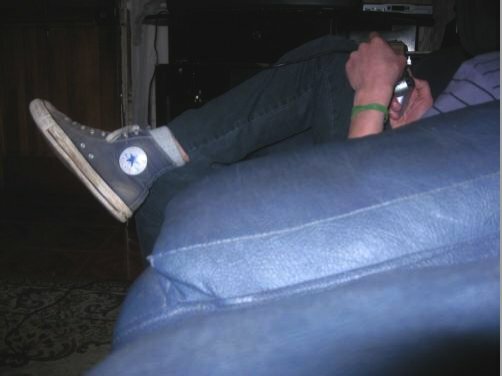 258 Blue High Top Chucks Relaxing in Navy Blue High Tops, shot 3. 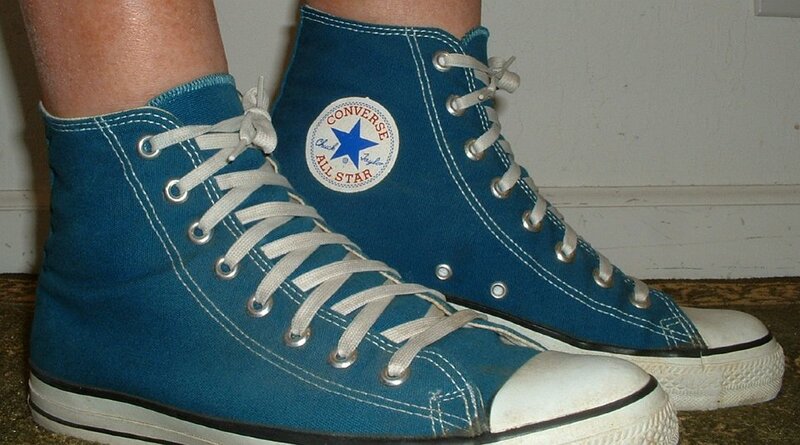 259 Blue High Top Chucks Rear view of someone wearing navy blue high top chucks. 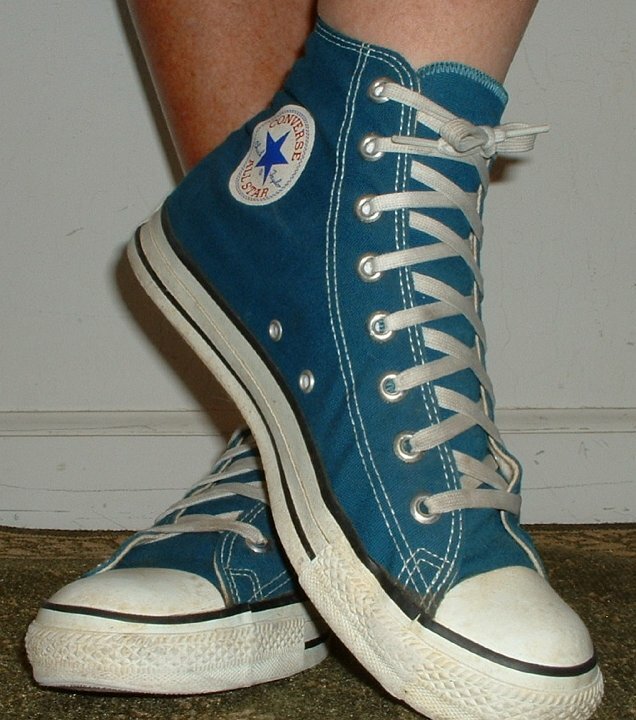 260 Blue High Top Chucks Wearing navy blue high top chucks. 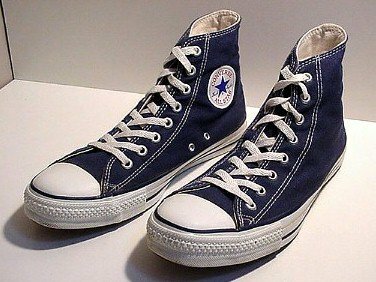 261 Blue High Top Chucks Wearing navy blue high tops. 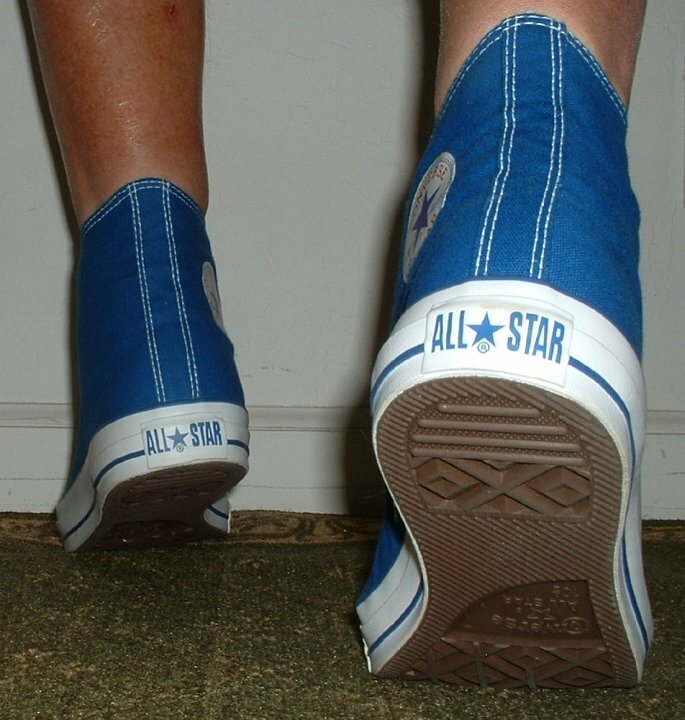 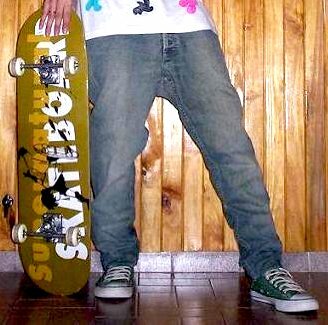 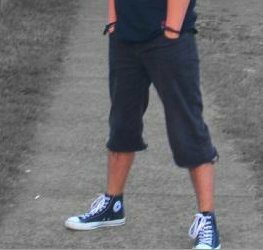 262 Blue High Top Chucks Skater wearing blue high top chucks. 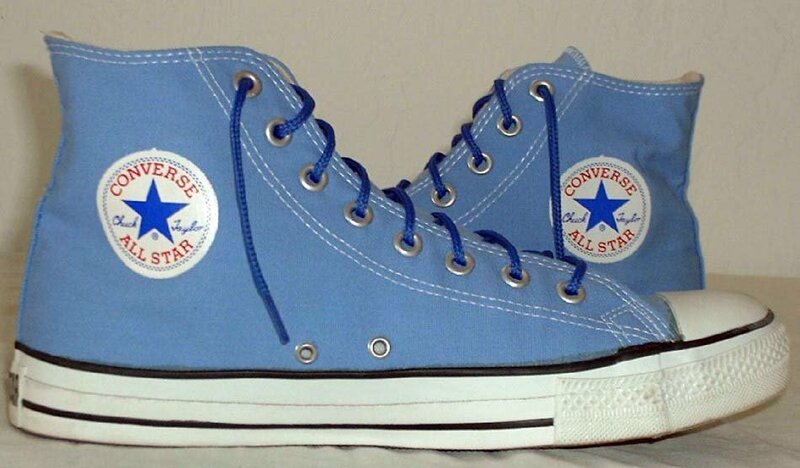 263 Blue High Top Chucks Blue high tops with beaded laces. 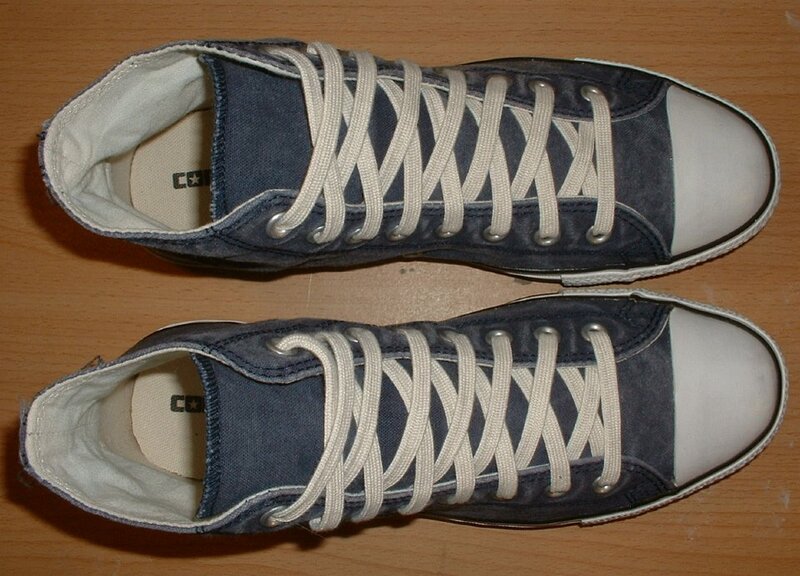 264 Blue High Top Chucks Wearing navy blue high tops, top view. 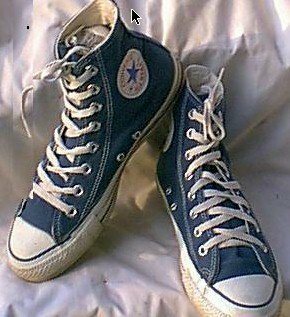 265 Blue High Top Chucks Wearing navy blue high tops. 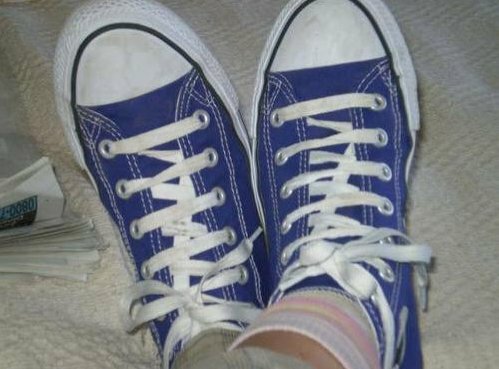 266 Blue High Top Chucks Wearing royal blue high tops with print shoelaces.